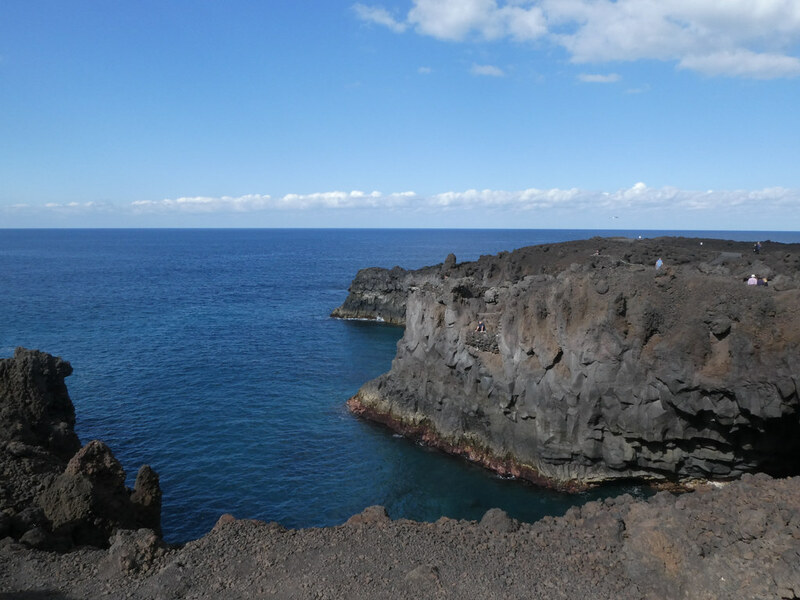 Why visit one island when you can visit two. 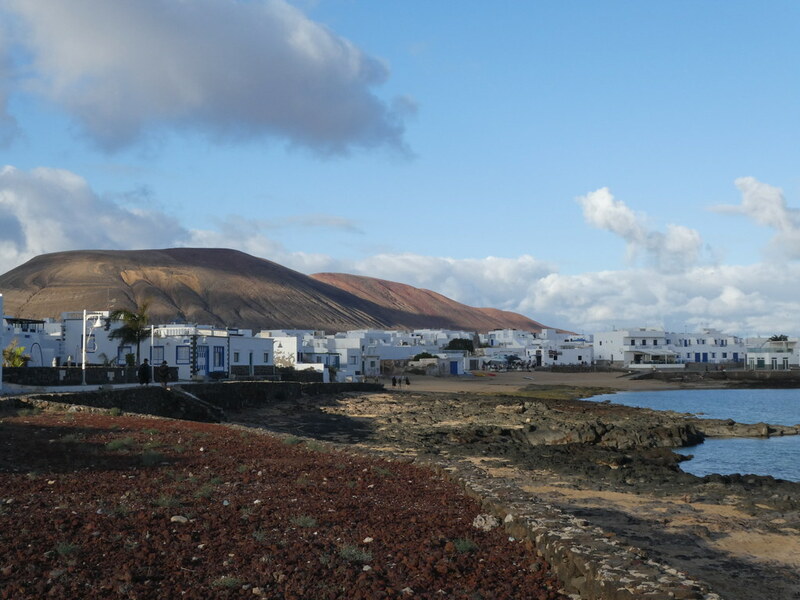 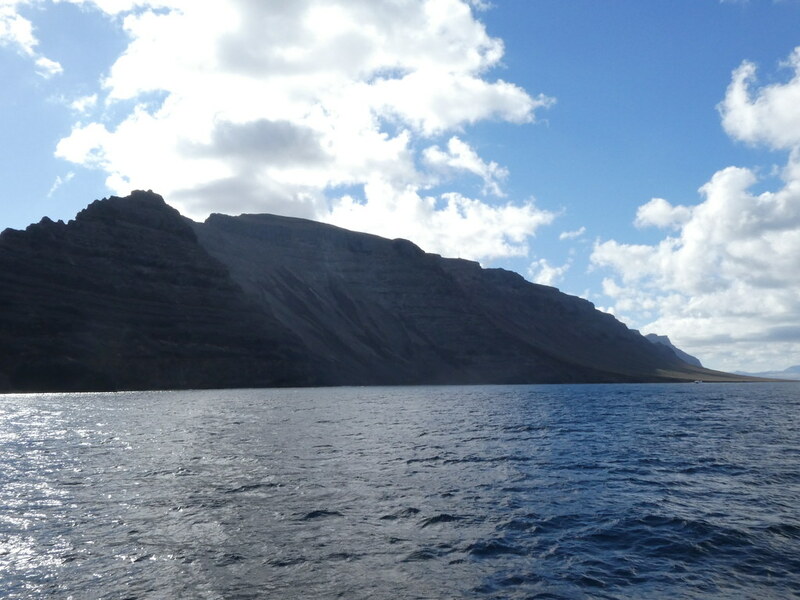 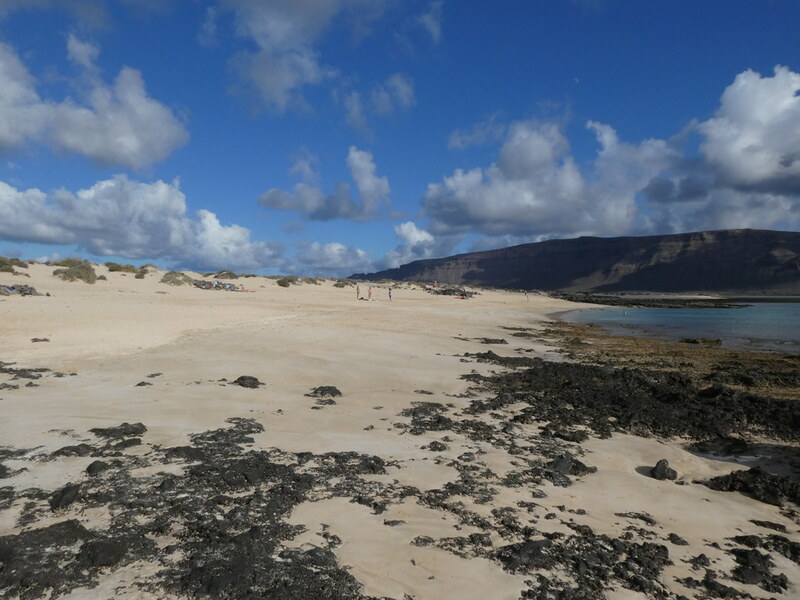 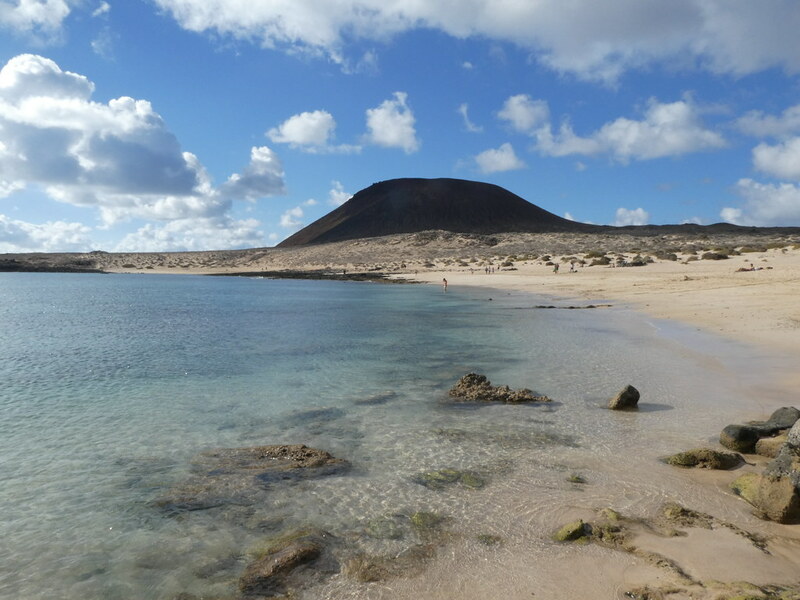 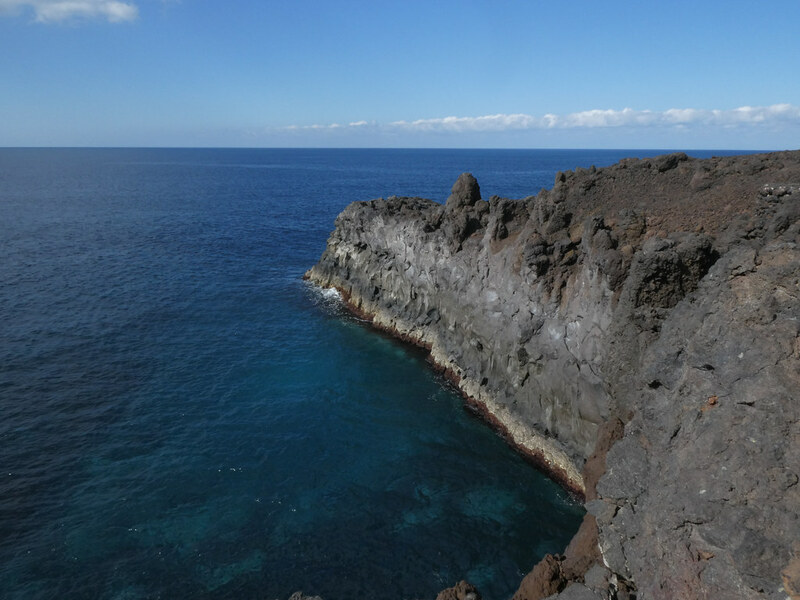 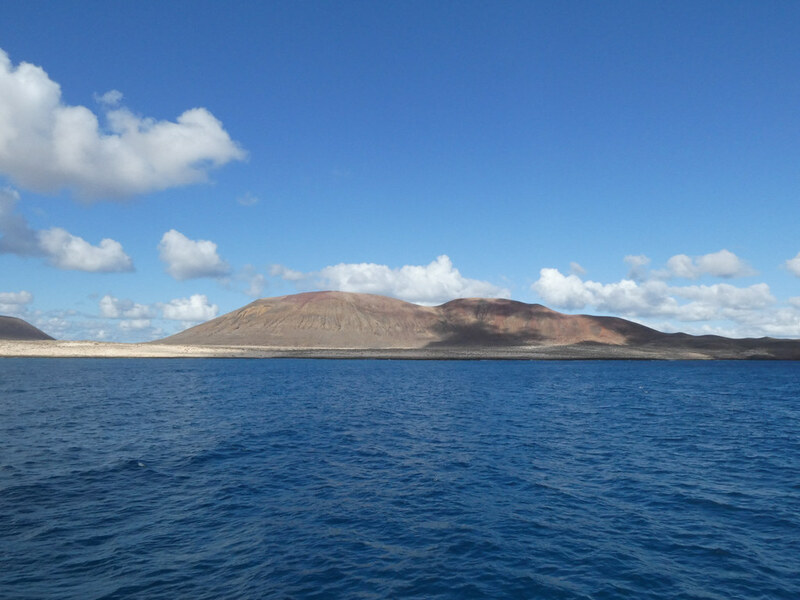 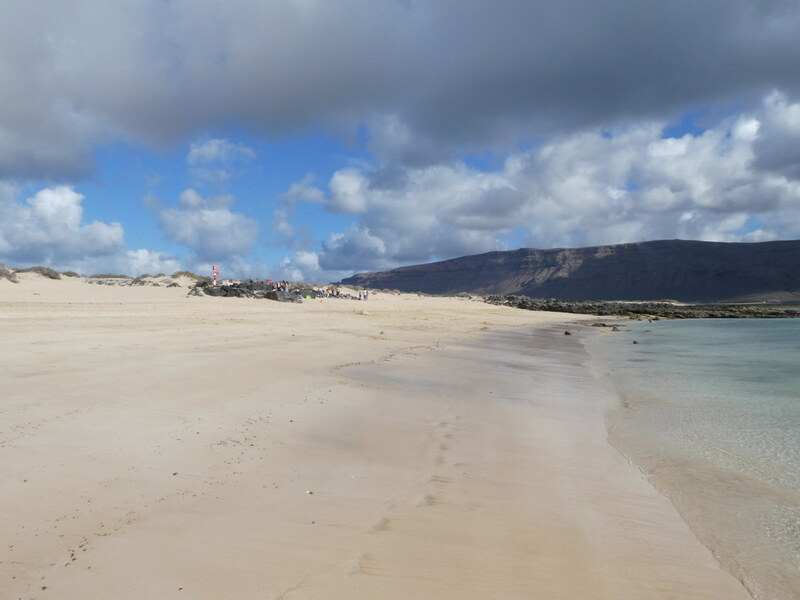 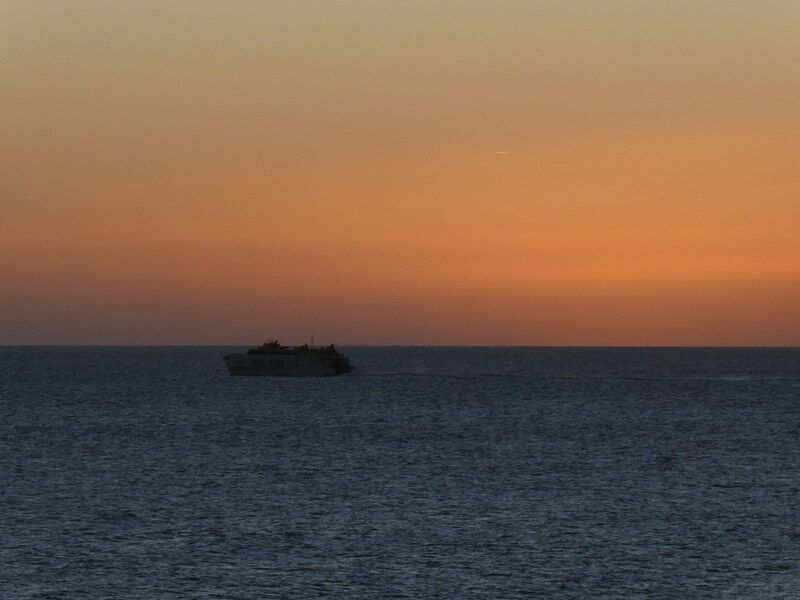 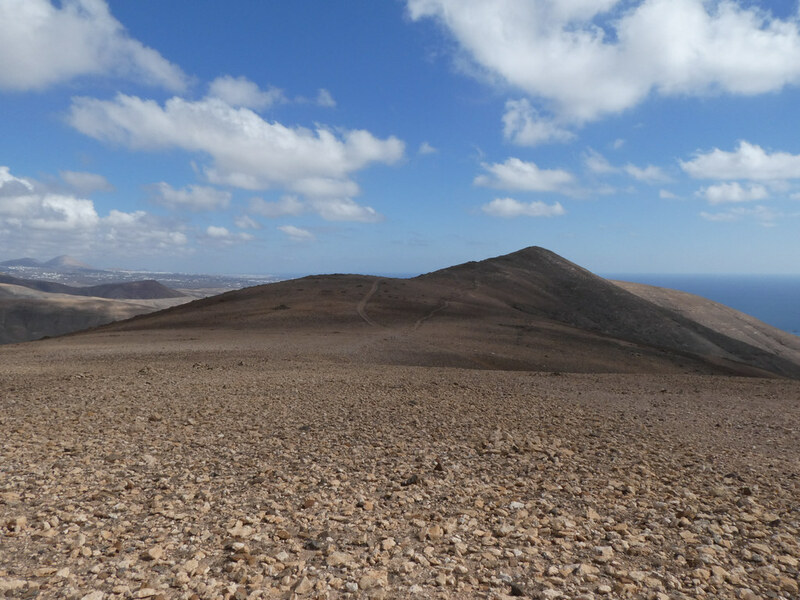 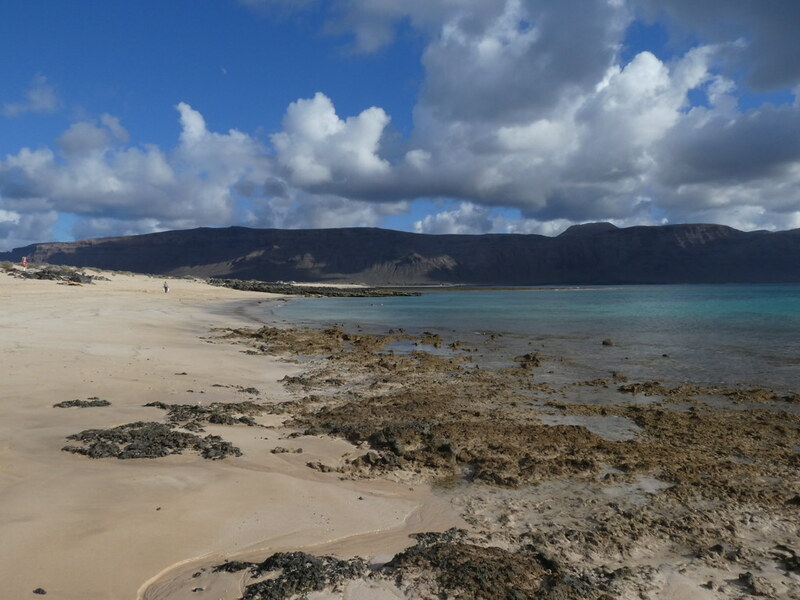 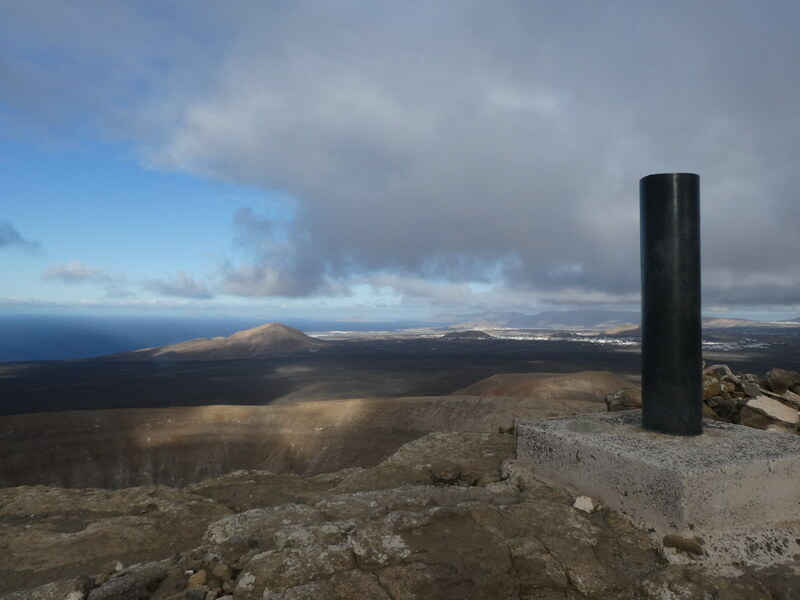 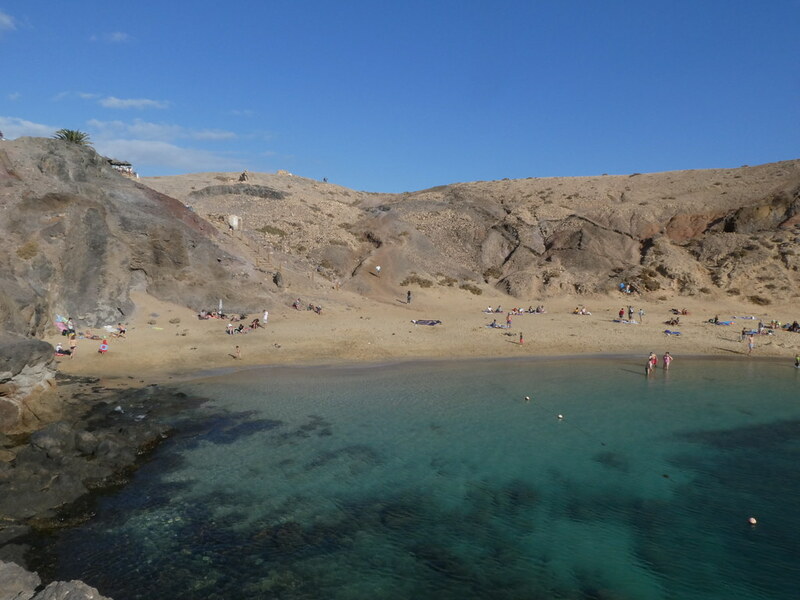 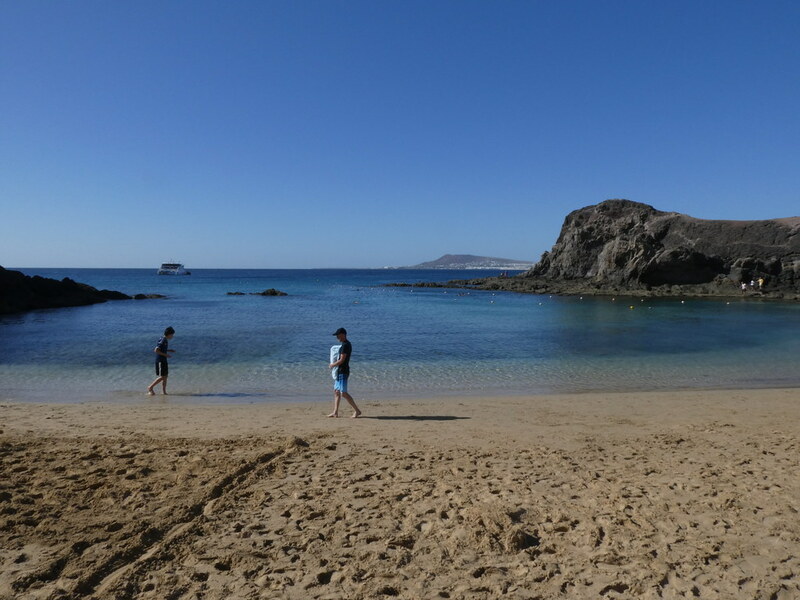 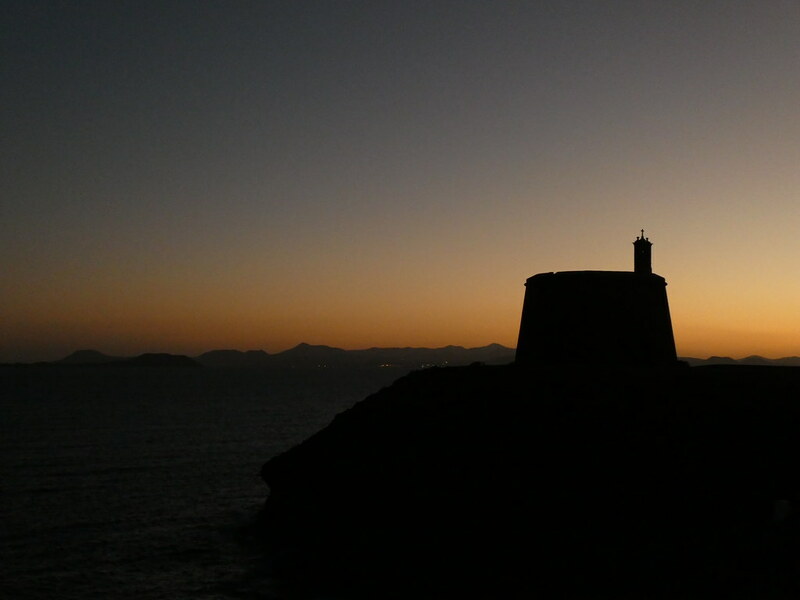 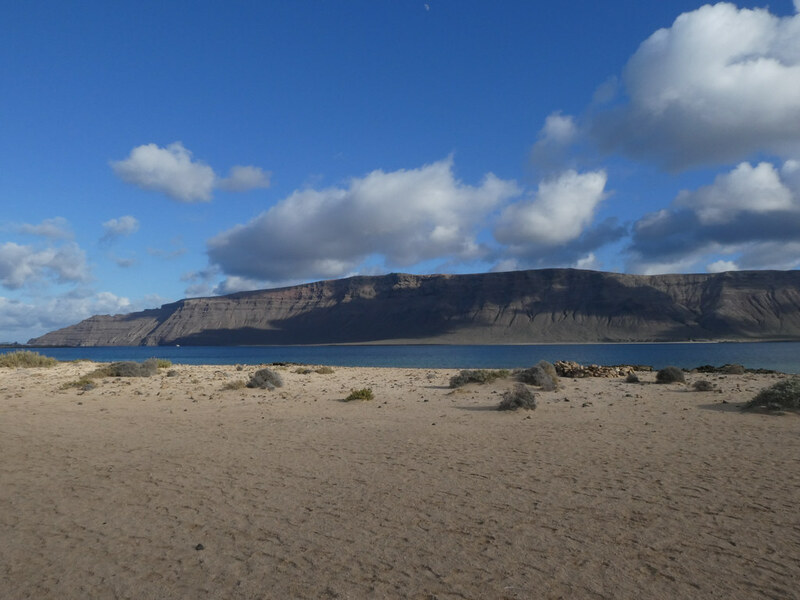 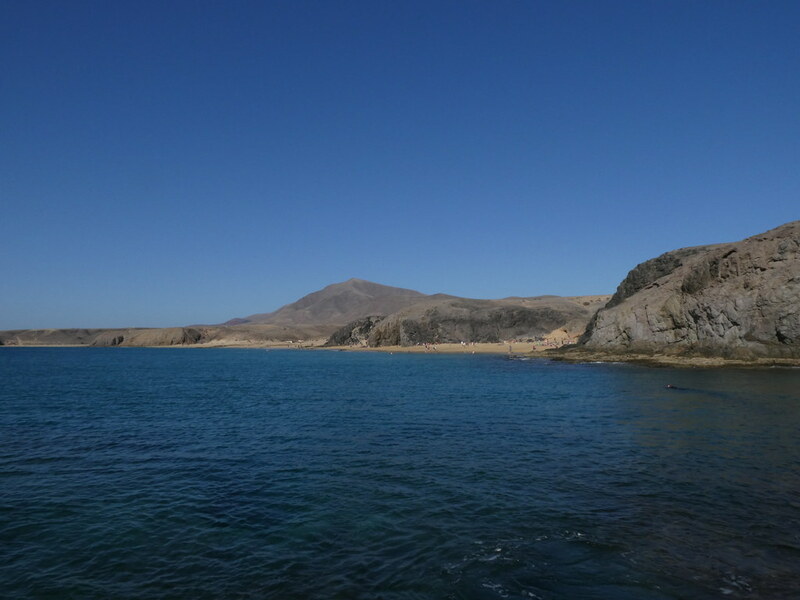 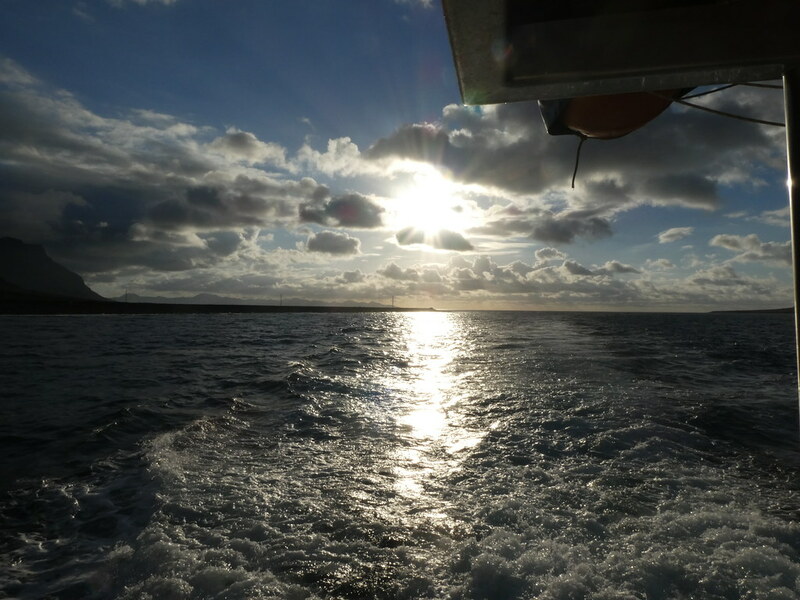 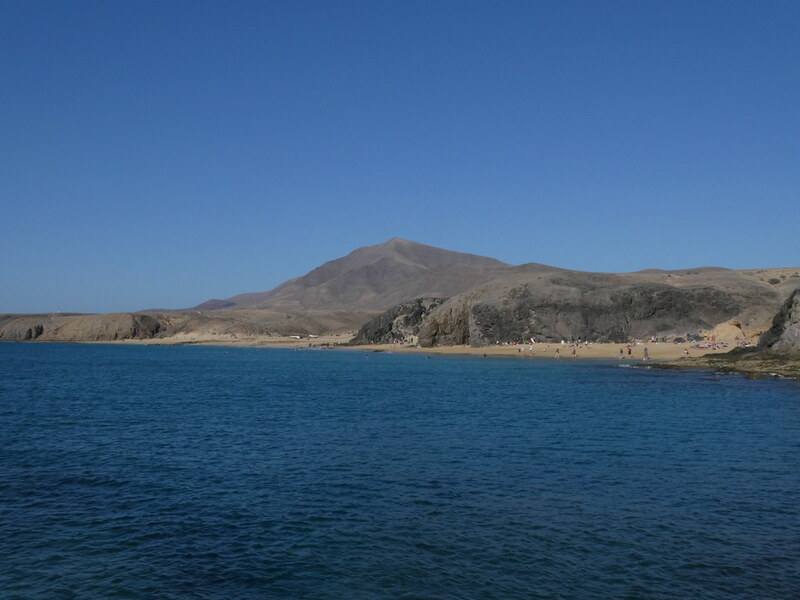 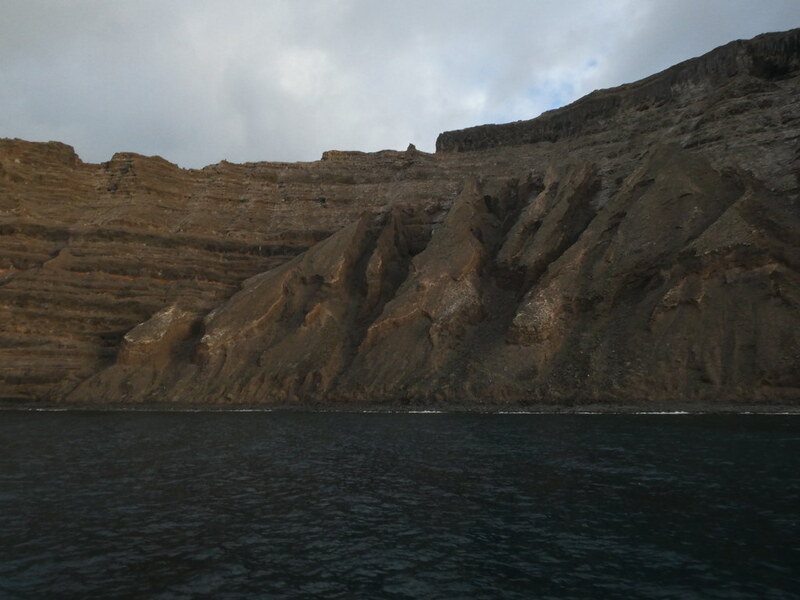 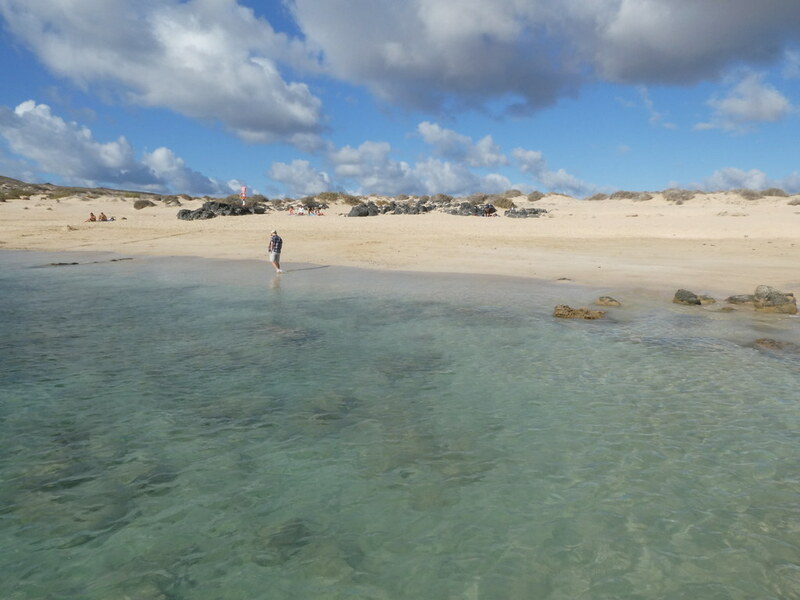 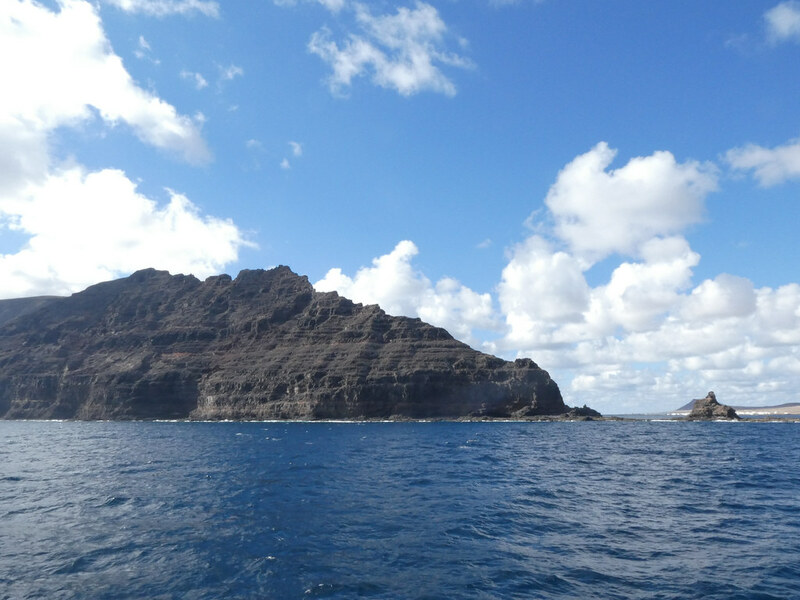 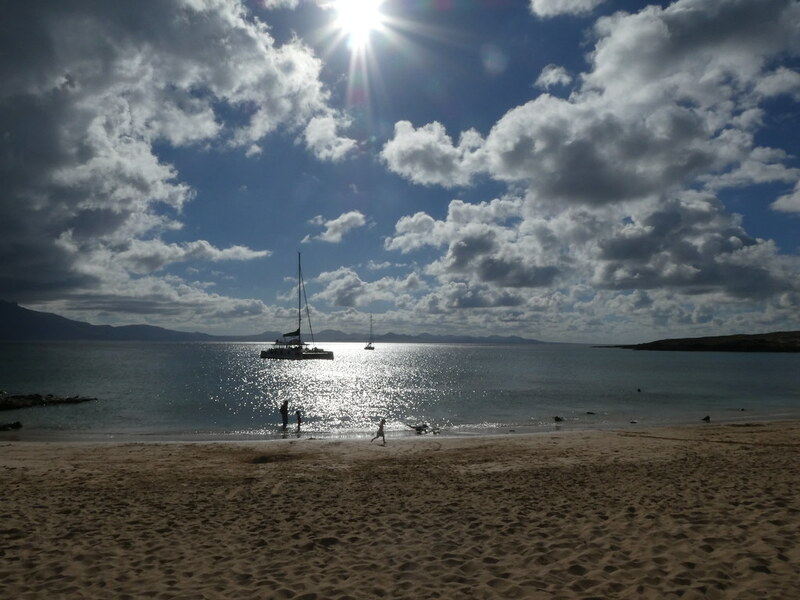 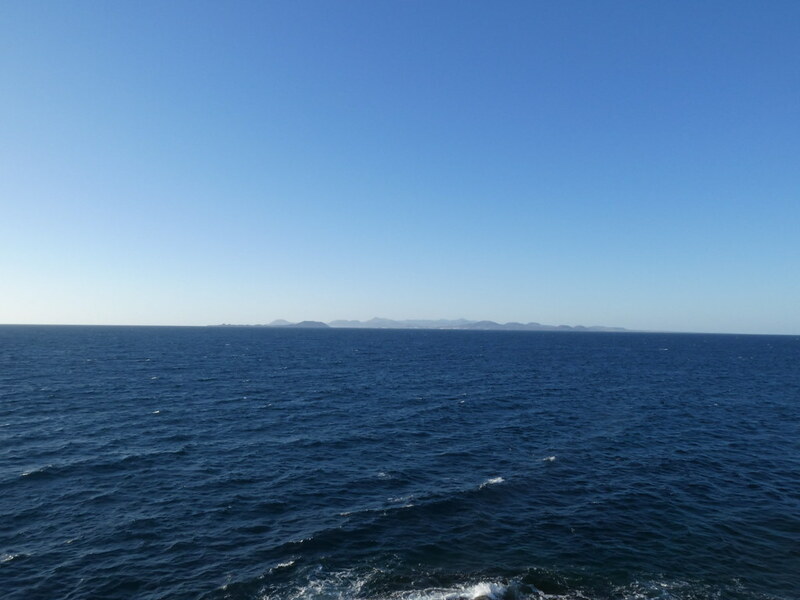 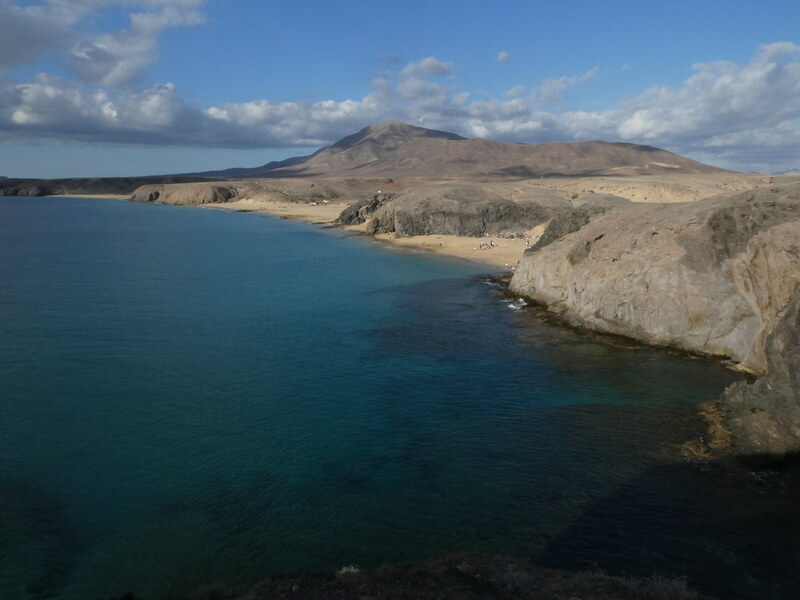 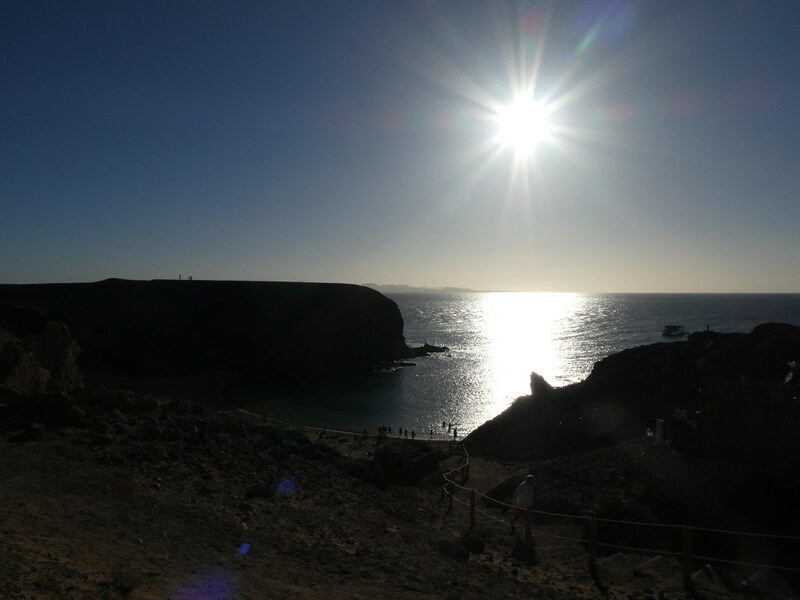 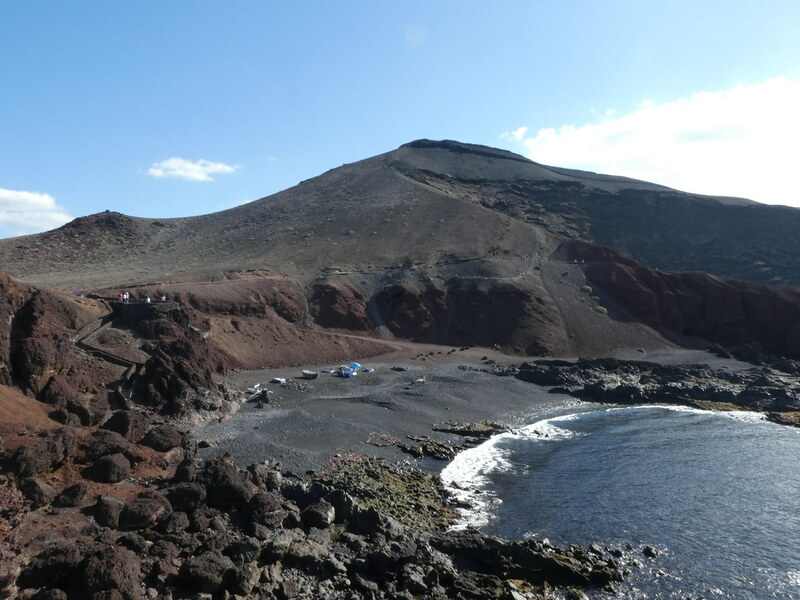 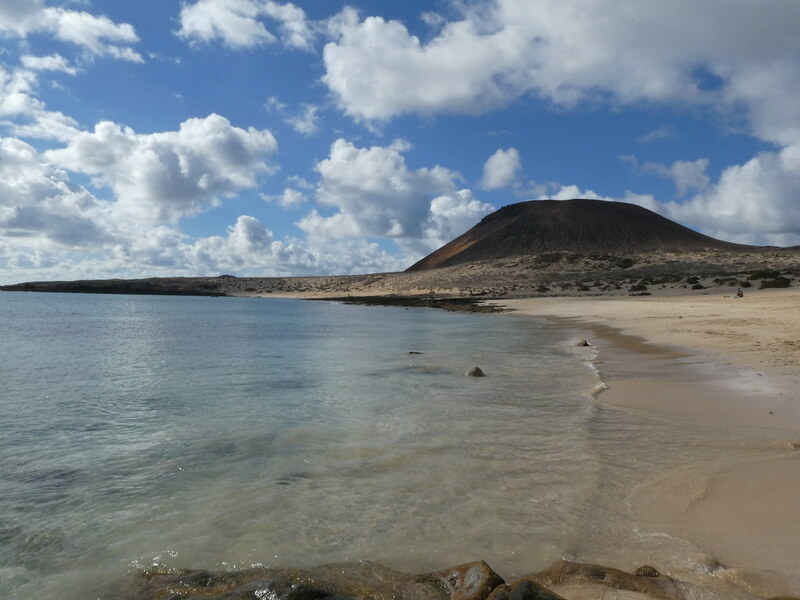 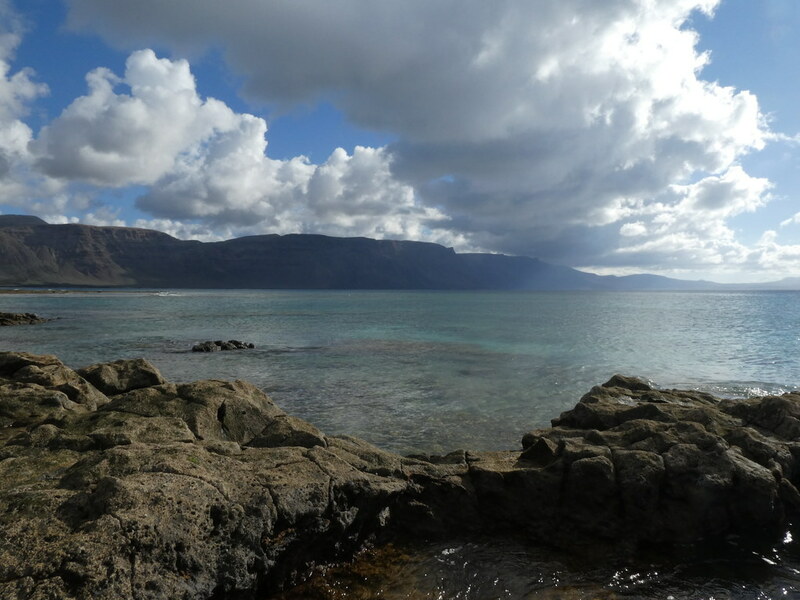 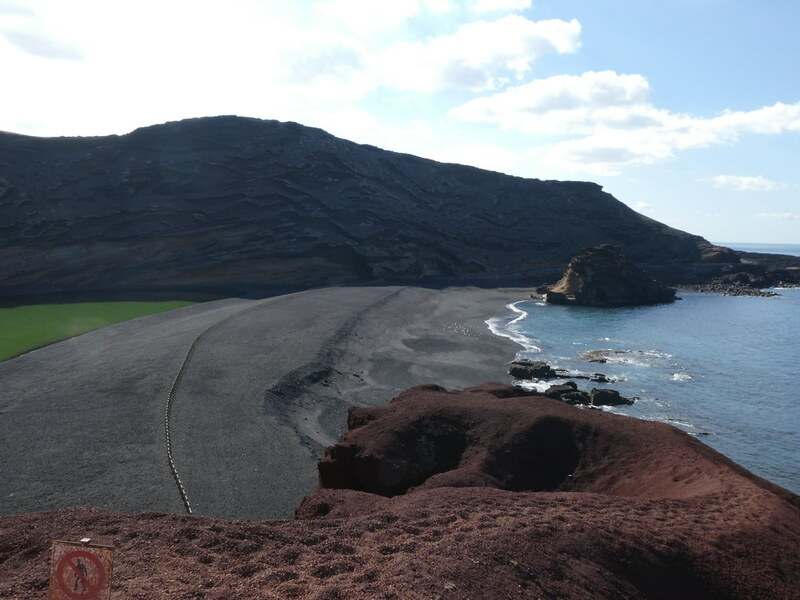 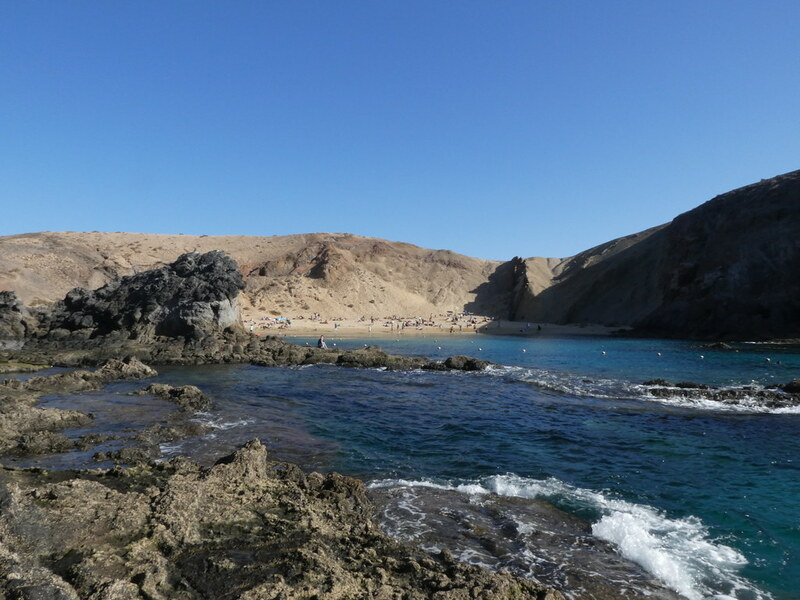 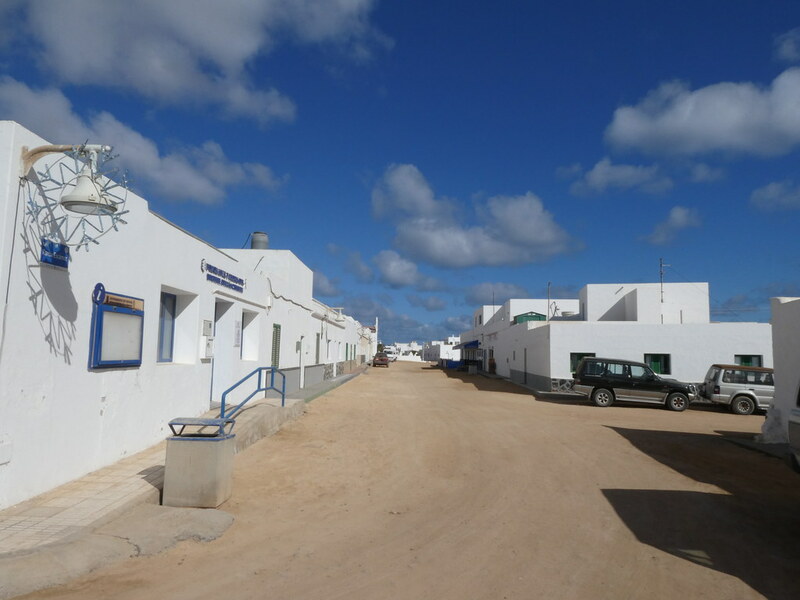 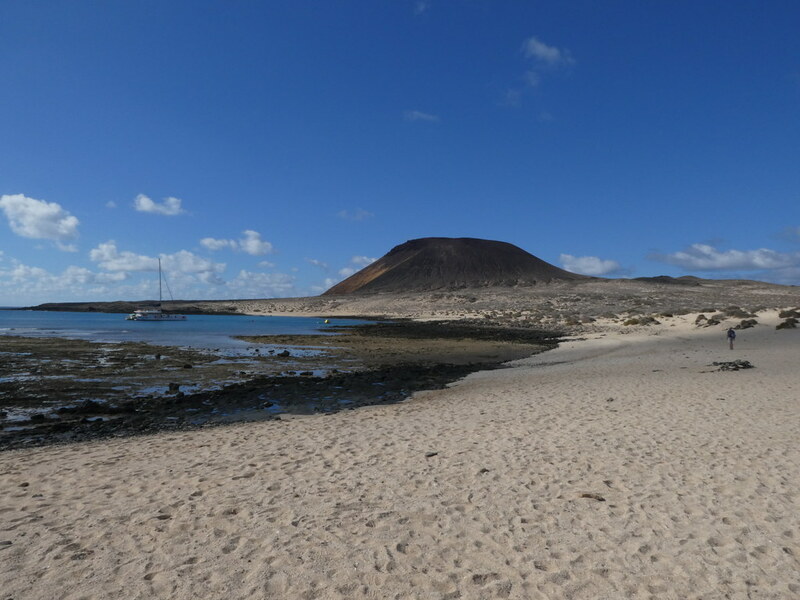 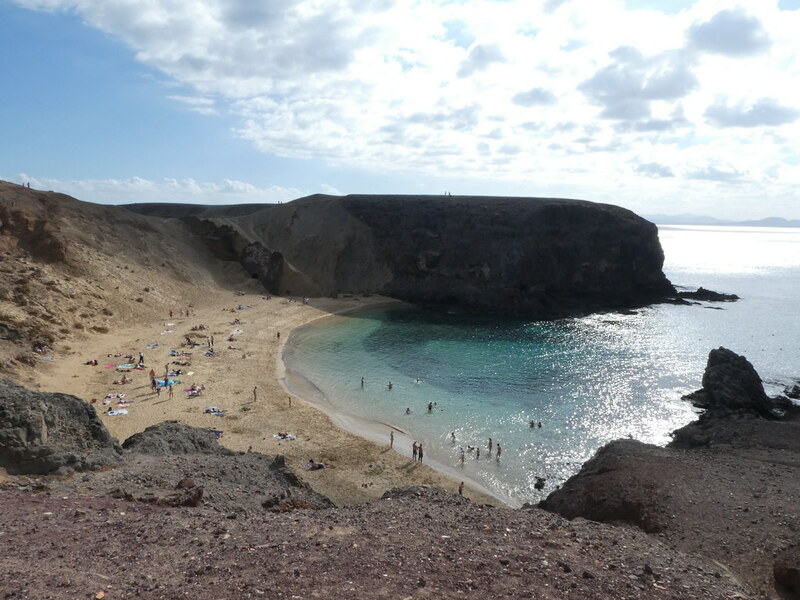 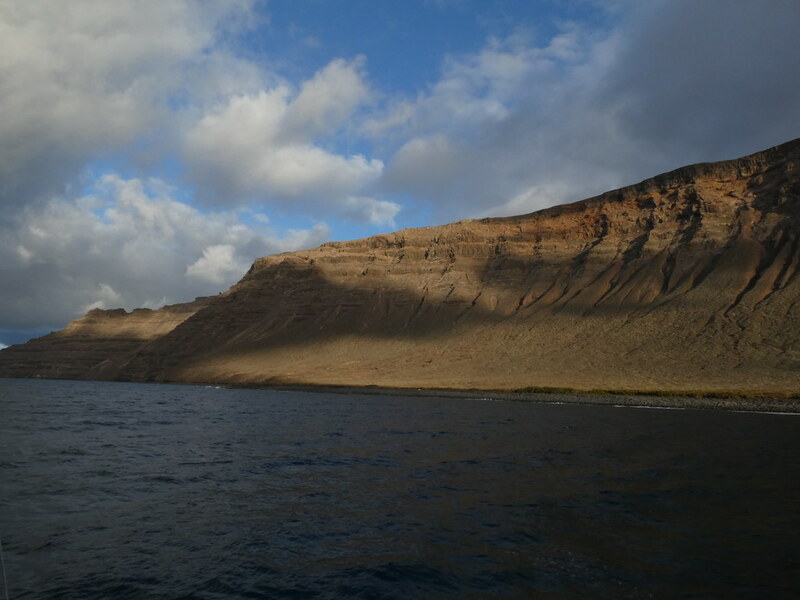 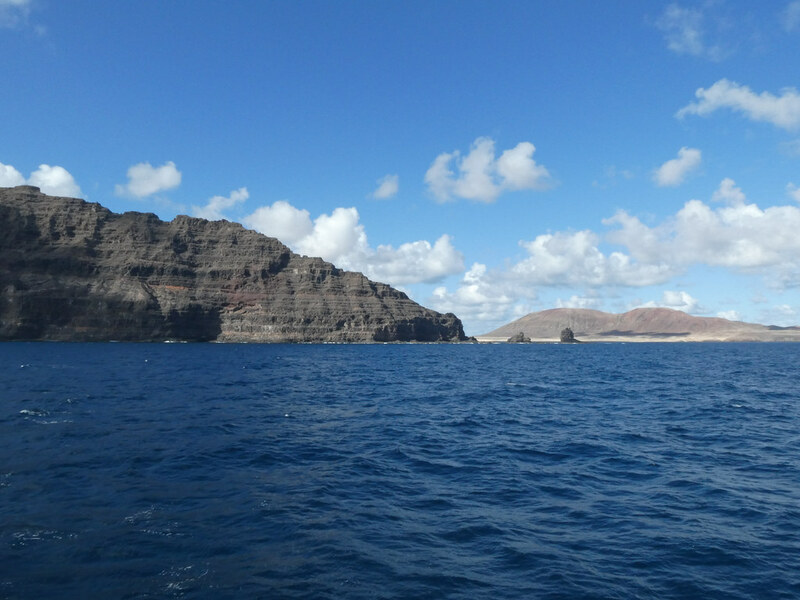 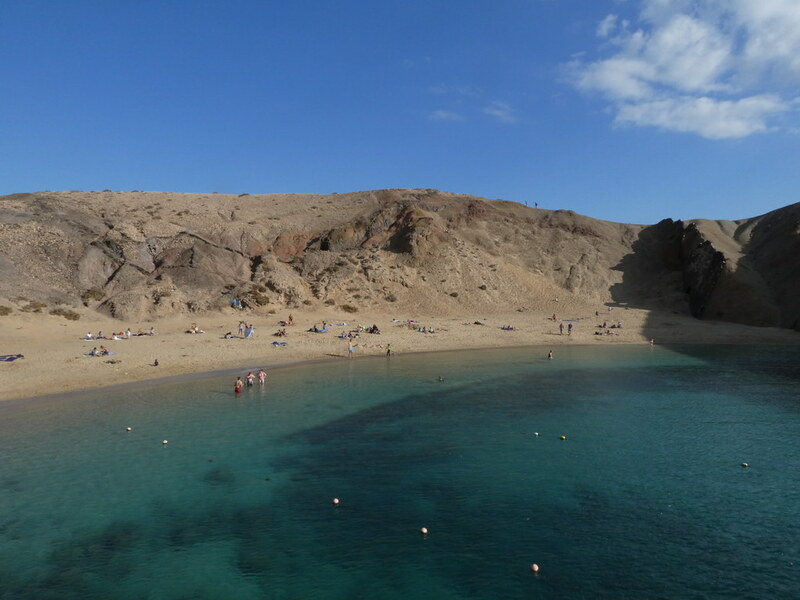 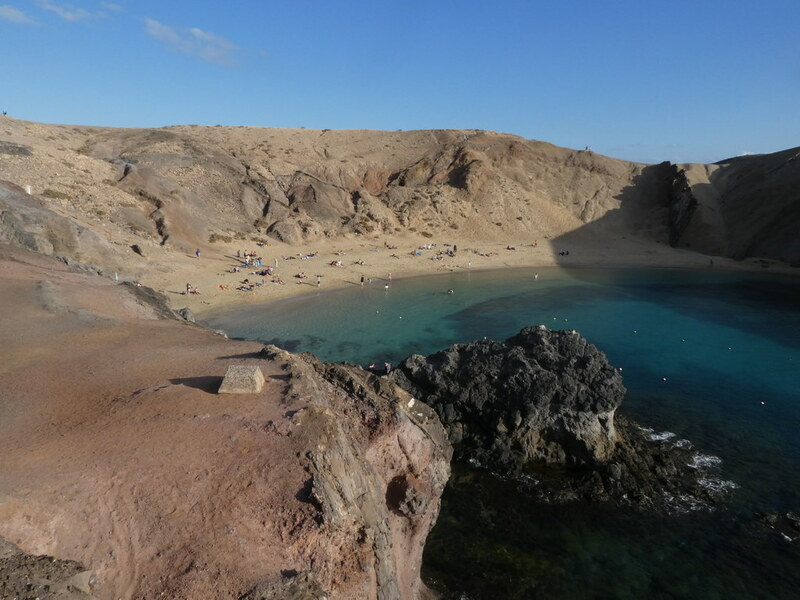 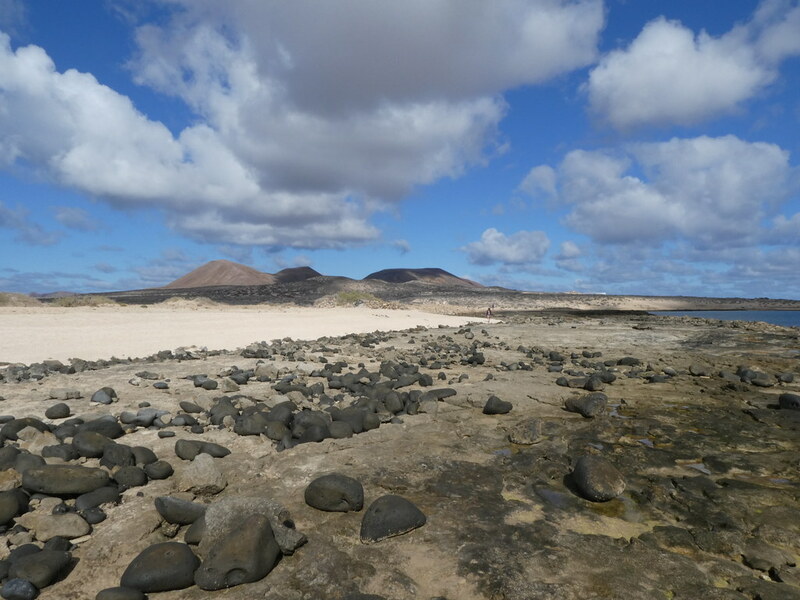 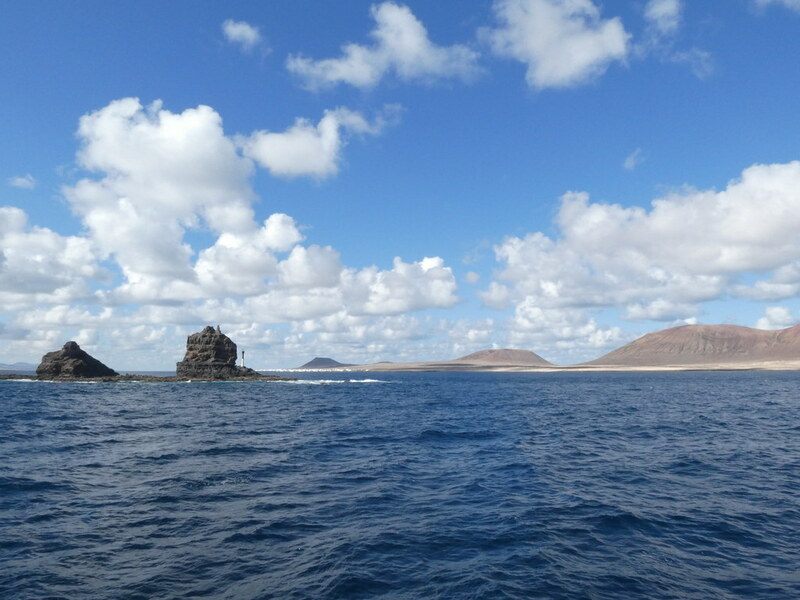 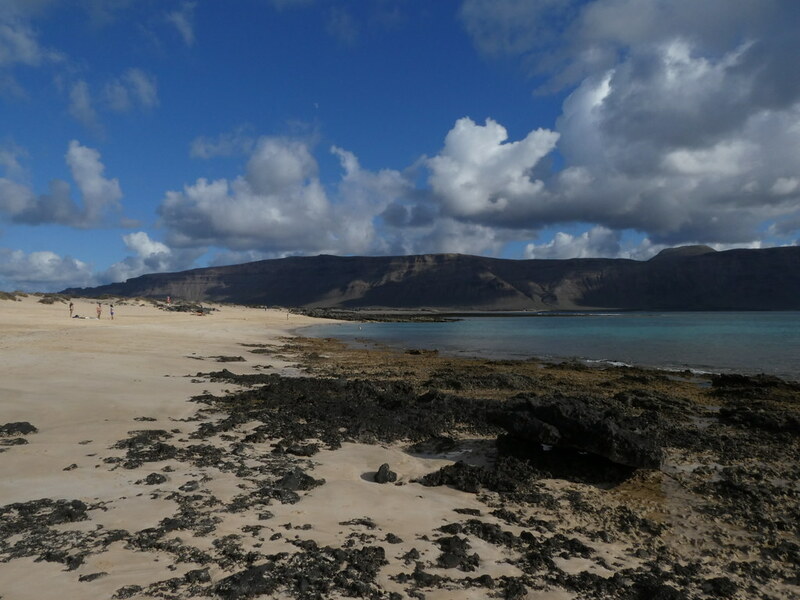 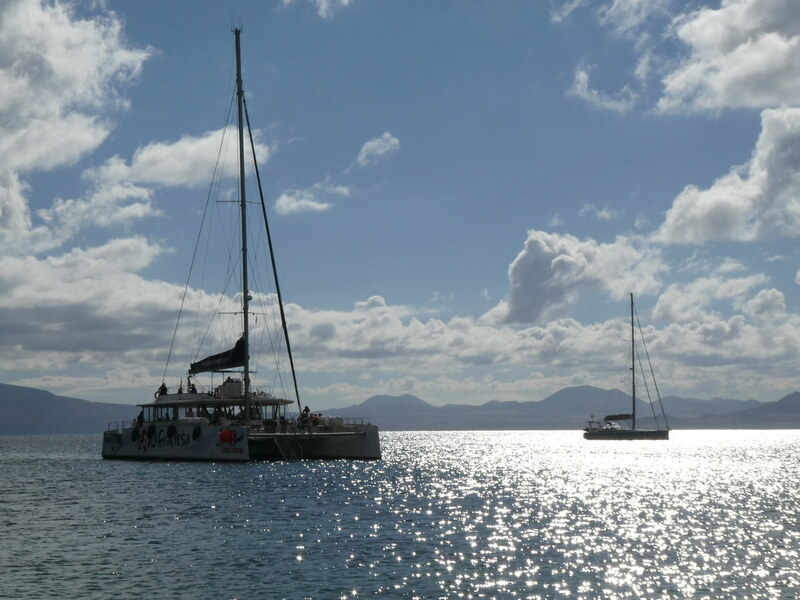 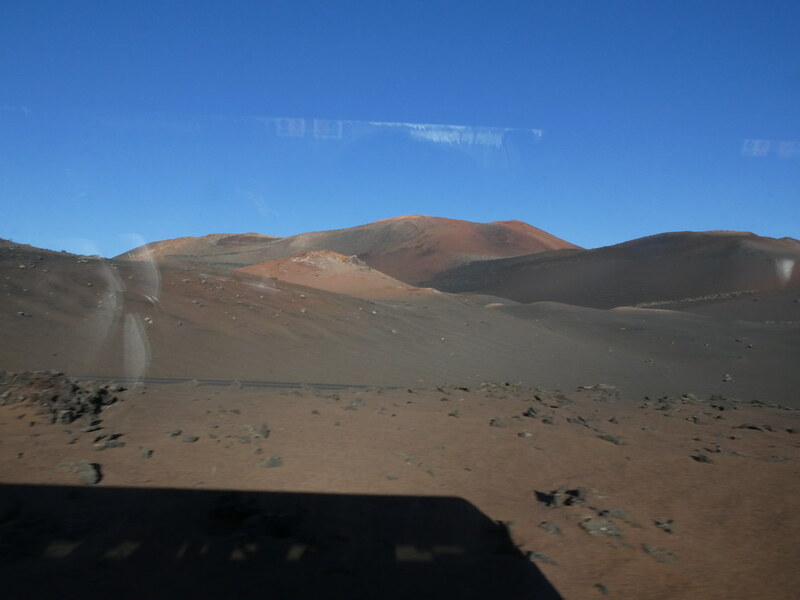 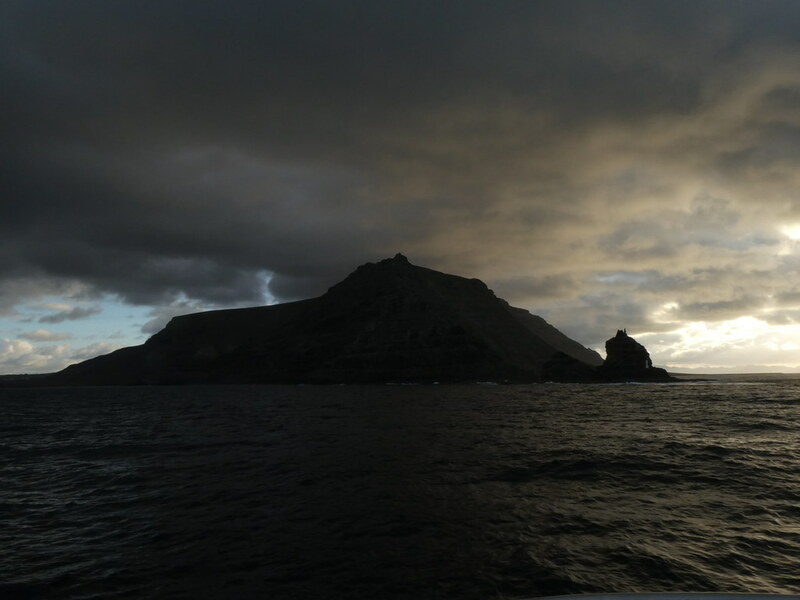 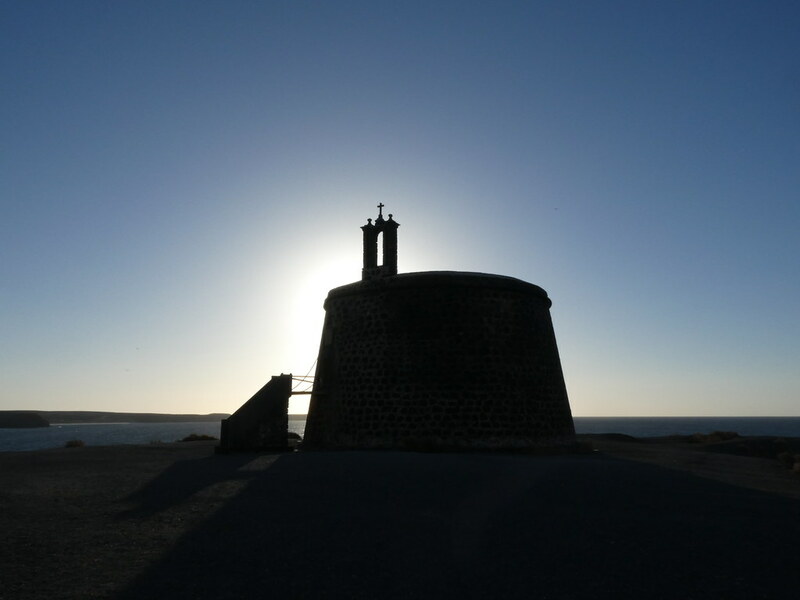 From Orzola at the north end of the island you can take a boat trip around the Punta Fariones to the island of La Graciosa. 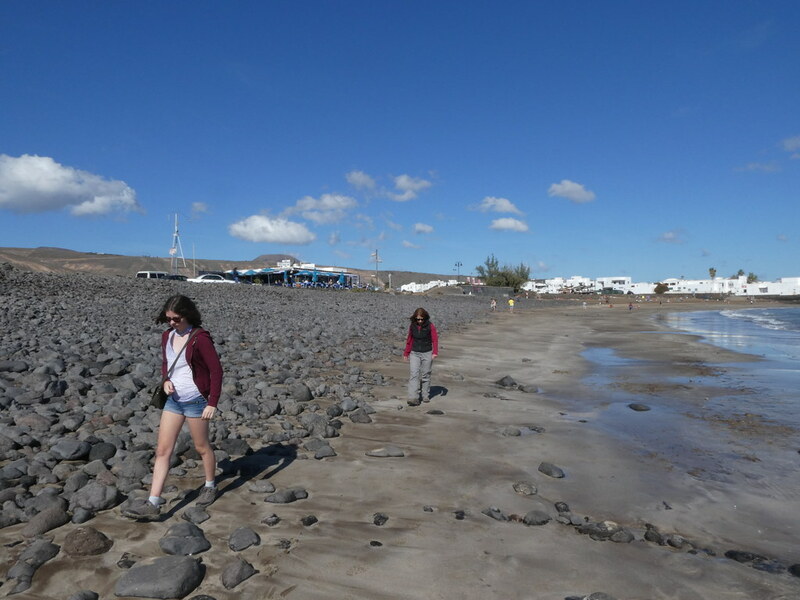 Of course we had to give this a go. 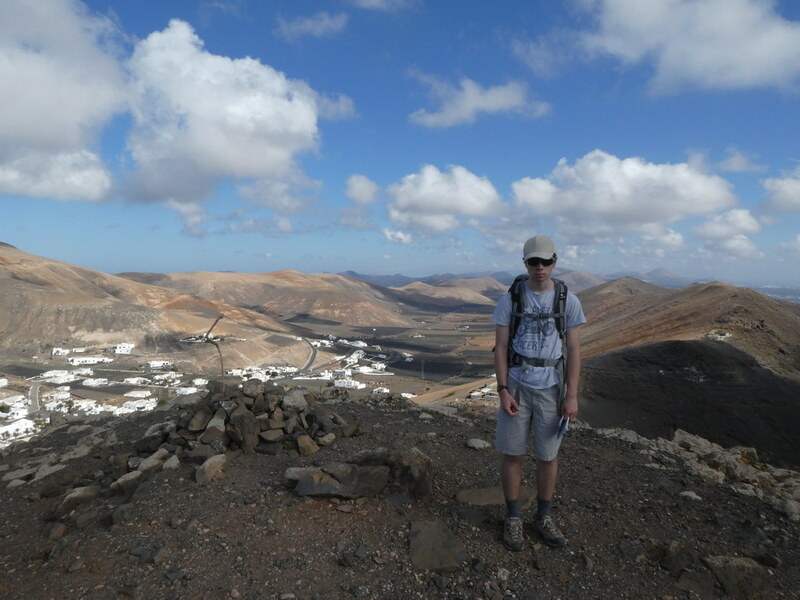 Time to get back to more serious walking. 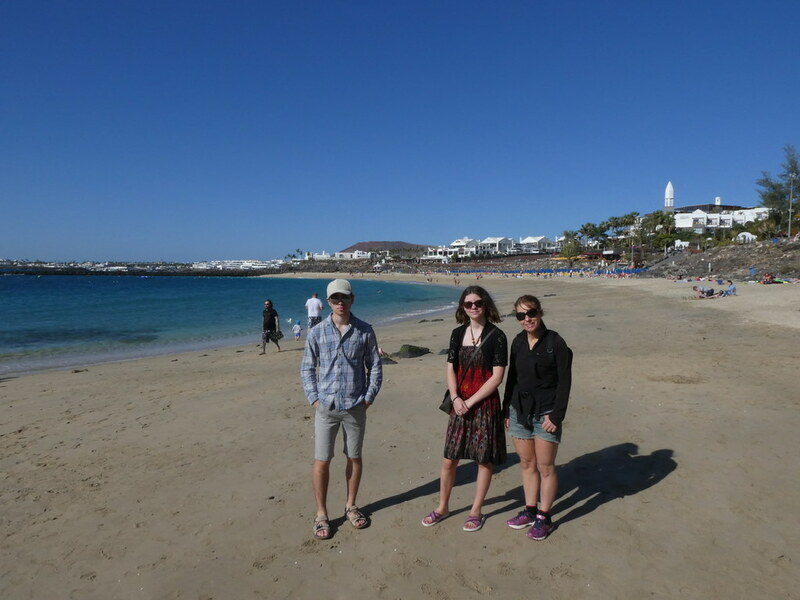 After a morning of lazy strolls and chilling by the pool me, TJS and TBF headed out for a walk in the afternoon. 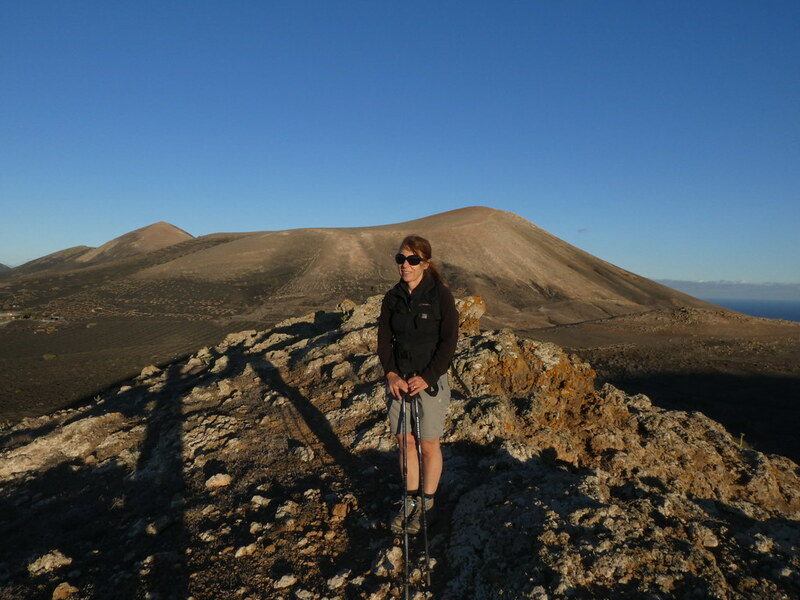 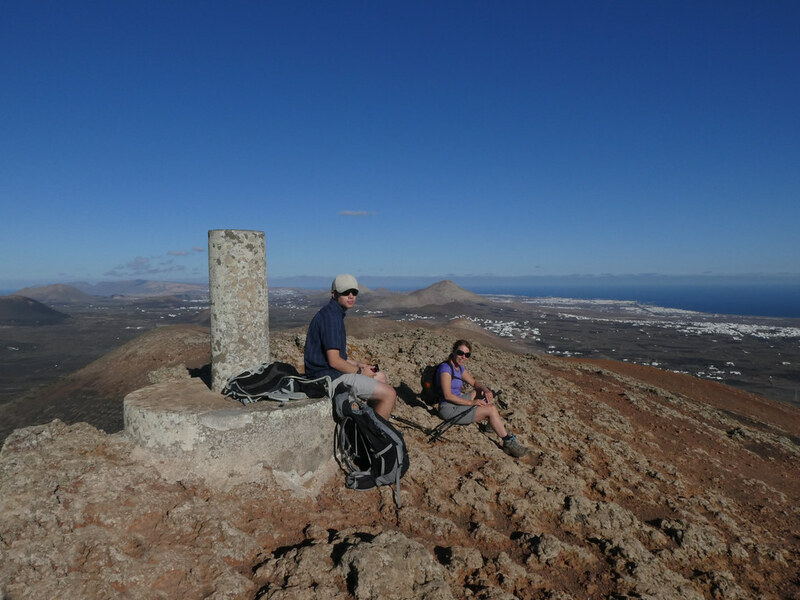 The weather was still stunningly clear and we wanted to bag one of the higher summits. 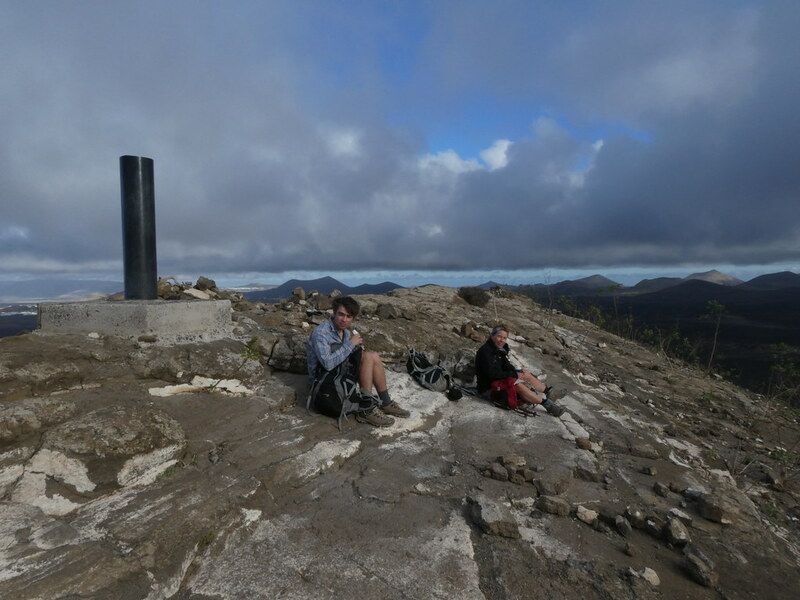 We’d started late and we had another summit to climb and a few miles to go so we had to push on. 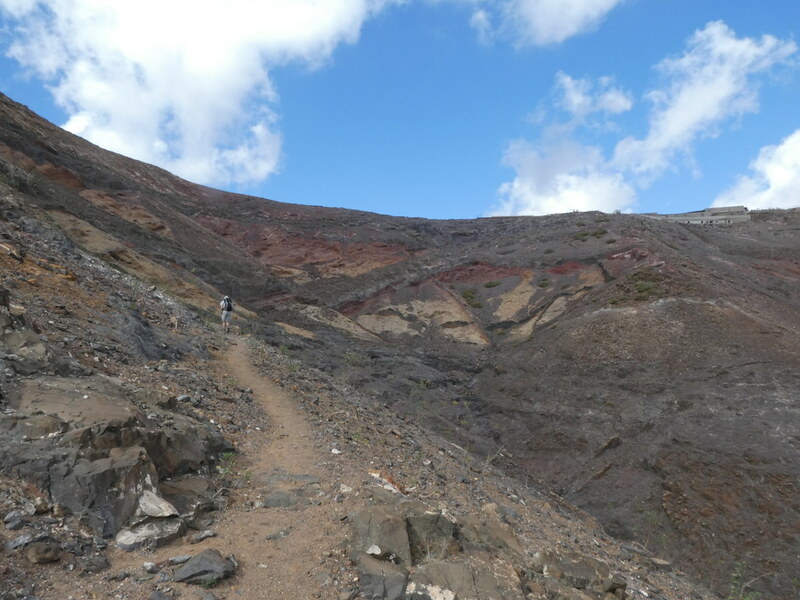 We slithered down the slippery slopes and I waited for the others to catch up. 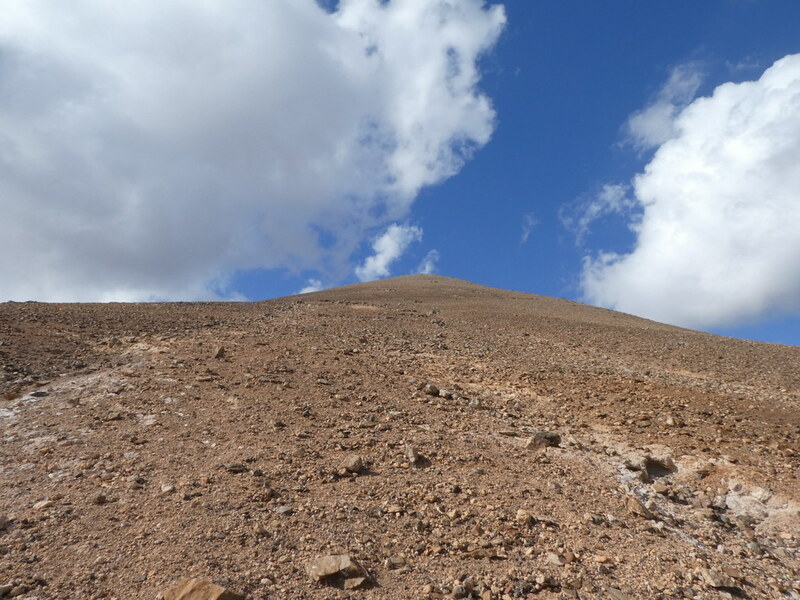 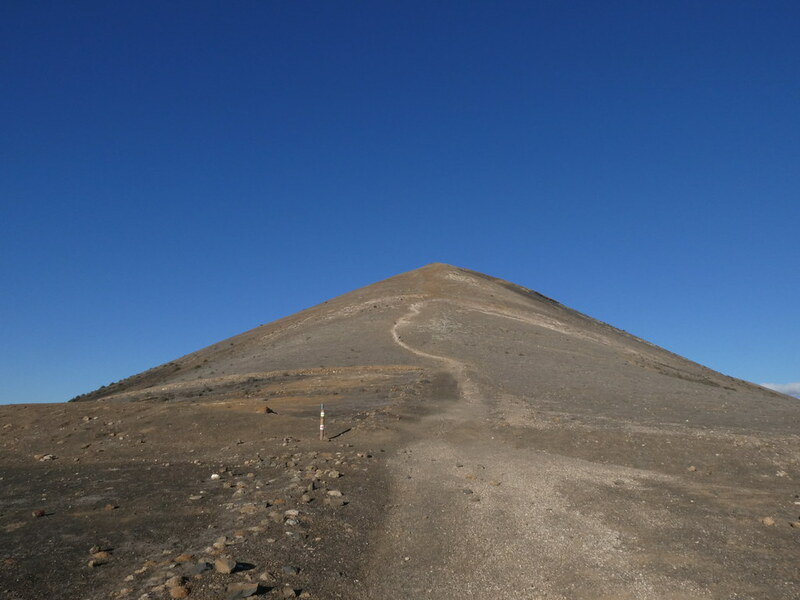 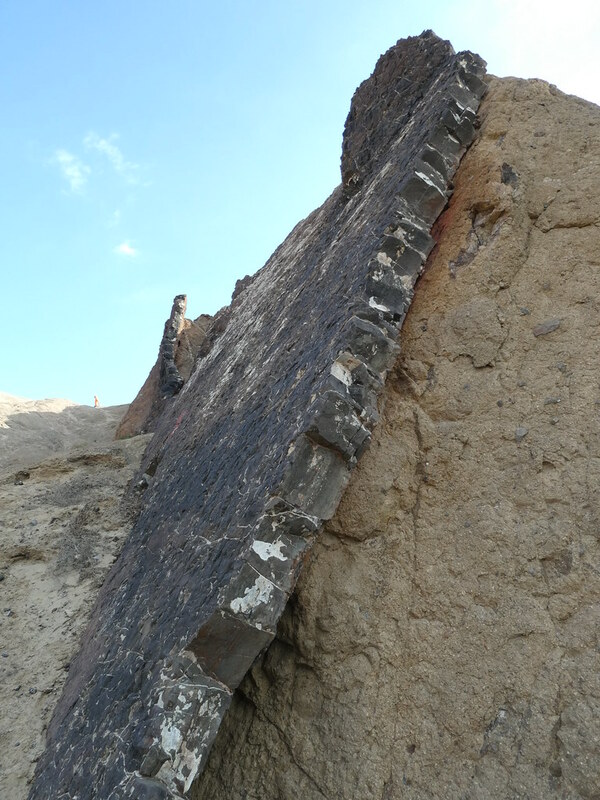 While I was there an old German man walked up and abruptly asked what the climb was like. 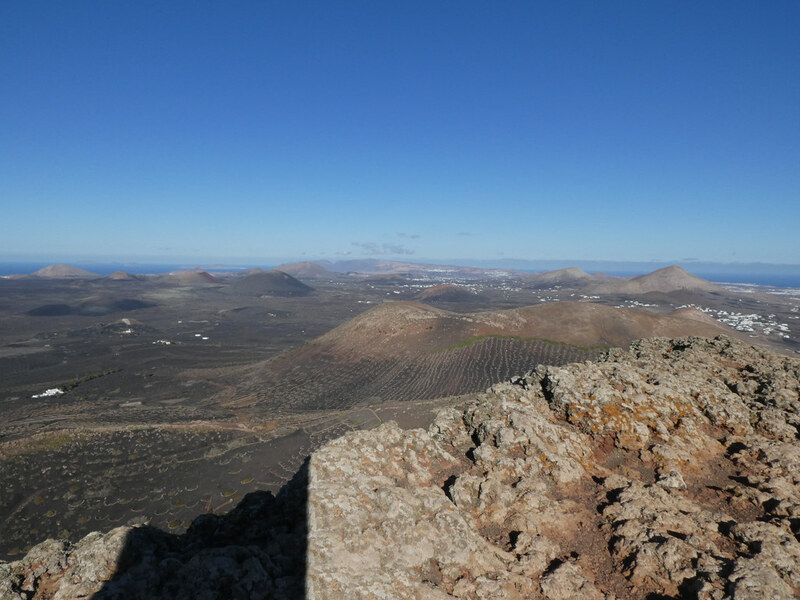 I gave him the low down about how long the climb might take etc but that the views were well worth it. 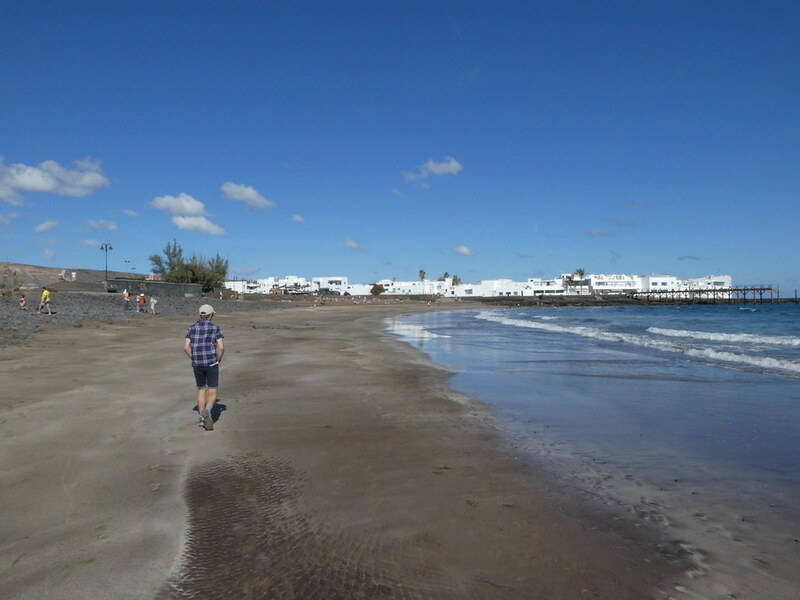 He then set off just as abruptly without another word or a thank you. 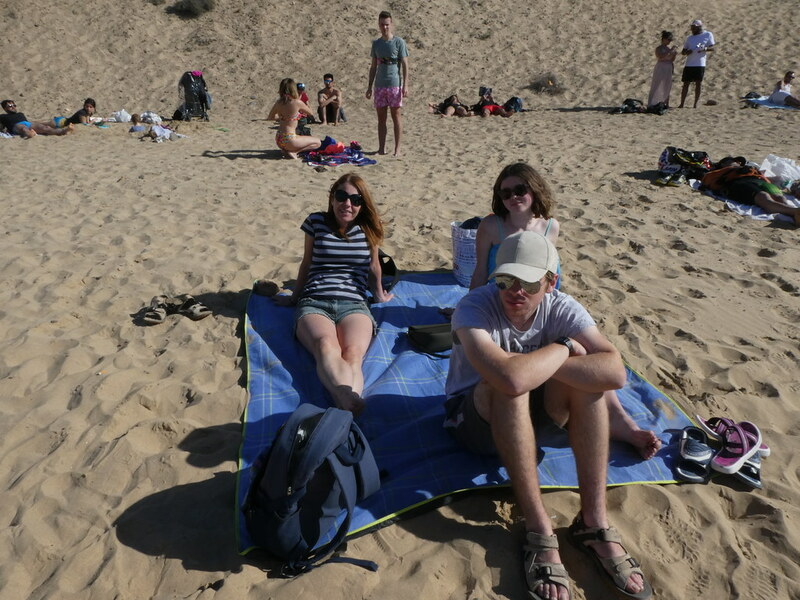 Some people! 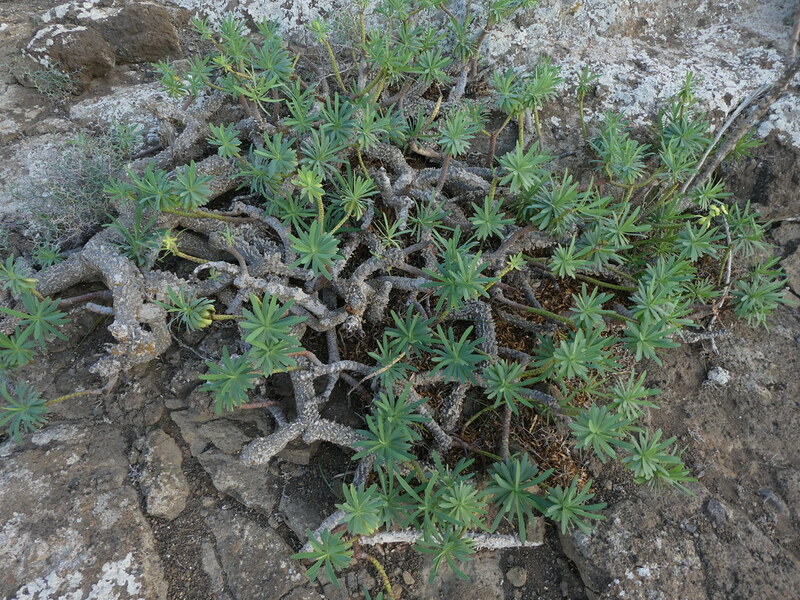 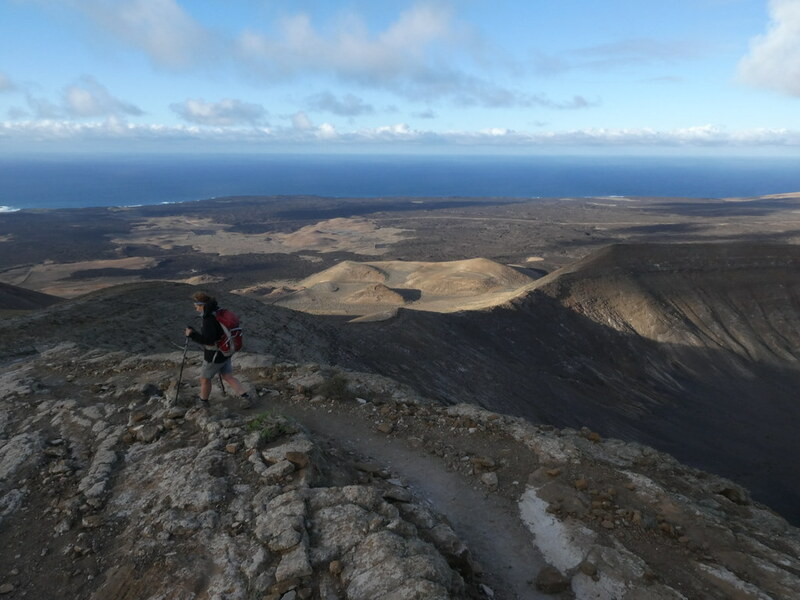 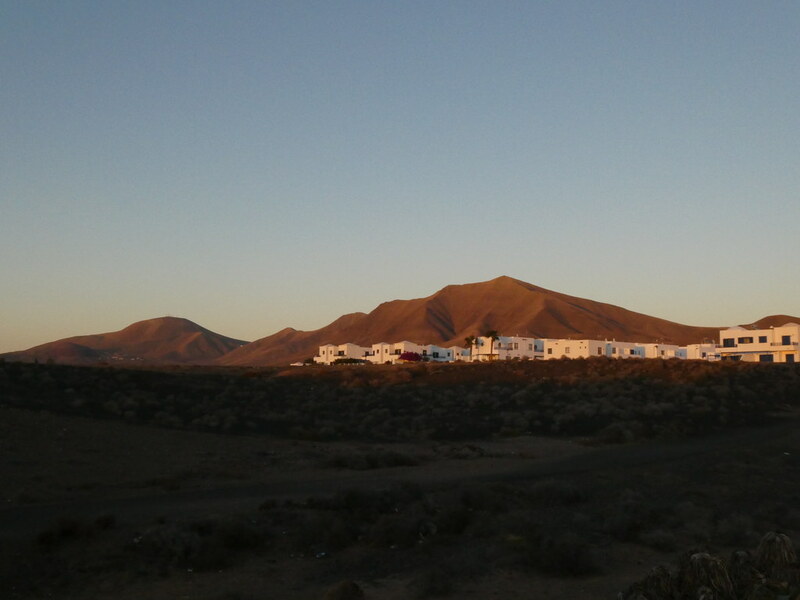 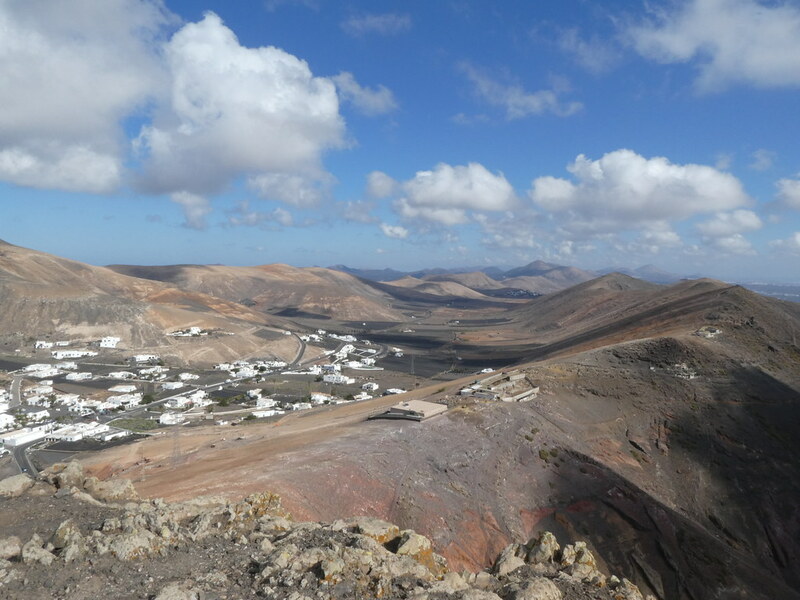 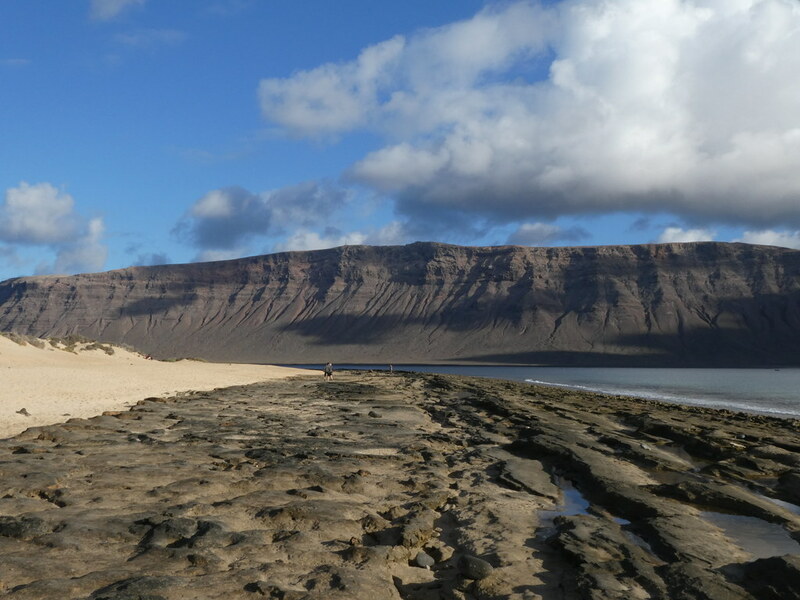 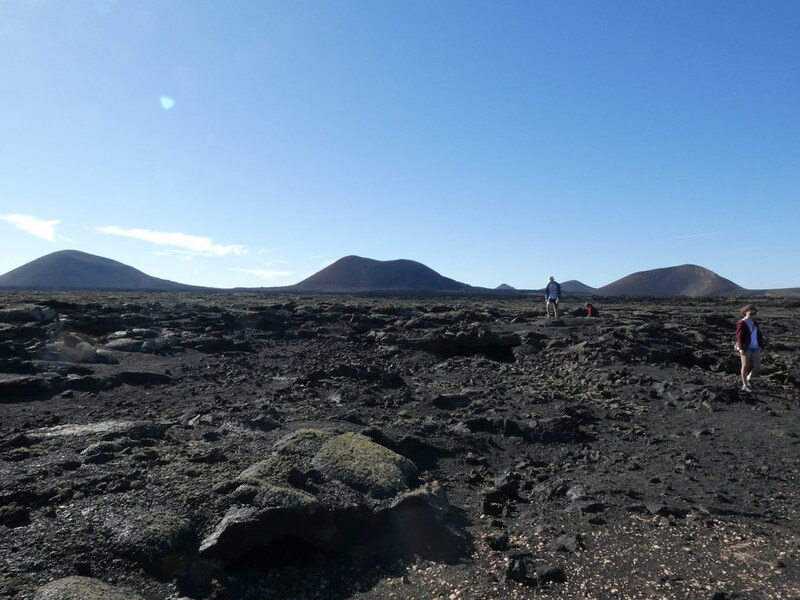 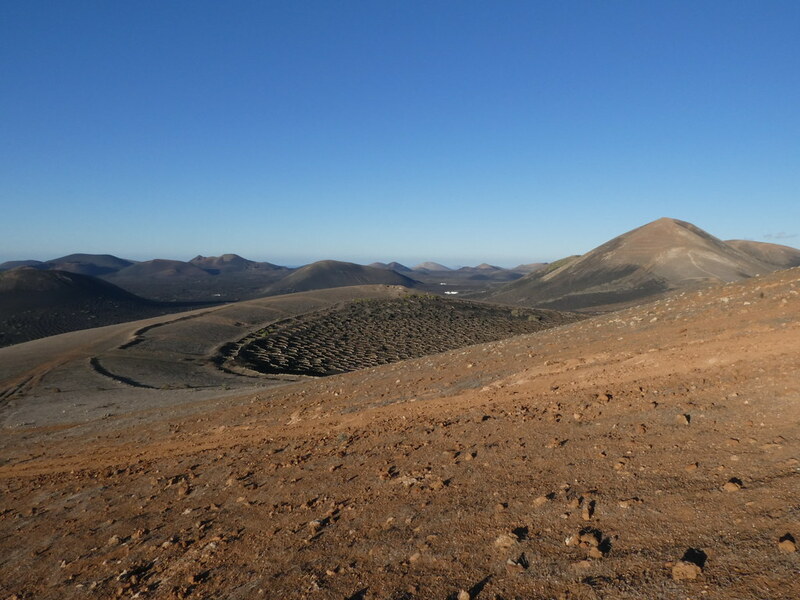 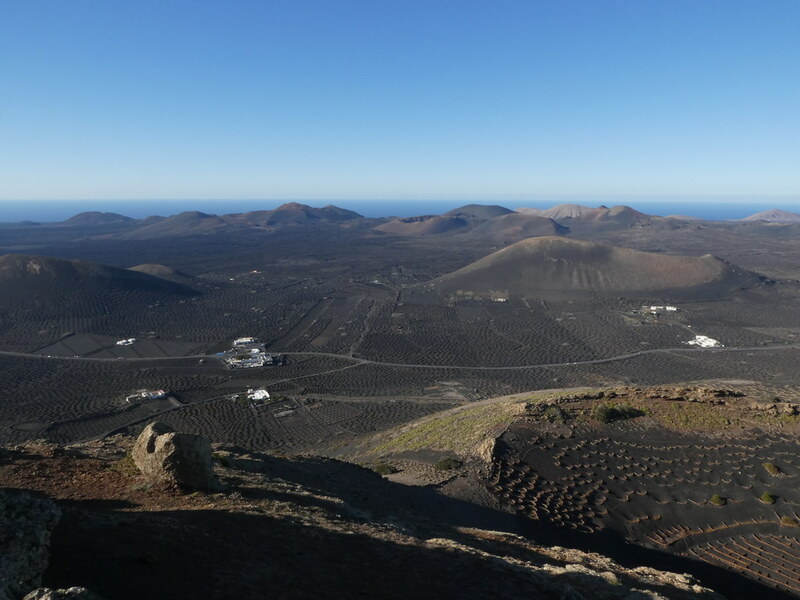 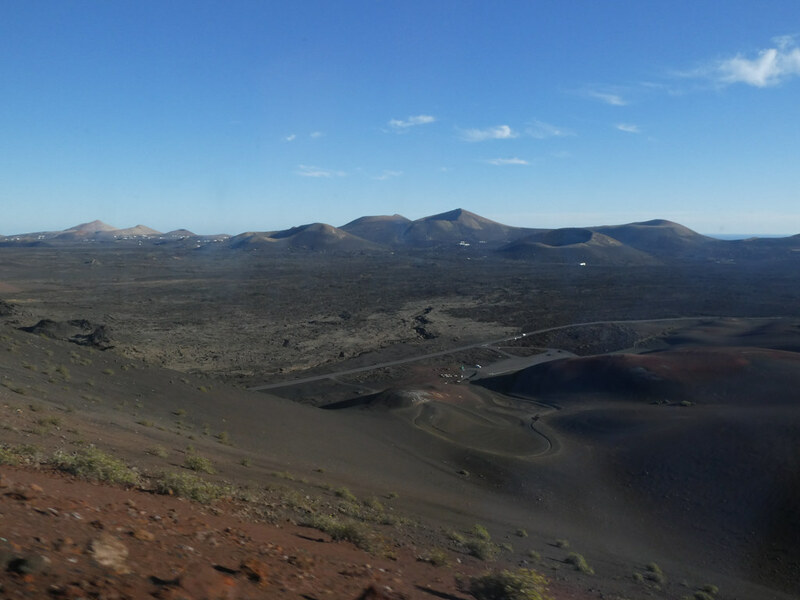 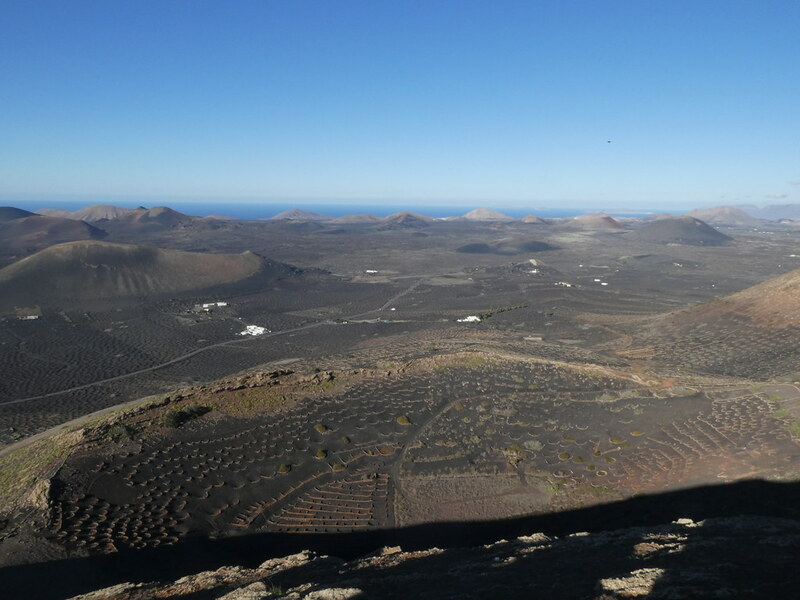 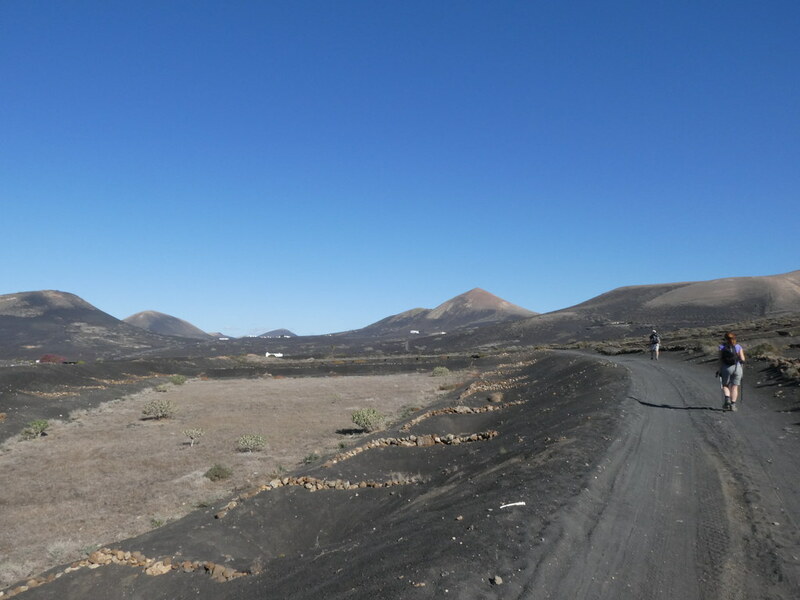 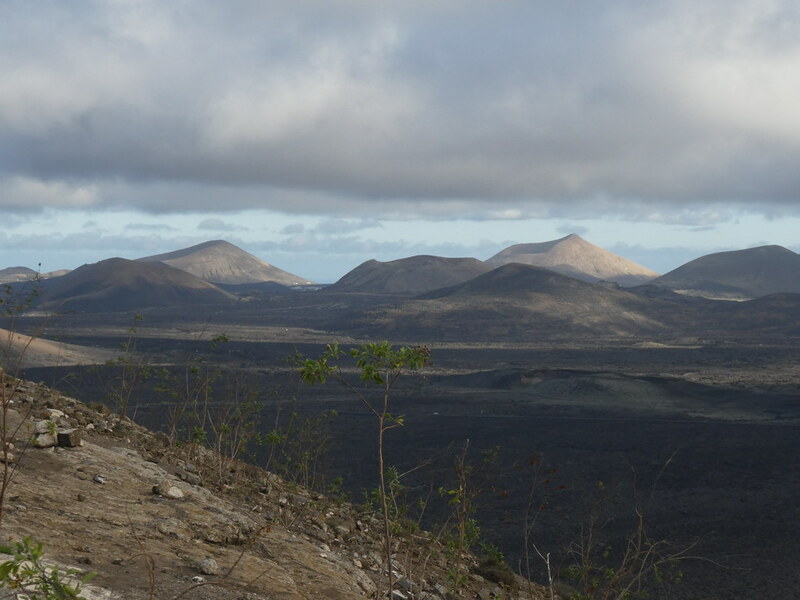 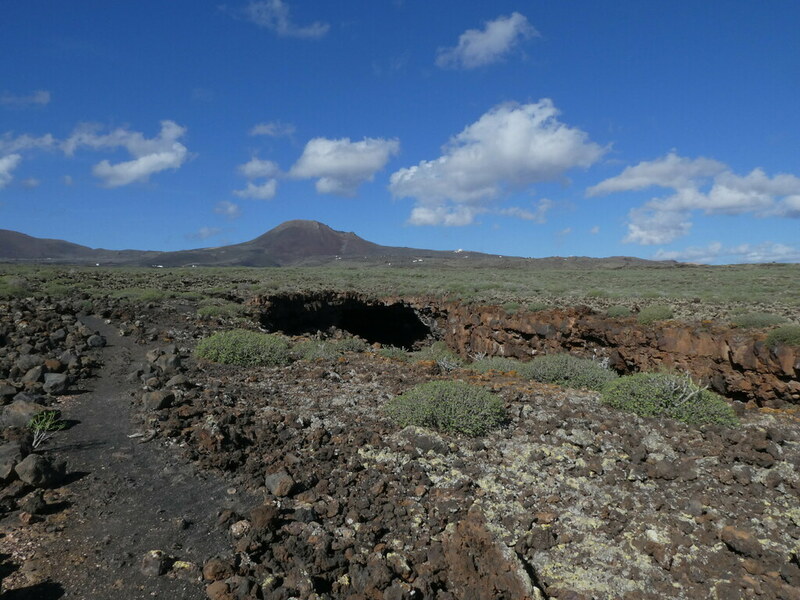 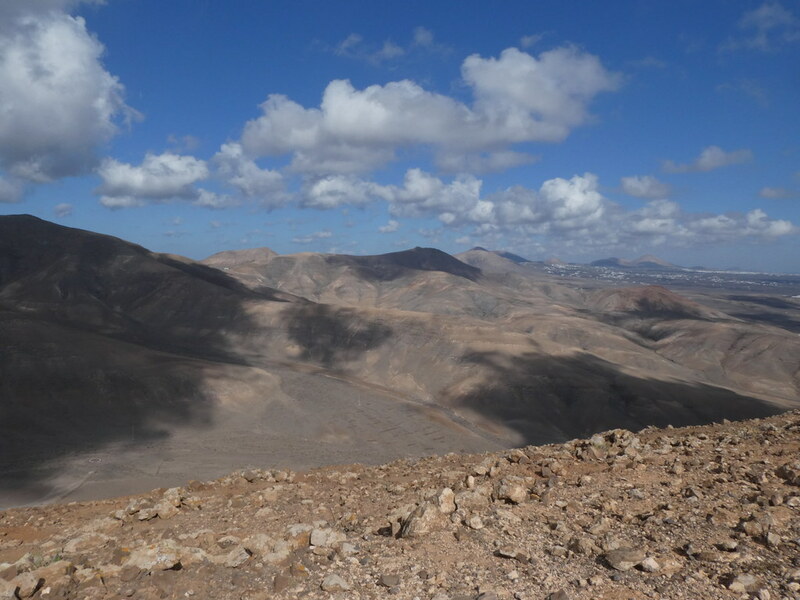 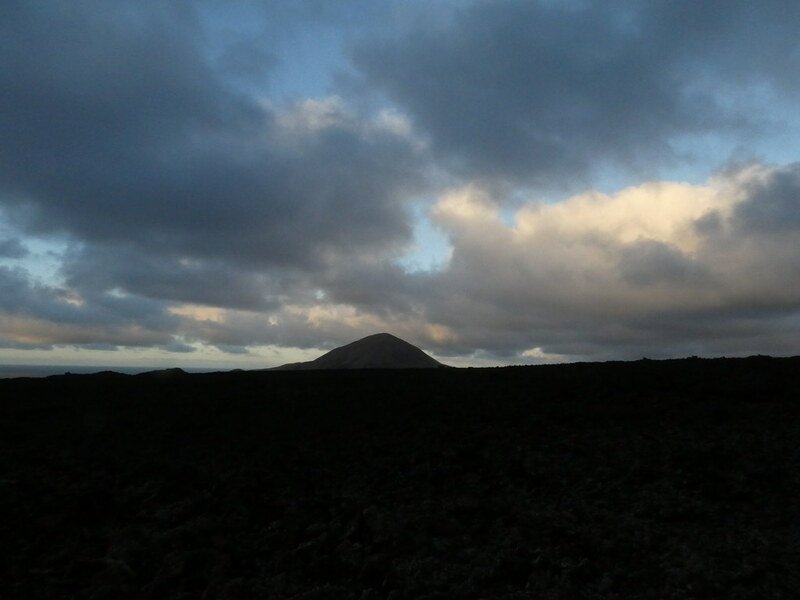 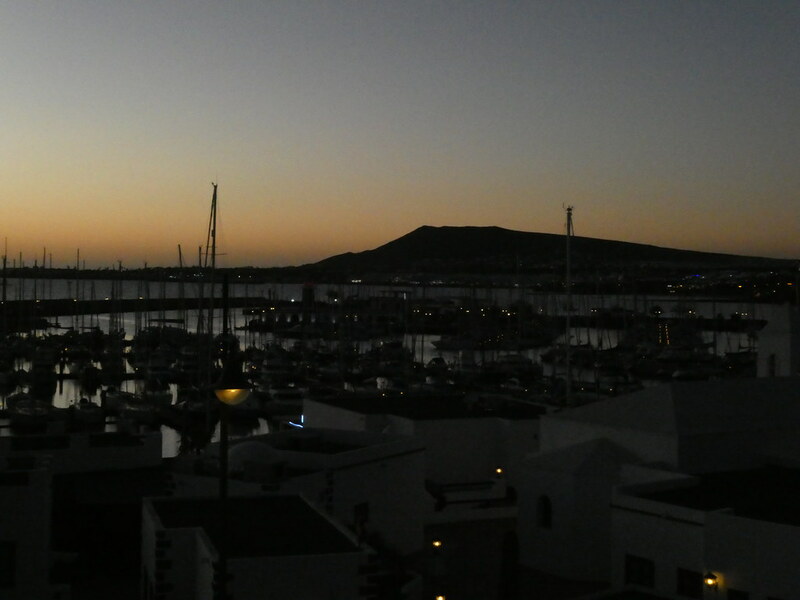 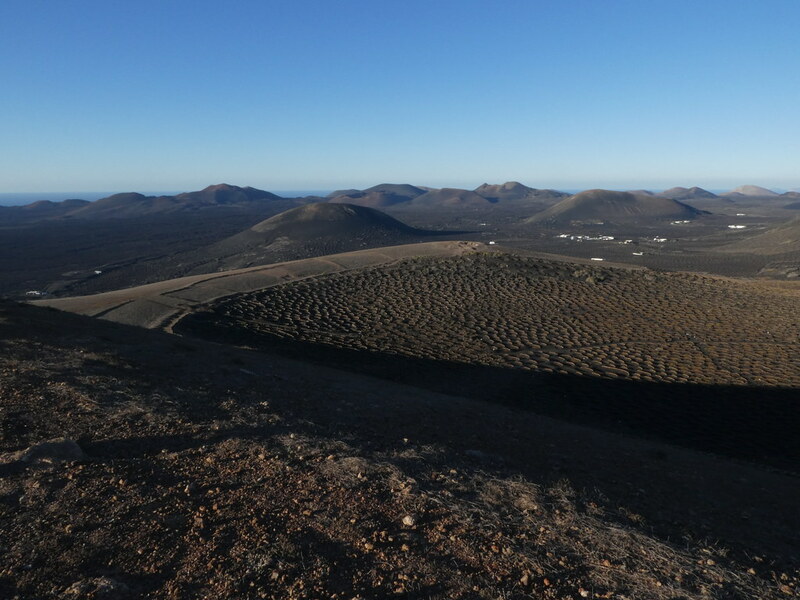 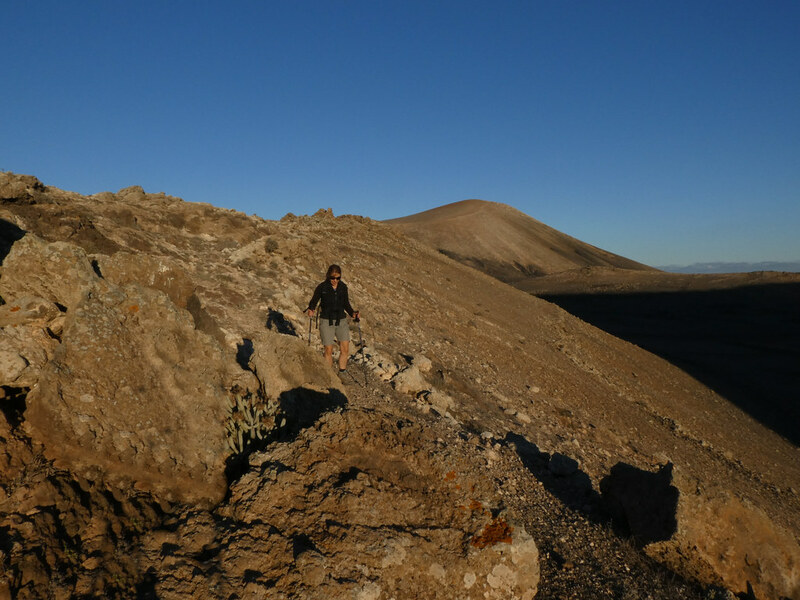 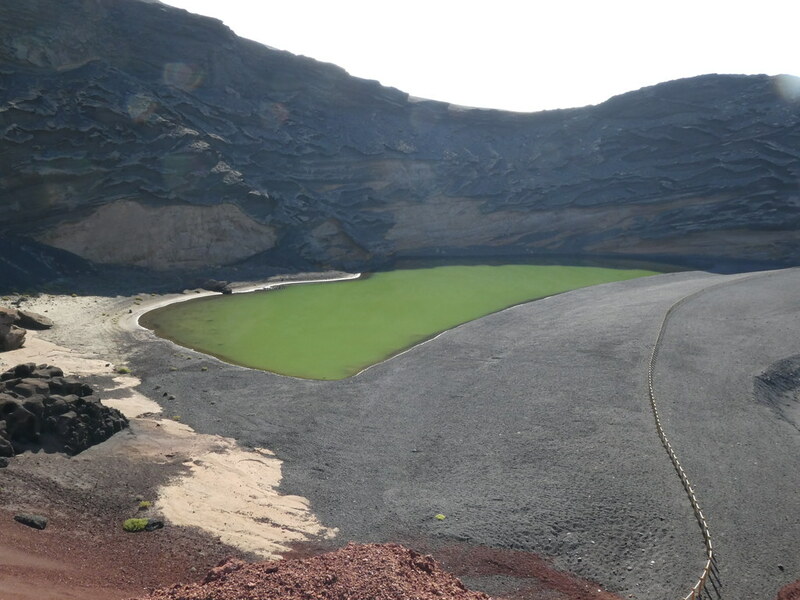 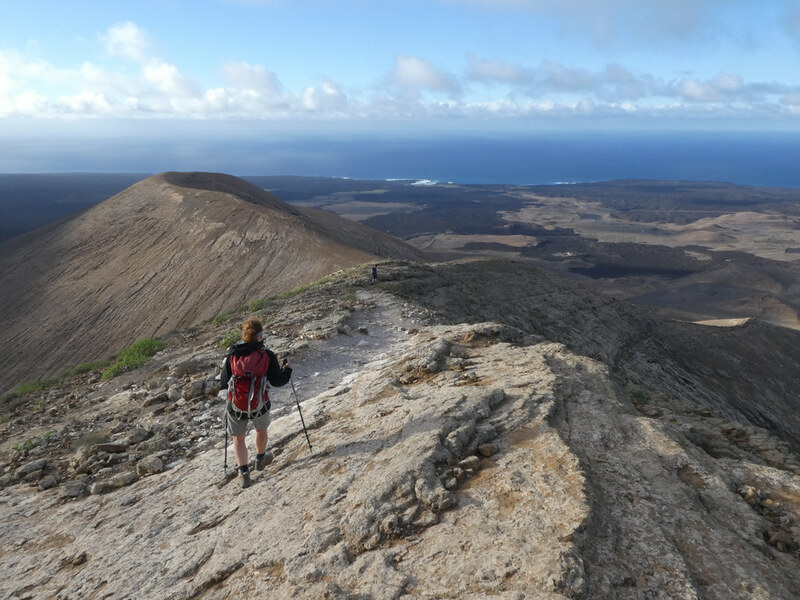 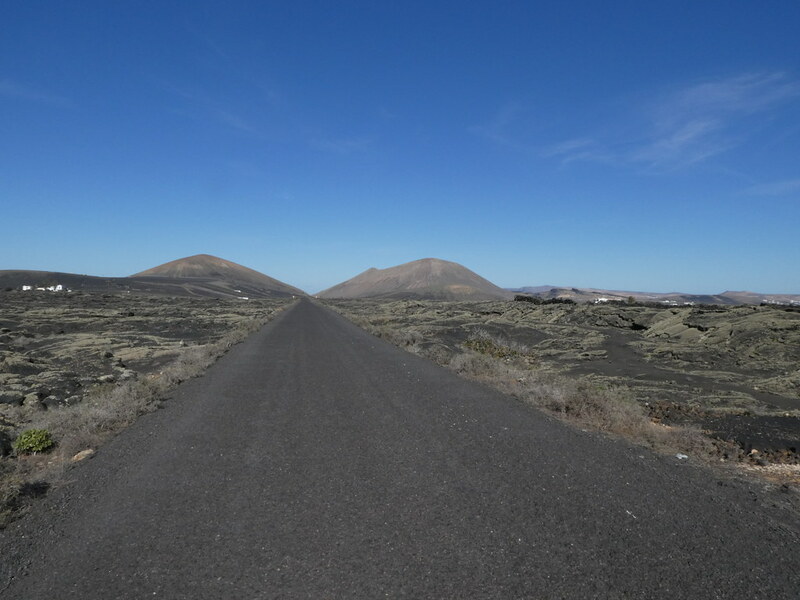 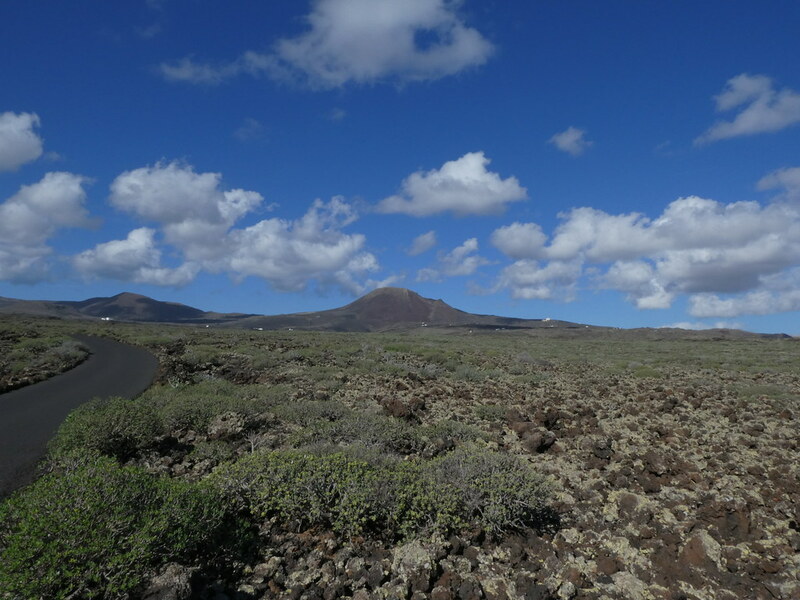 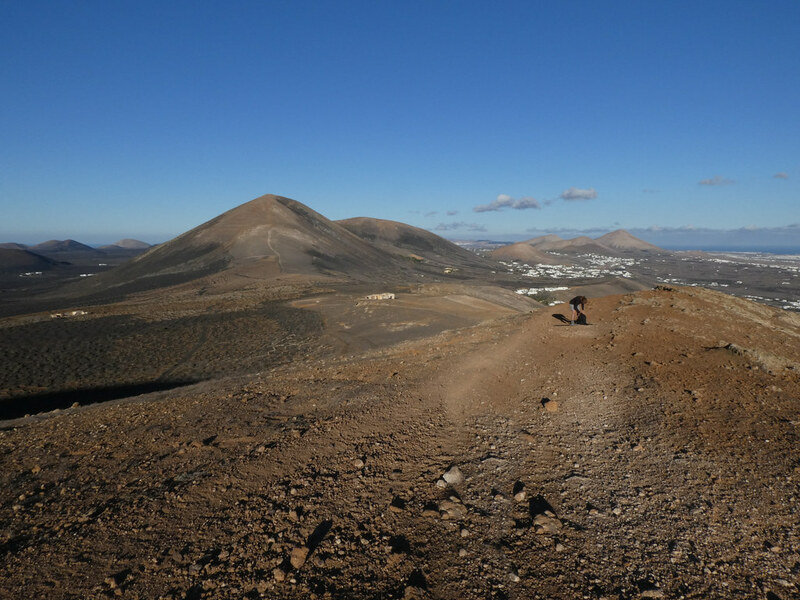 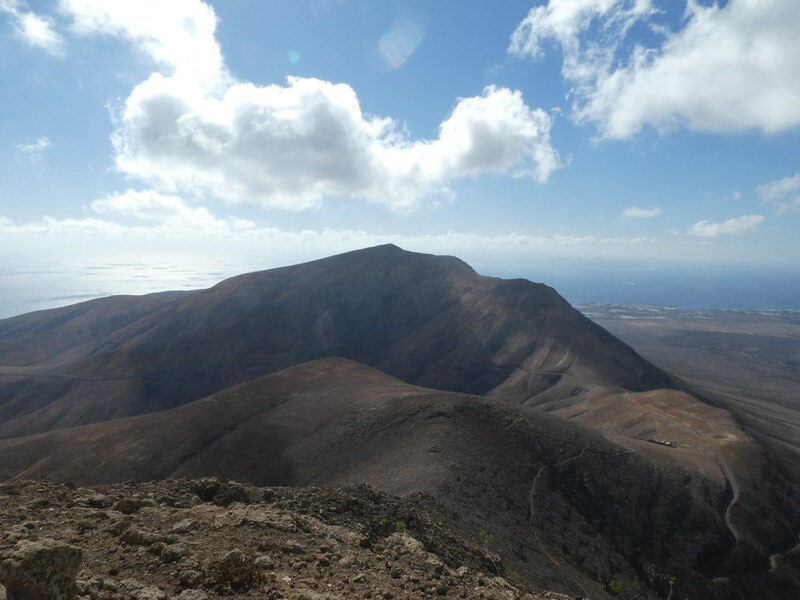 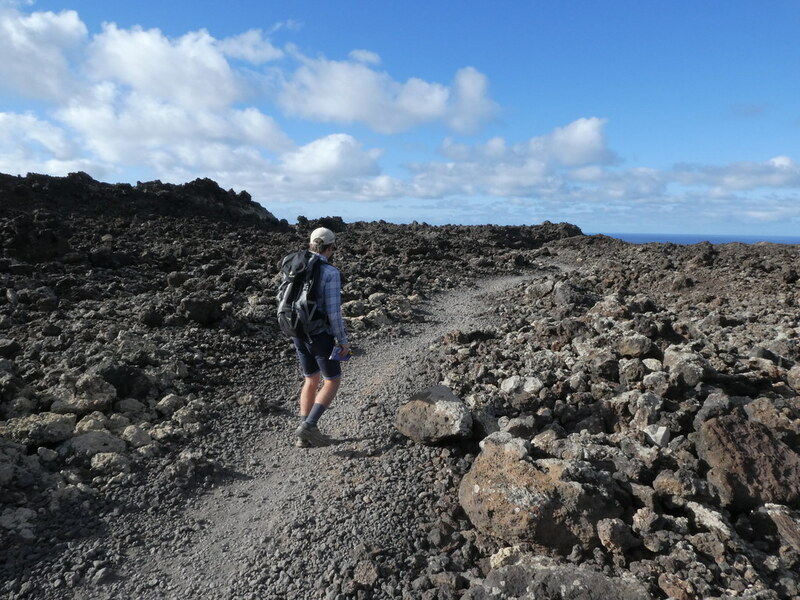 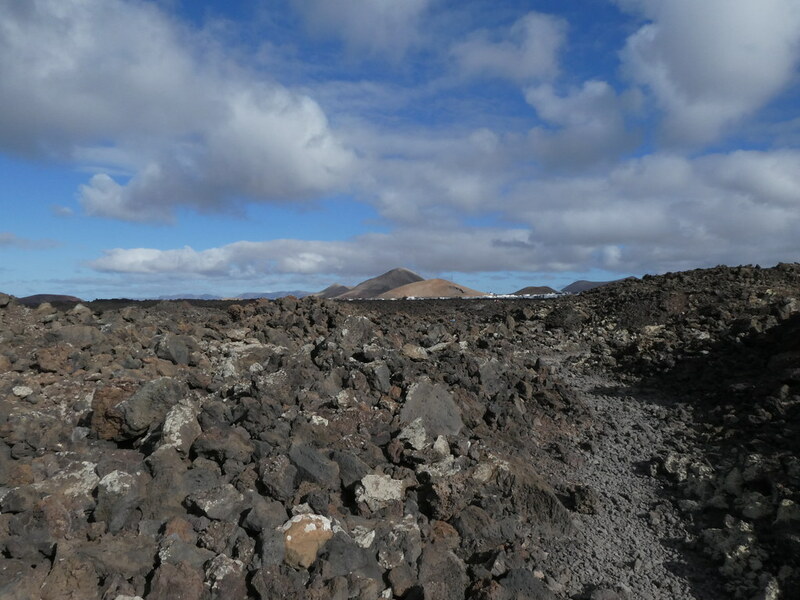 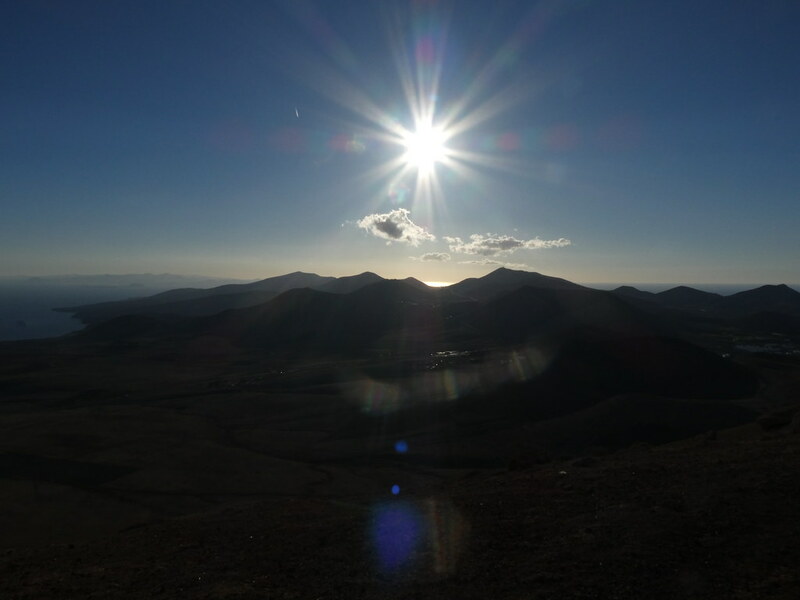 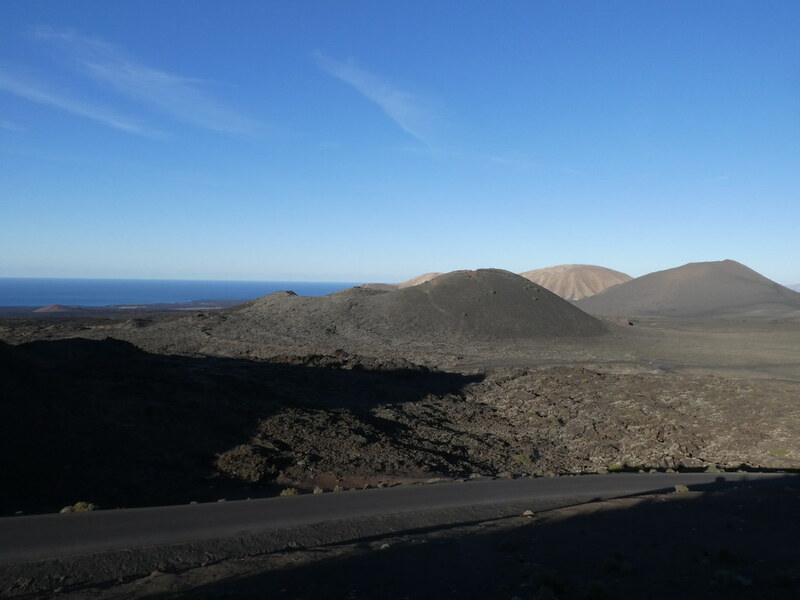 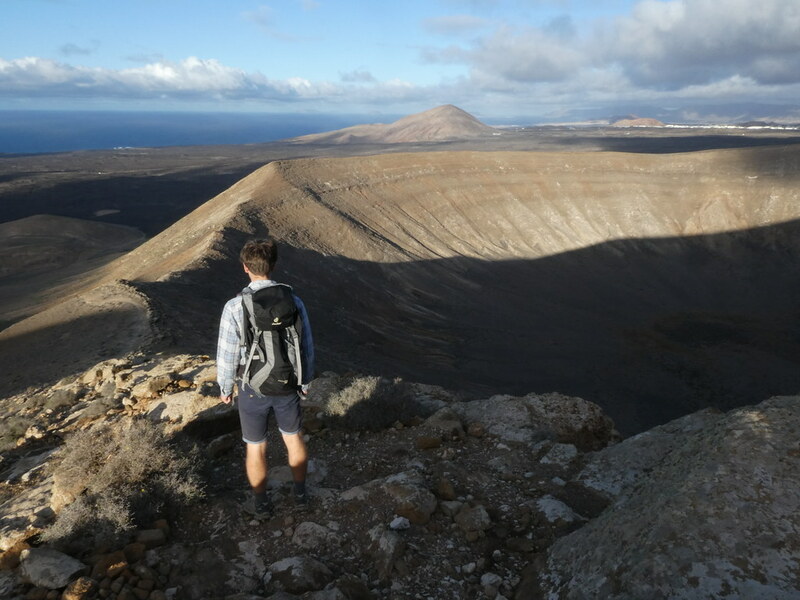 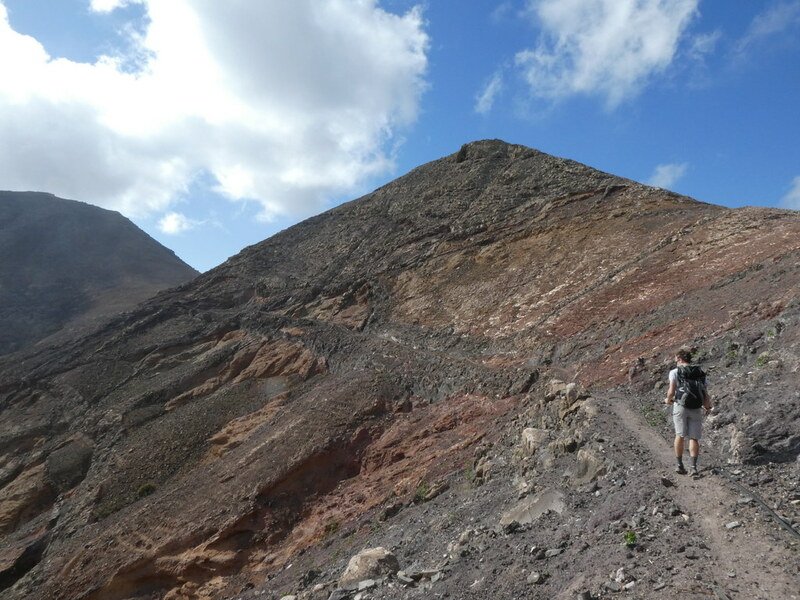 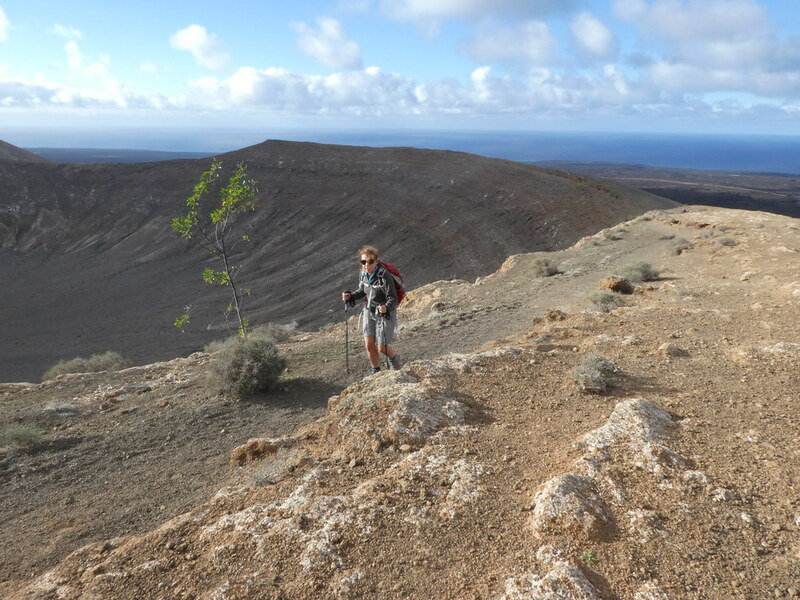 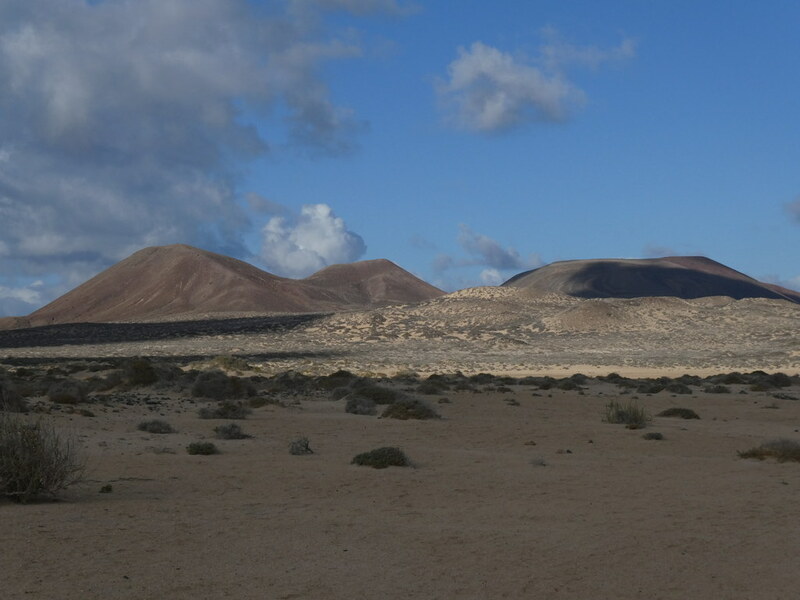 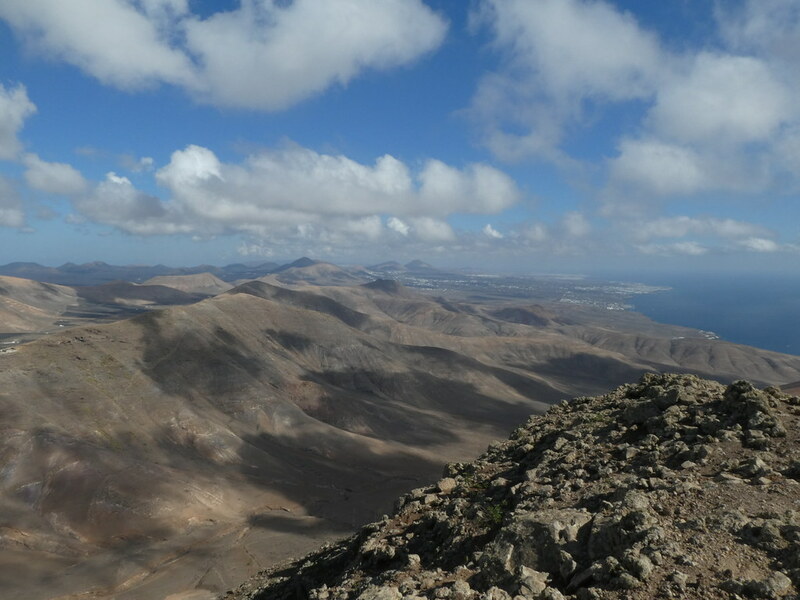 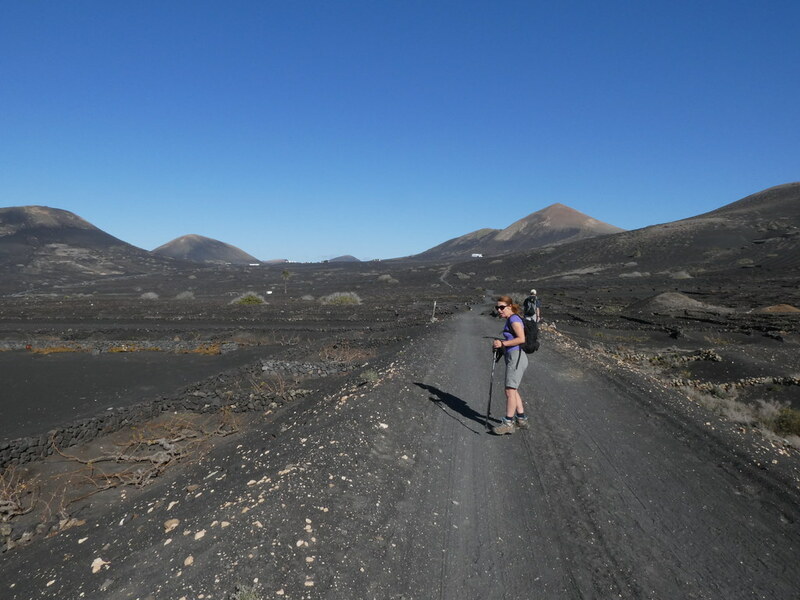 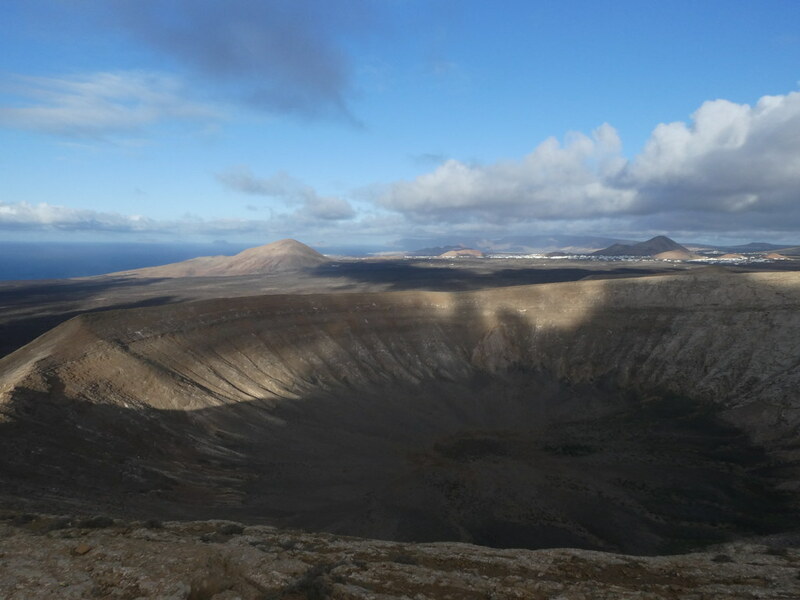 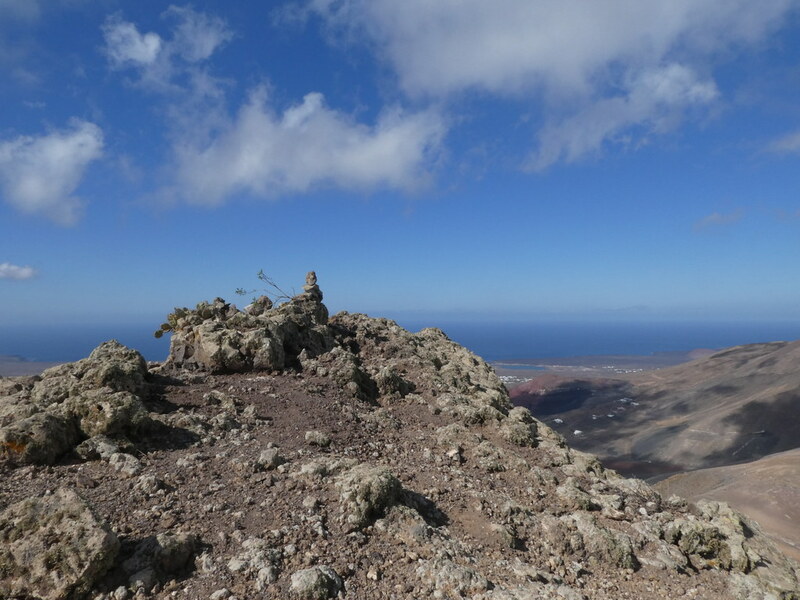 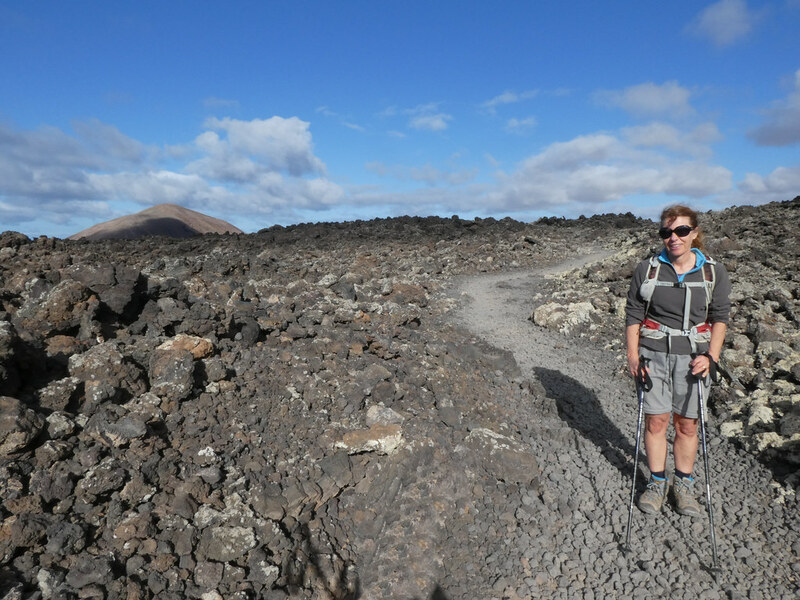 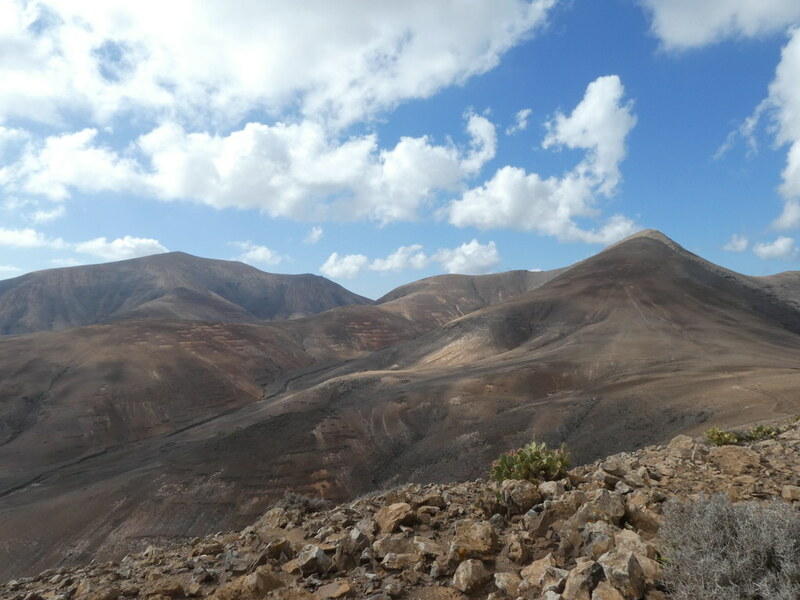 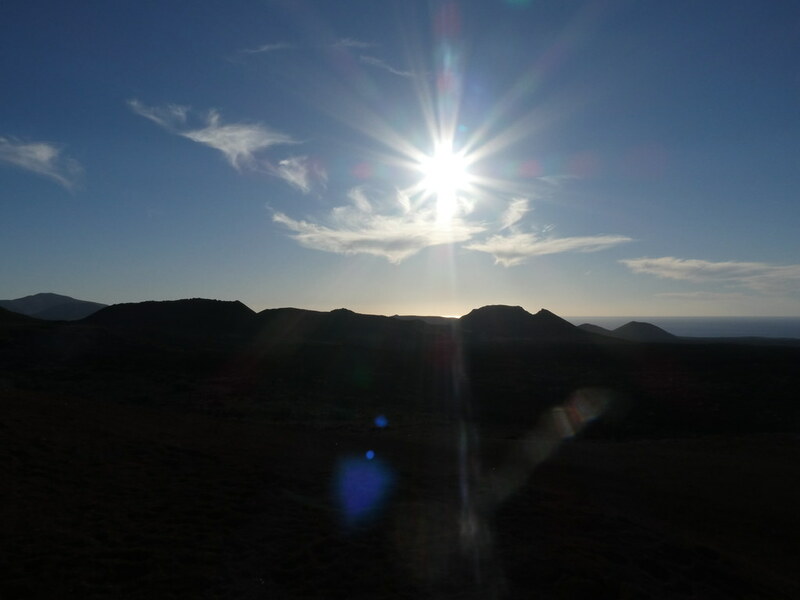 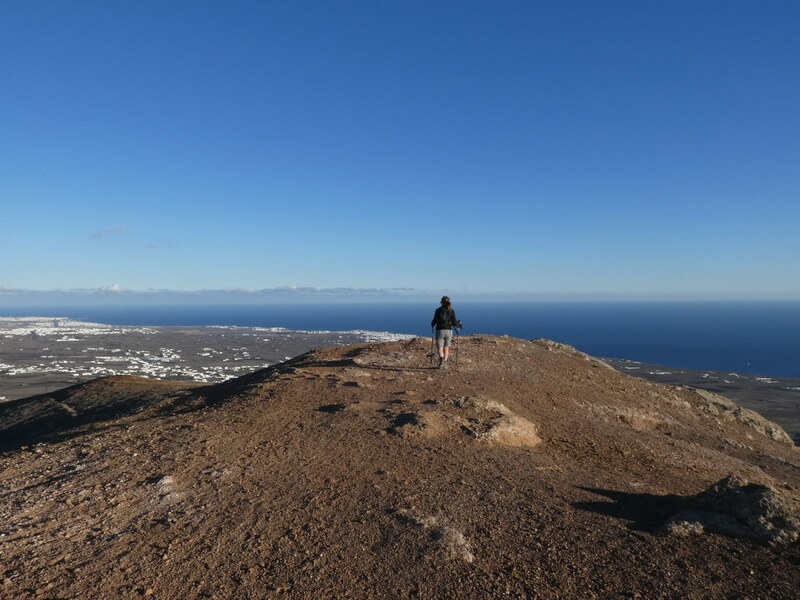 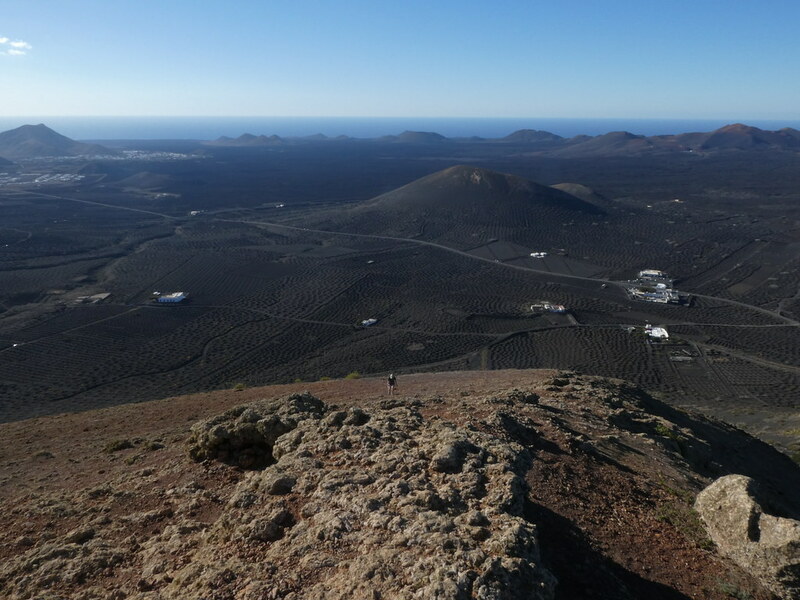 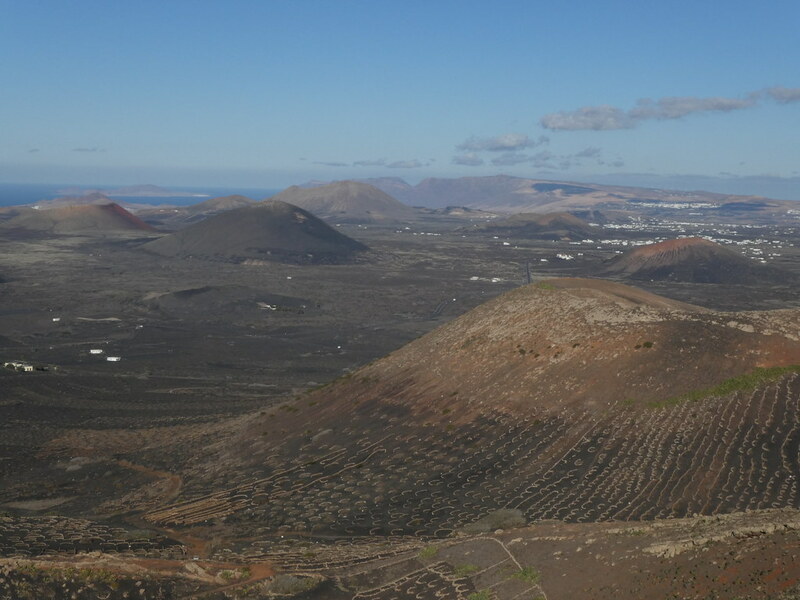 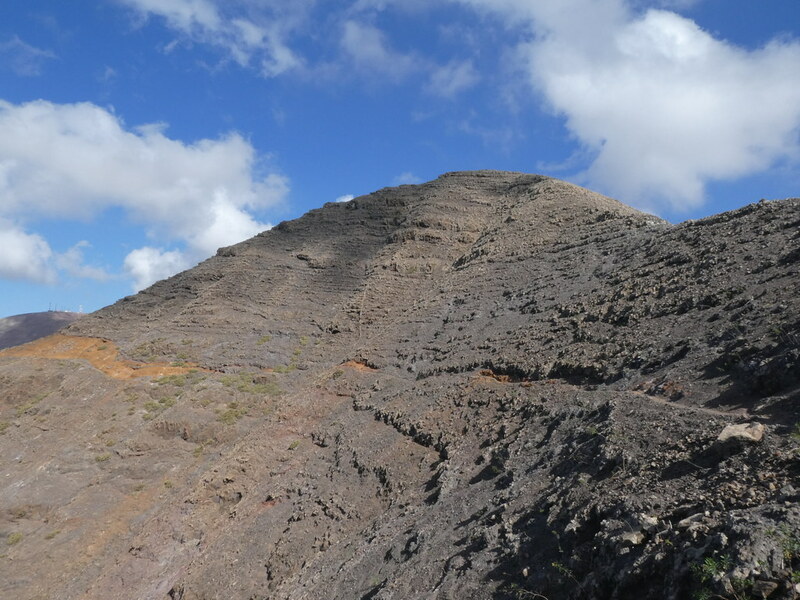 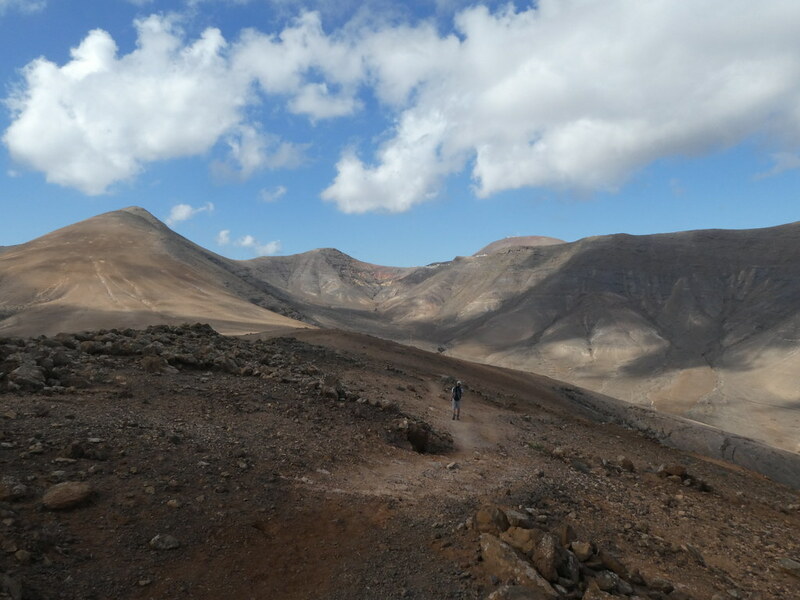 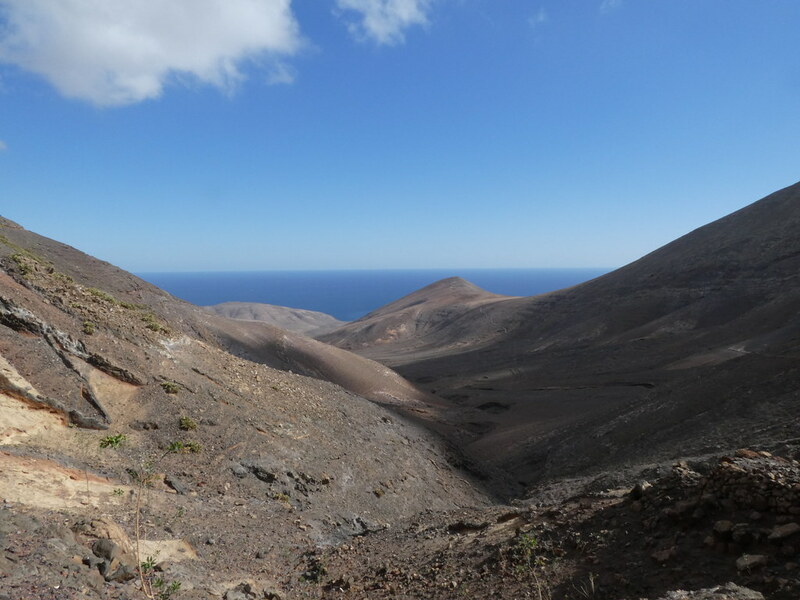 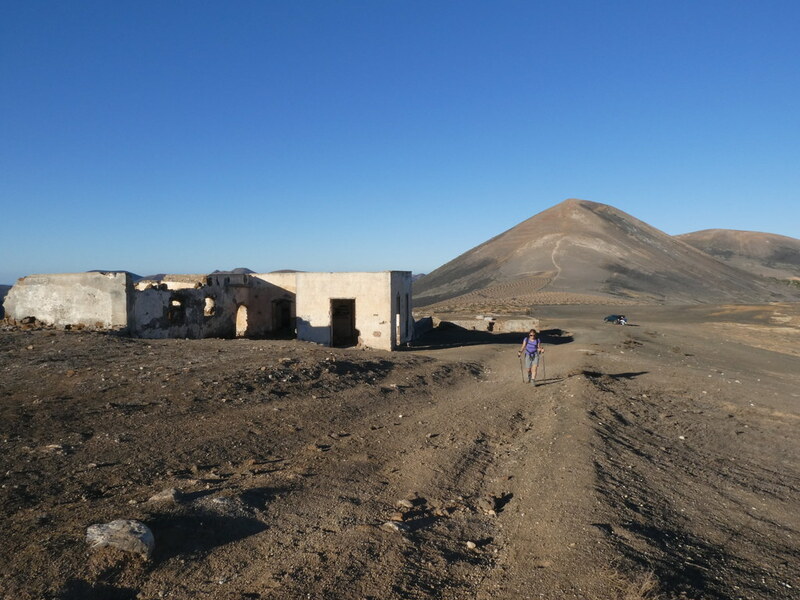 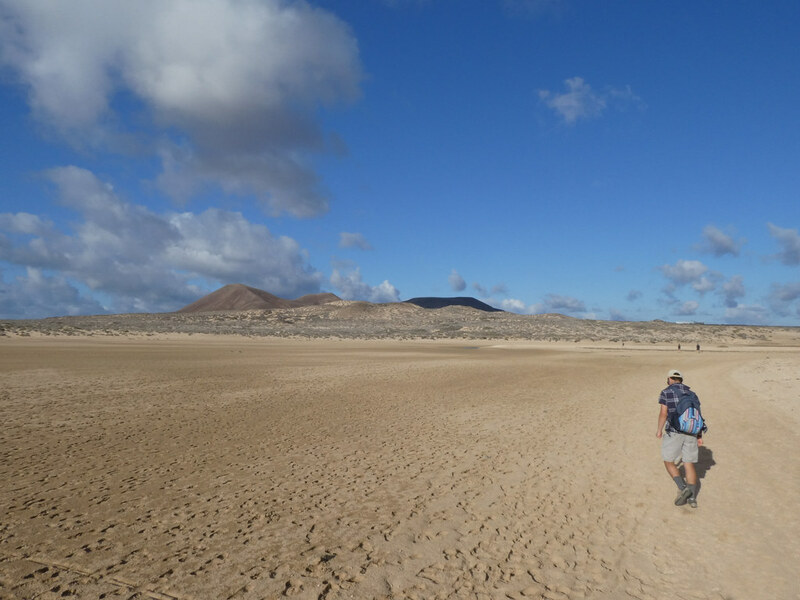 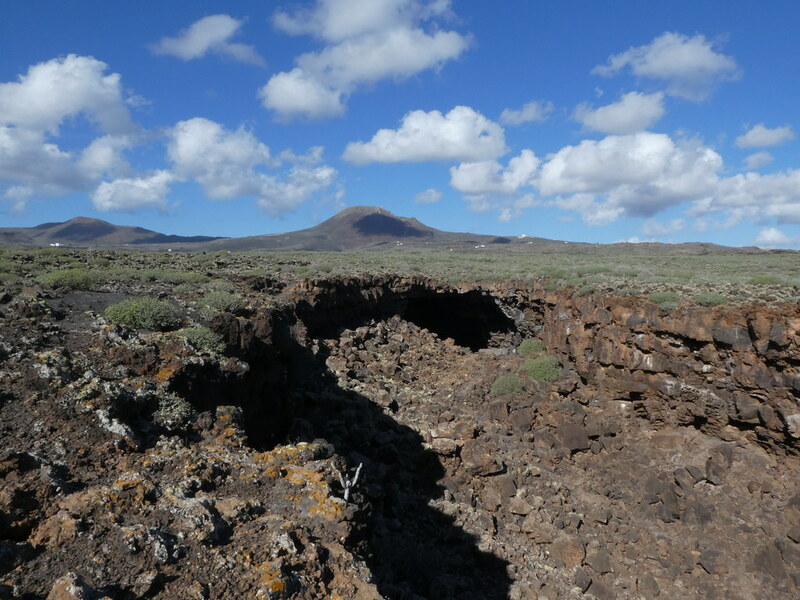 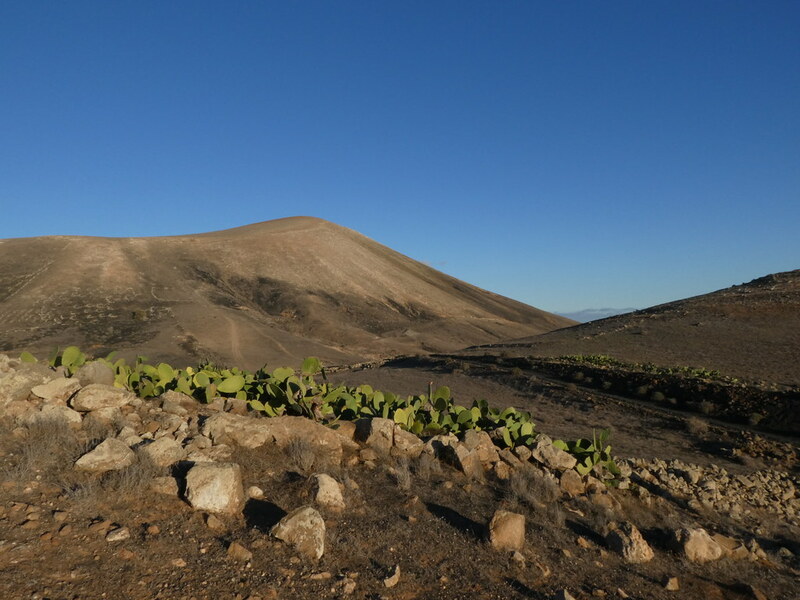 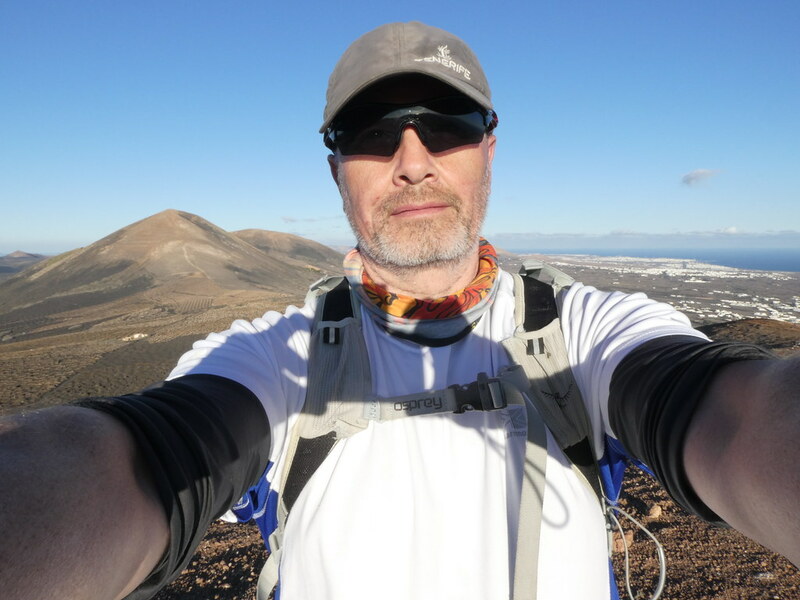 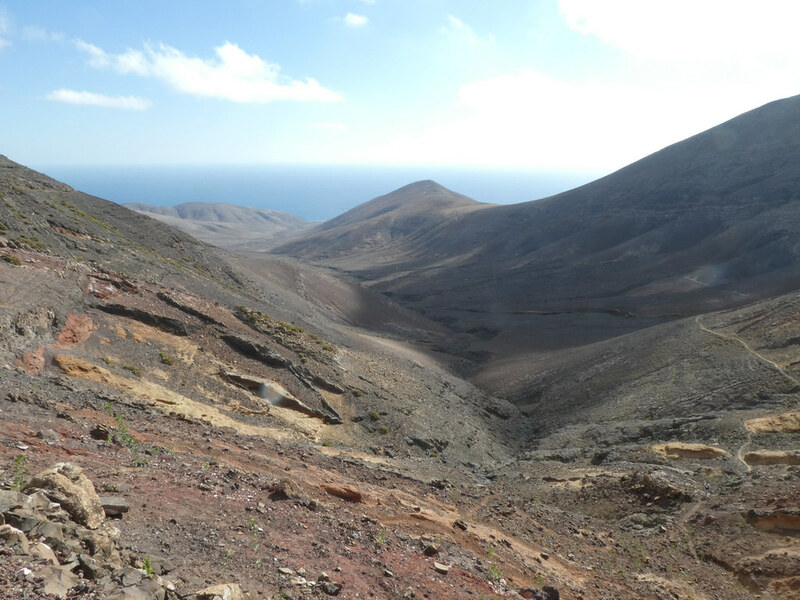 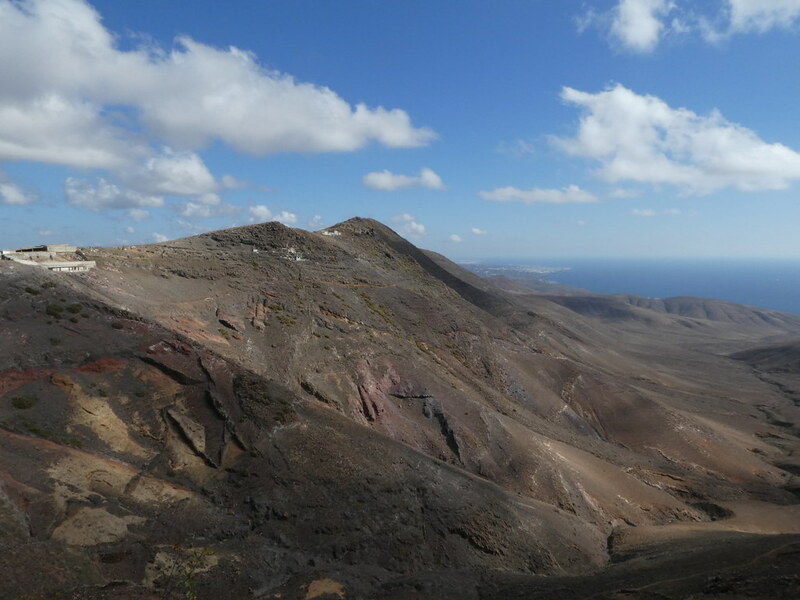 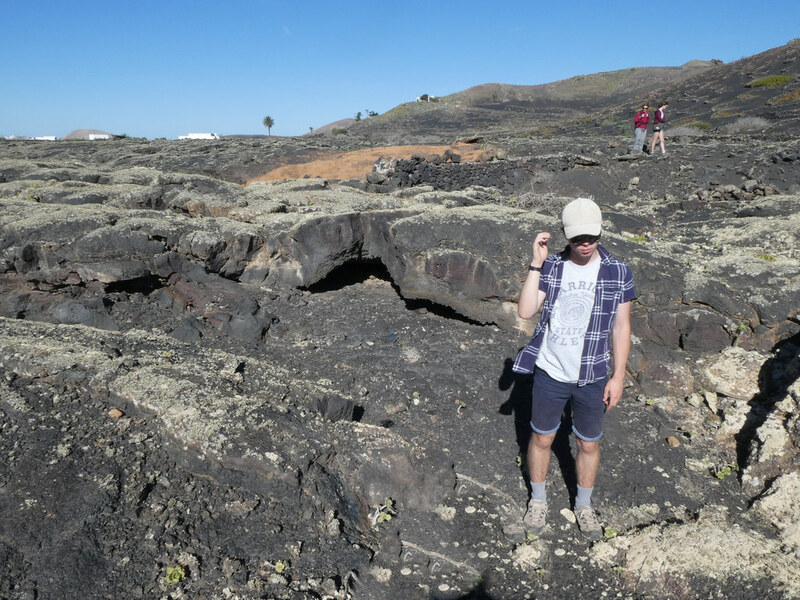 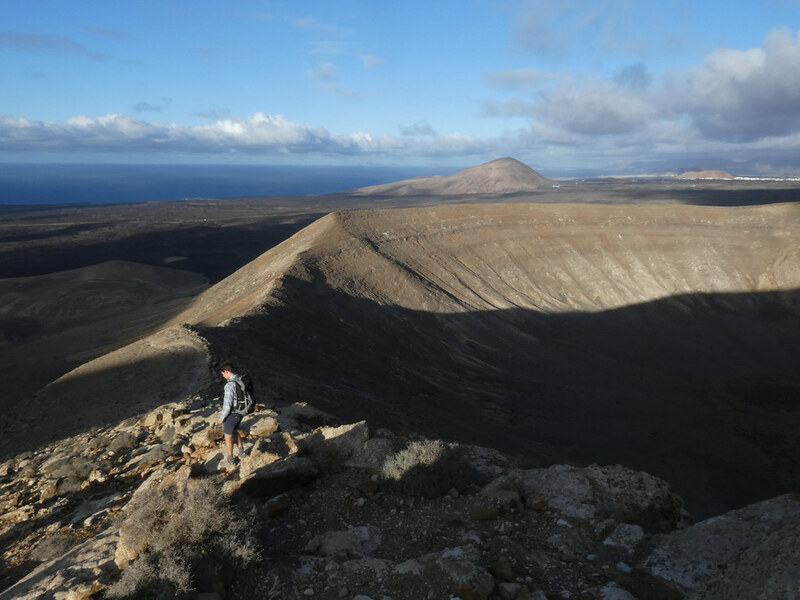 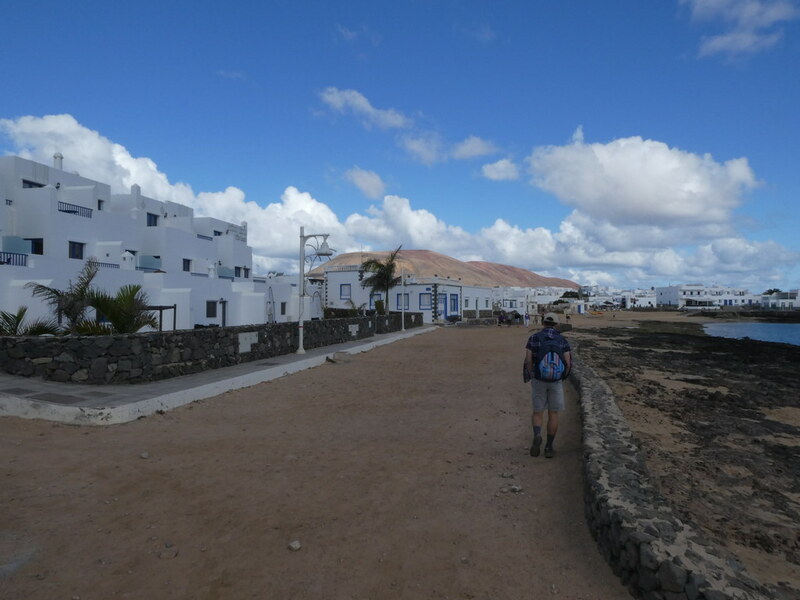 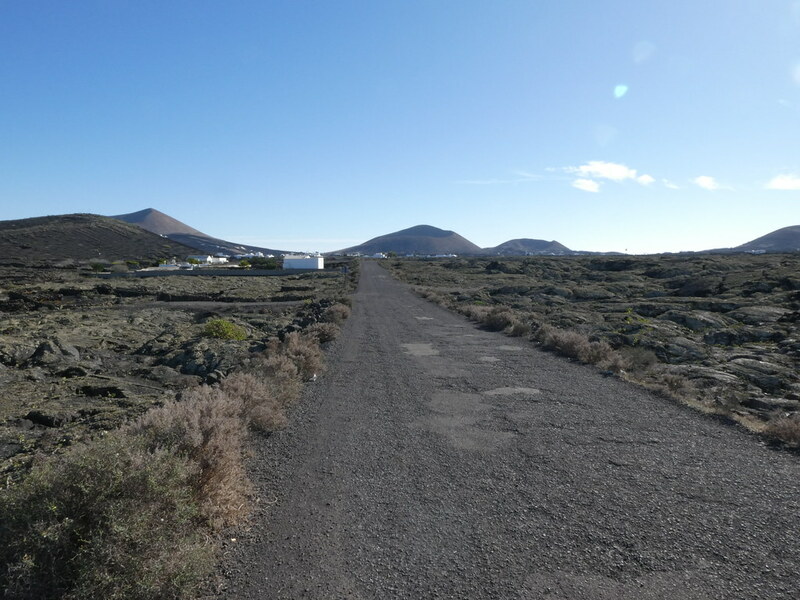 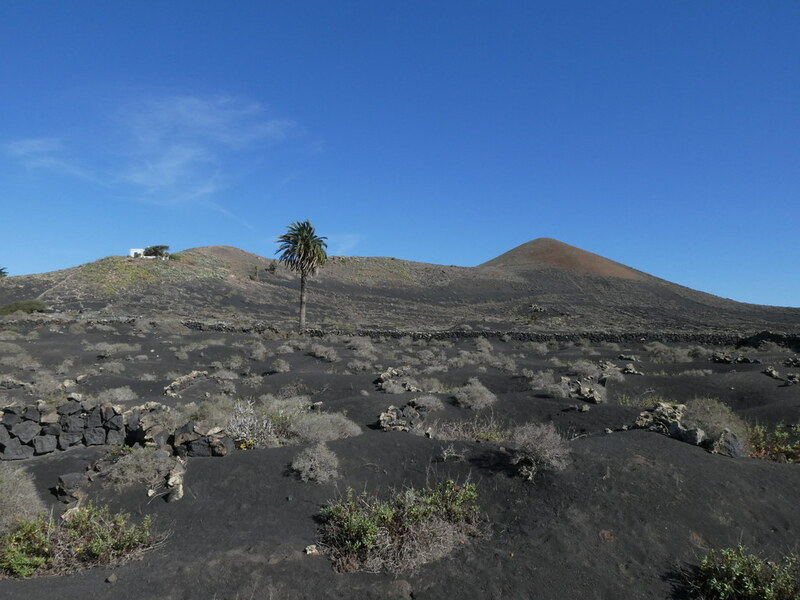 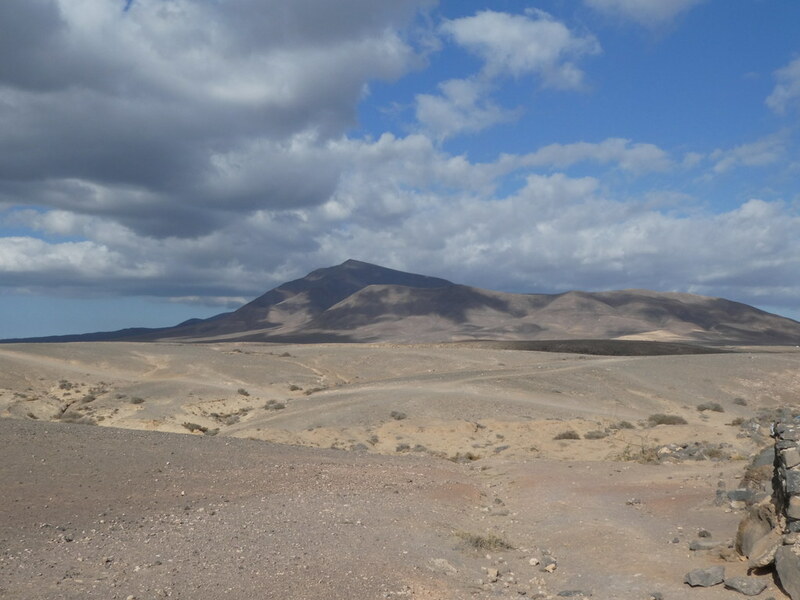 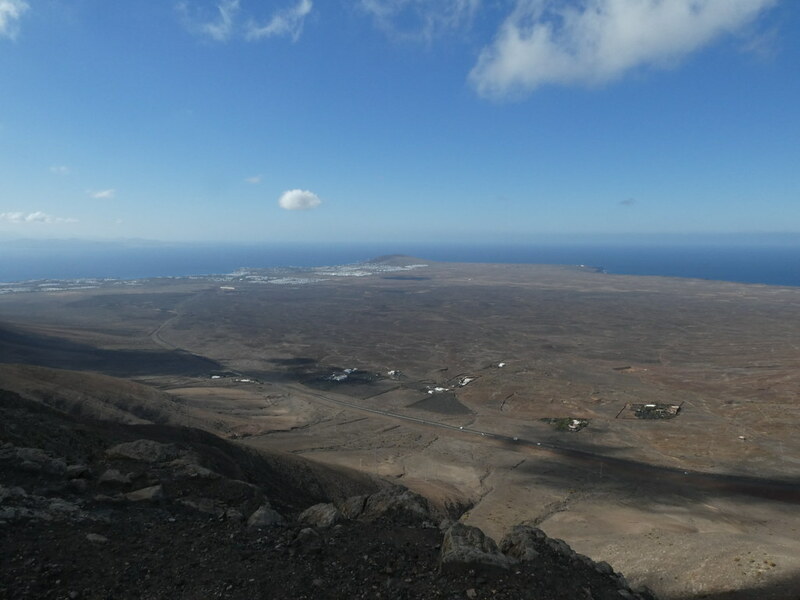 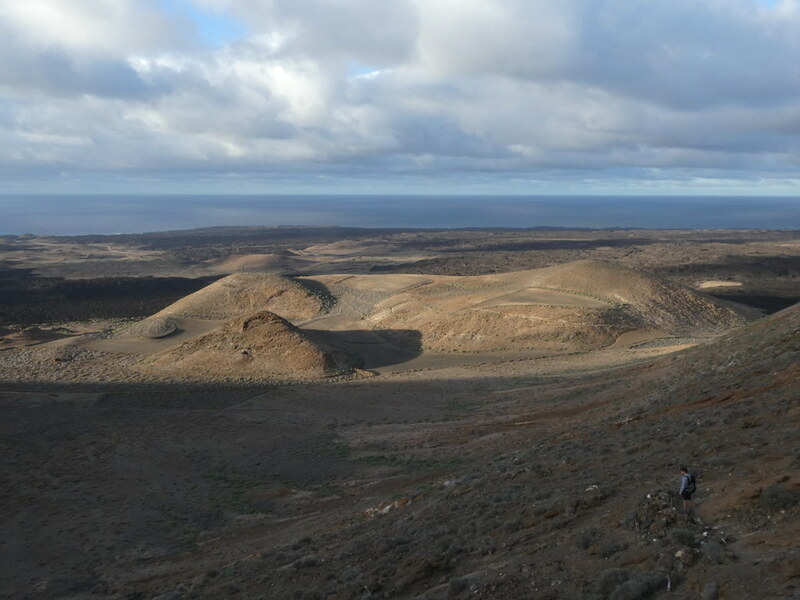 I wasn’t sure what to expect from the walking on Lanzarote but its magnificent, fascinating and surreally beautiful. 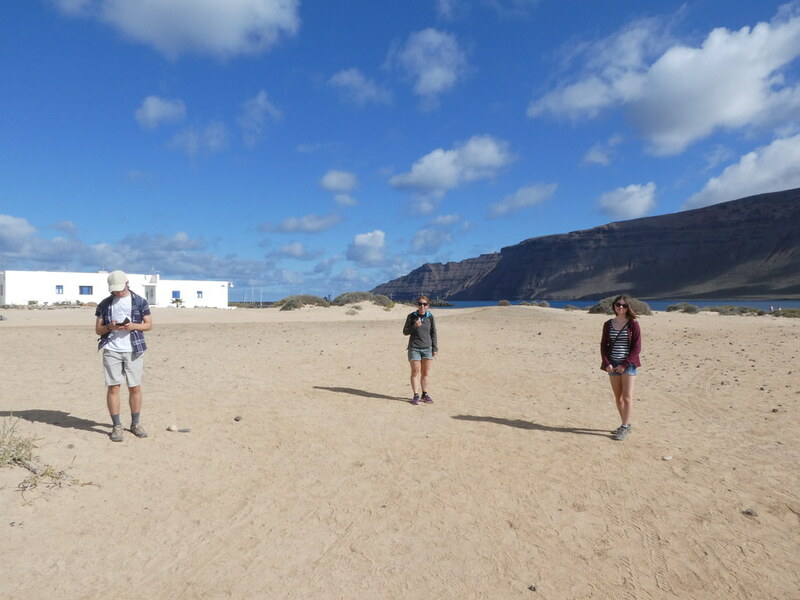 This half a day walk was amazing and one of the highlights of the trip. 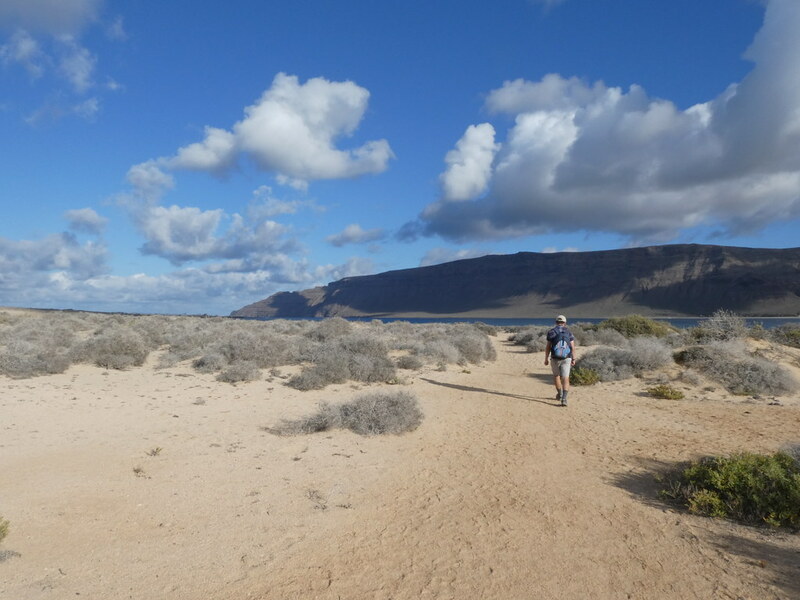 Boxing Day sales in a retail park or a walk like this? 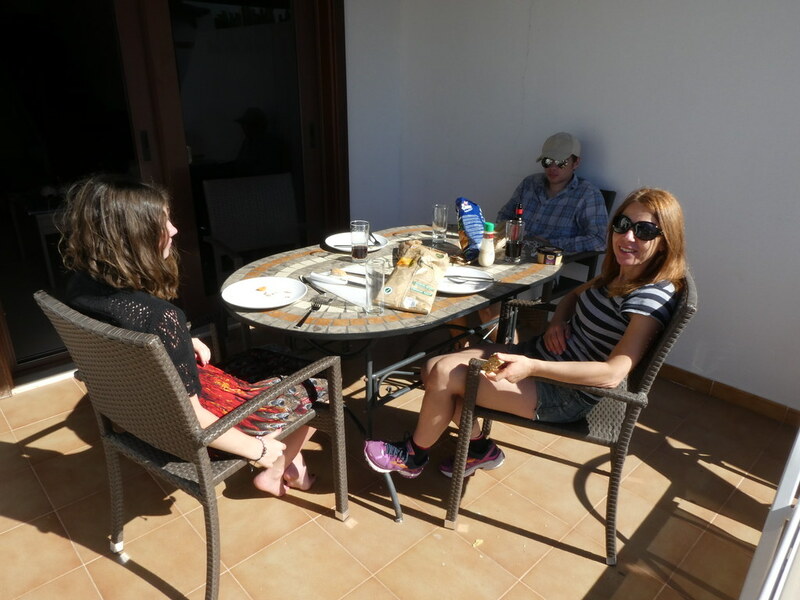 Finish the day with an improvised Xmas dinner (no dates in blankets!) 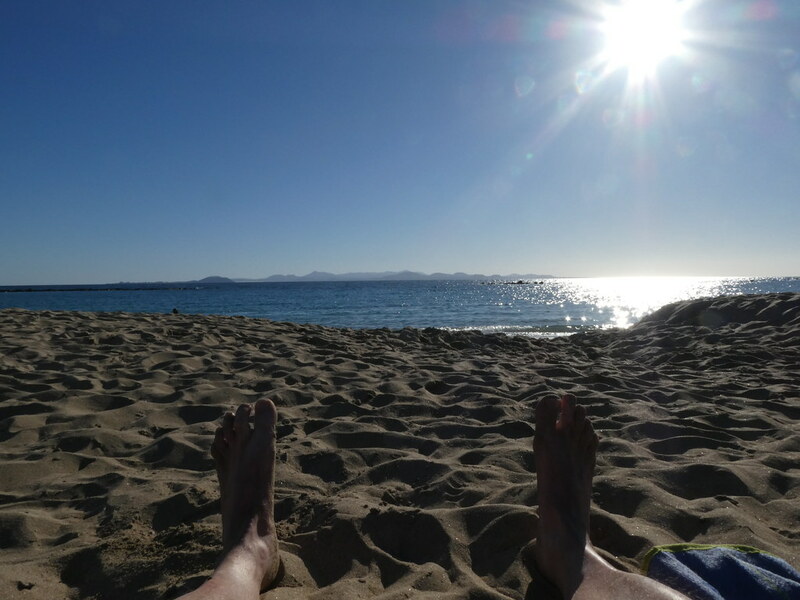 and a bottle of cheap Cava. 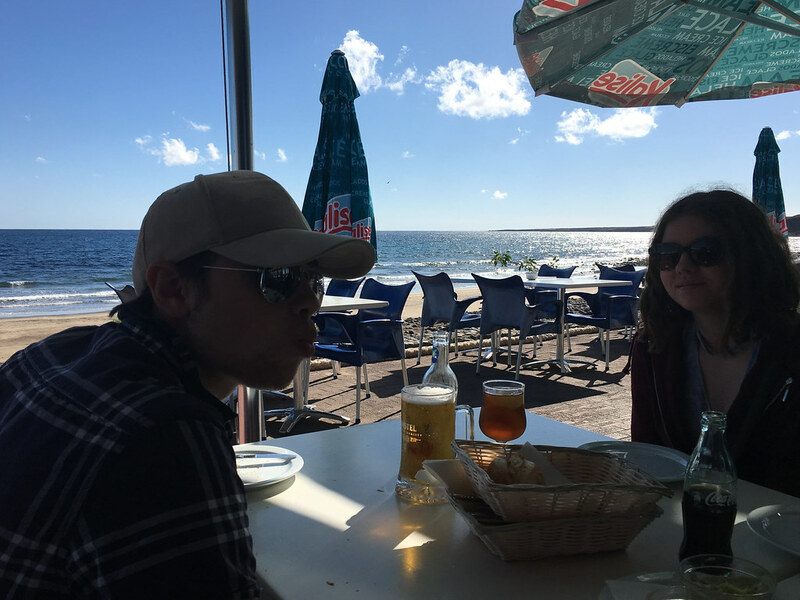 I’m a firm believer in keeping traditions going. 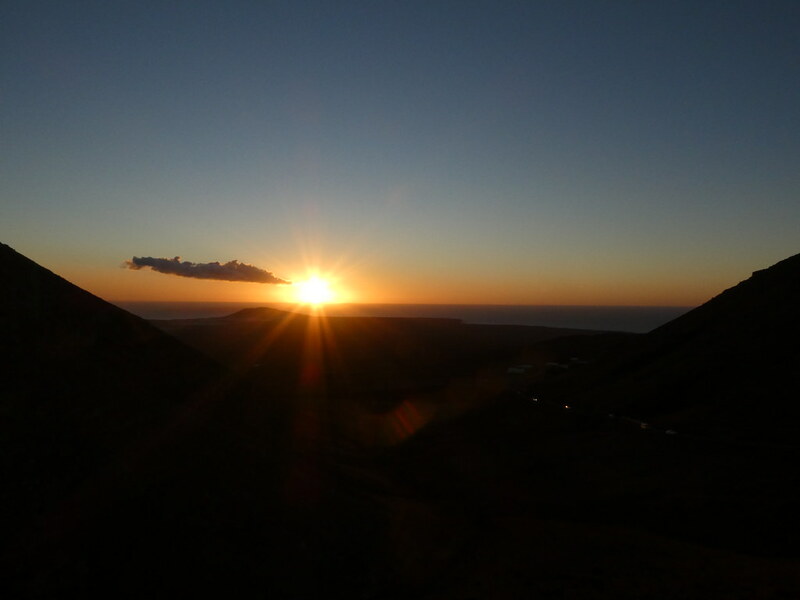 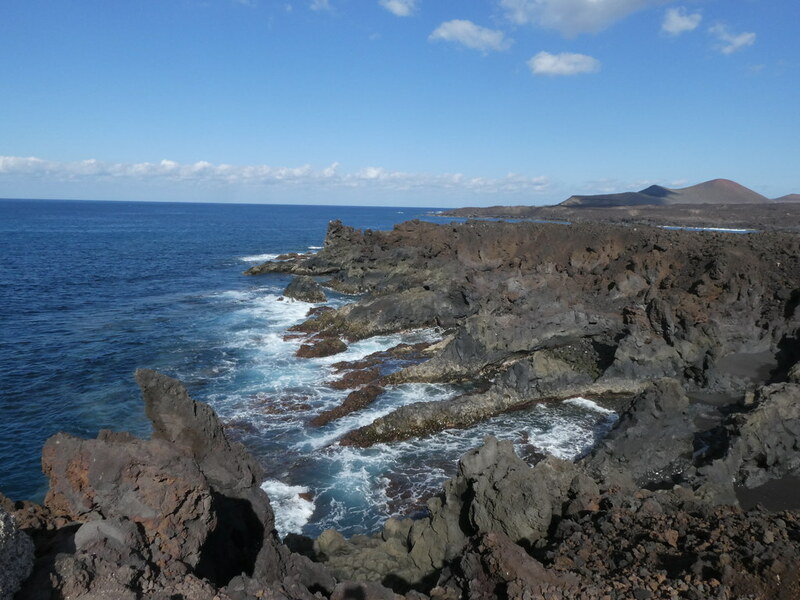 I’m sure there is one that says on Xmas Eve you should go out and explore a volcanic landscape and have fish for lunch. 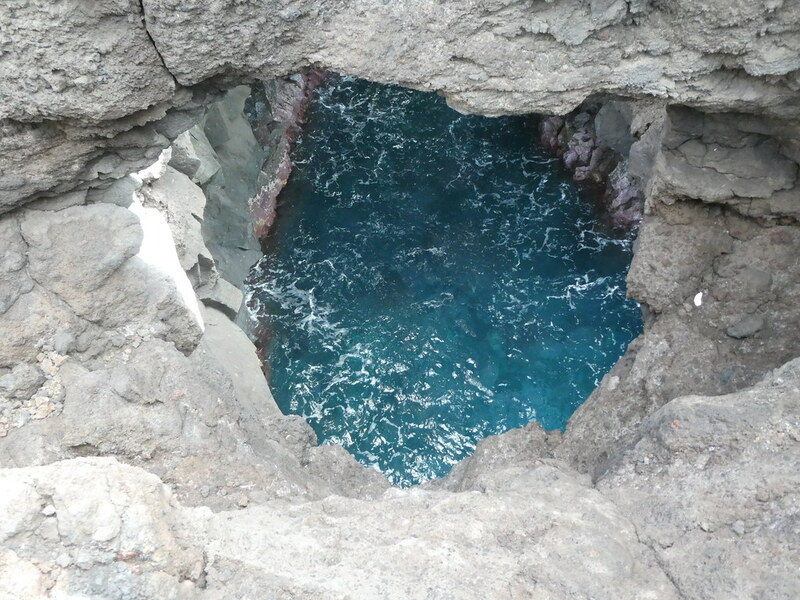 How can you break with that! 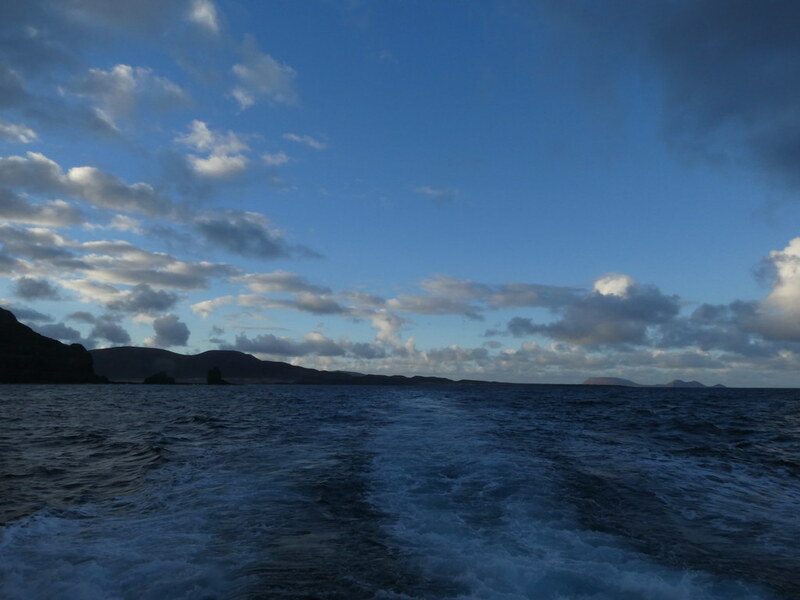 Off to the north part of the island first to look at some lava caves. 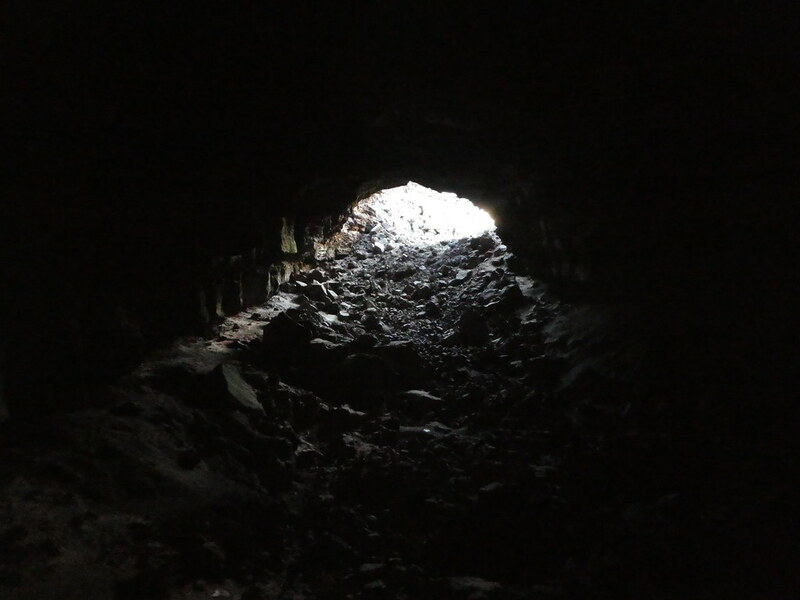 You can pay to go around one but a little research told me that a mile up the road was one you can take a look at for free. 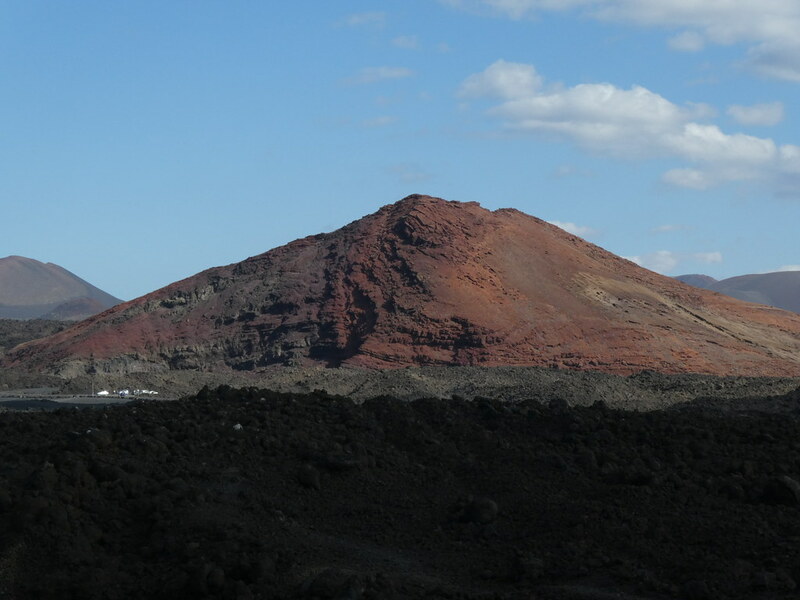 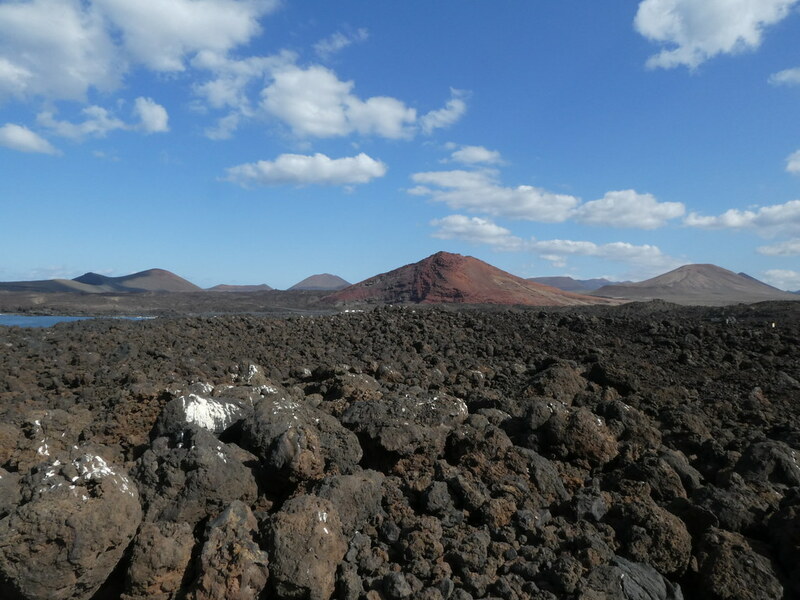 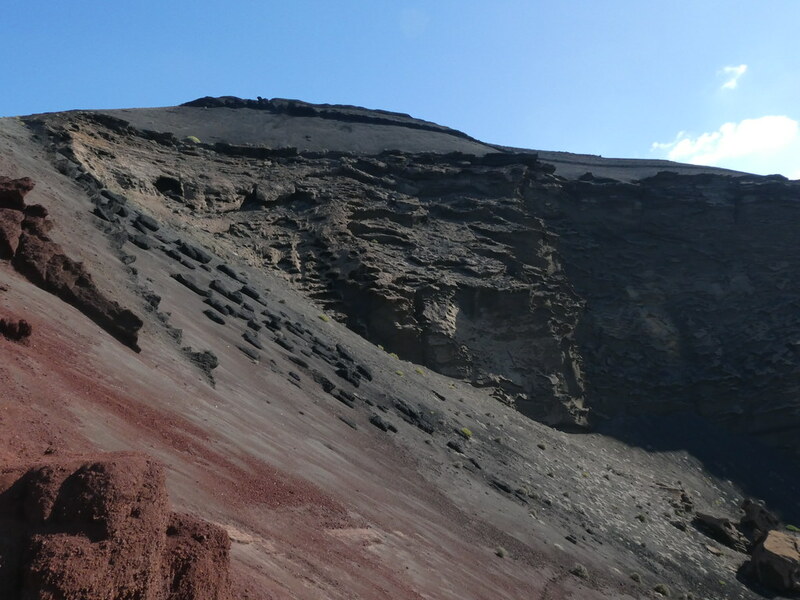 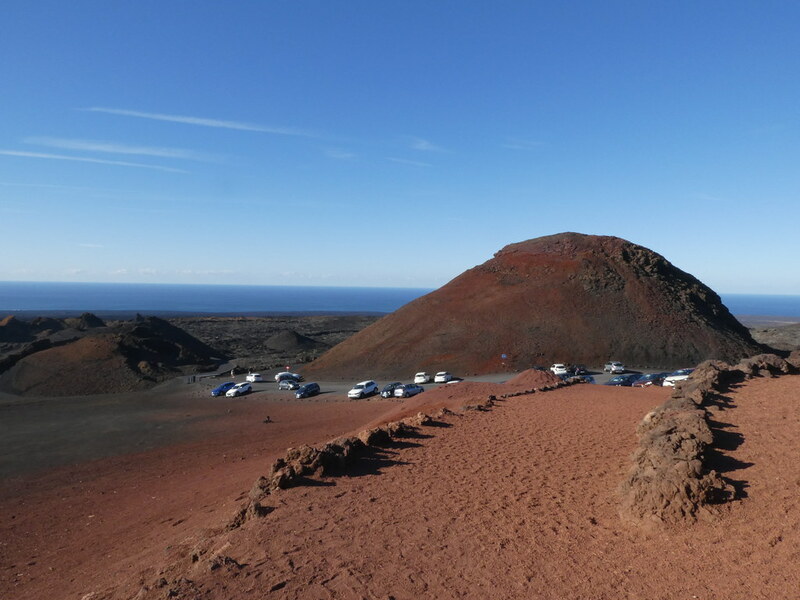 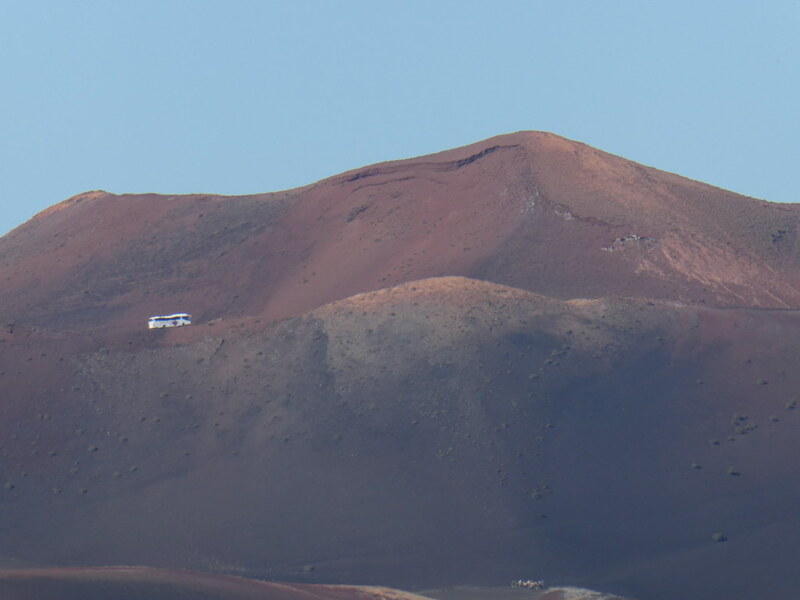 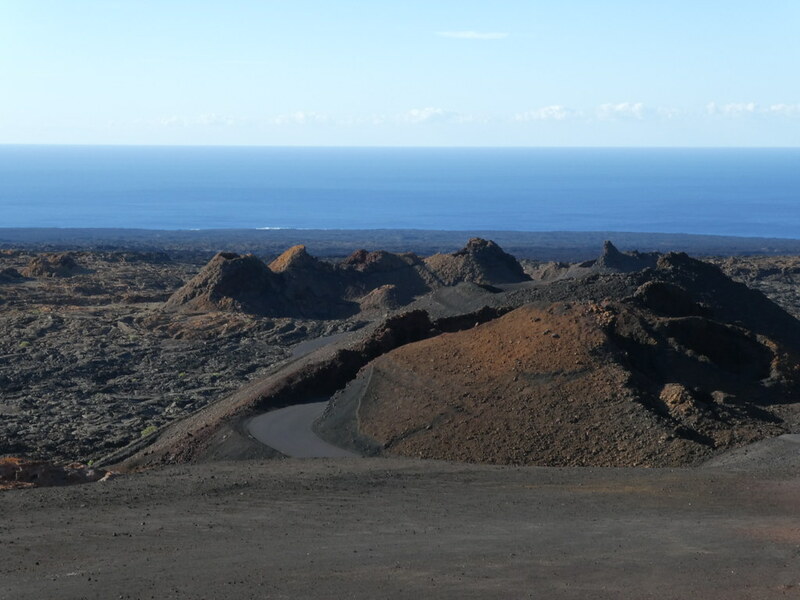 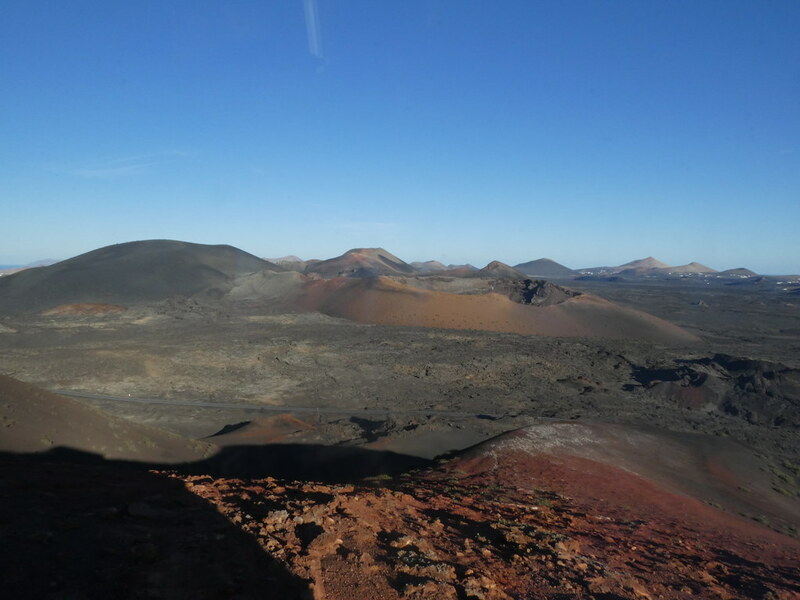 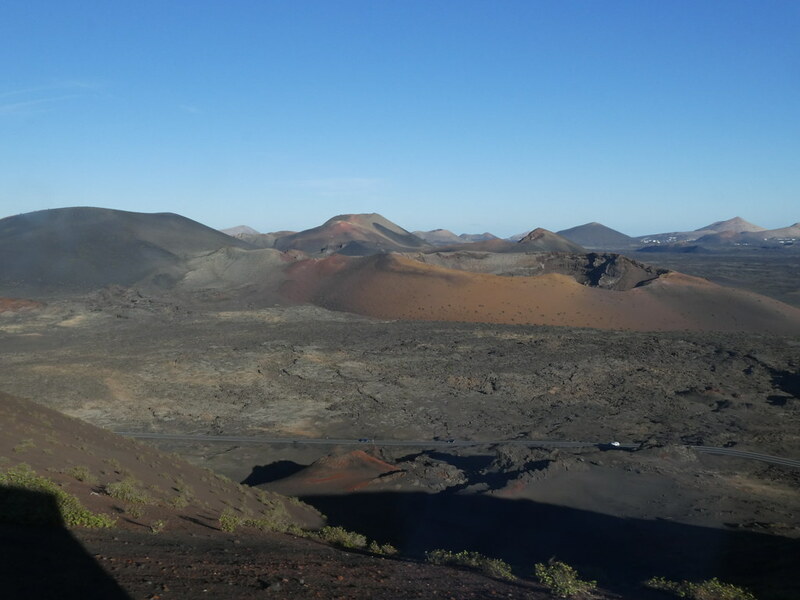 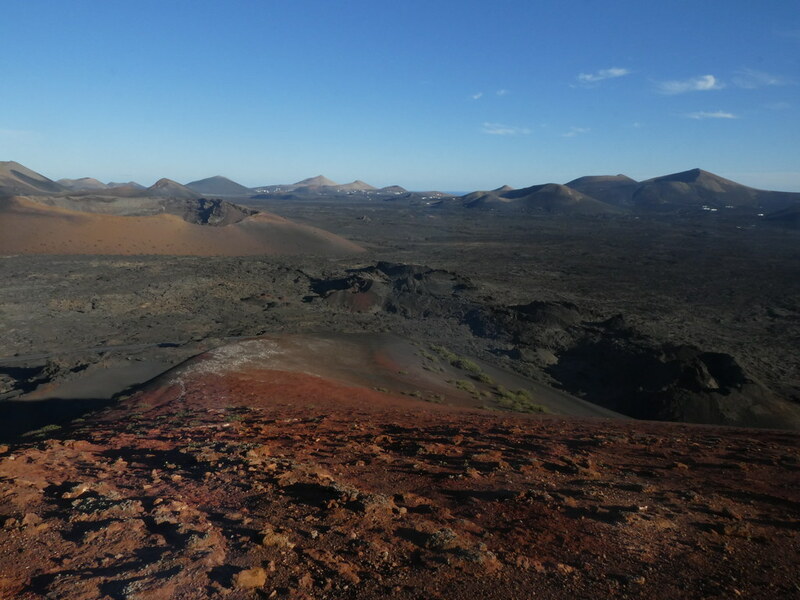 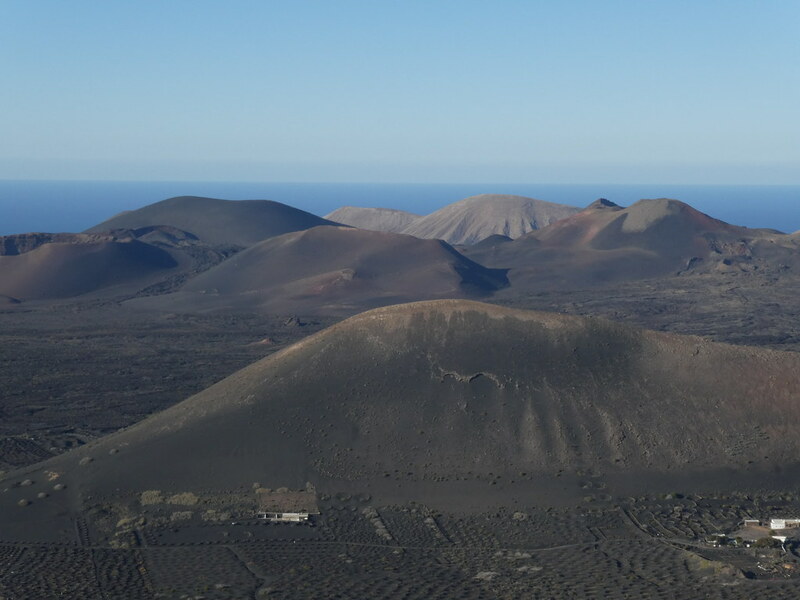 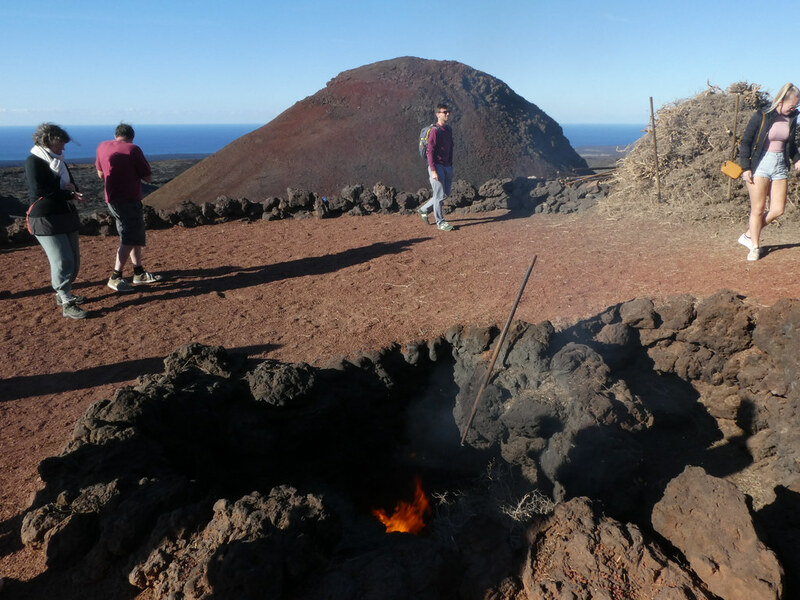 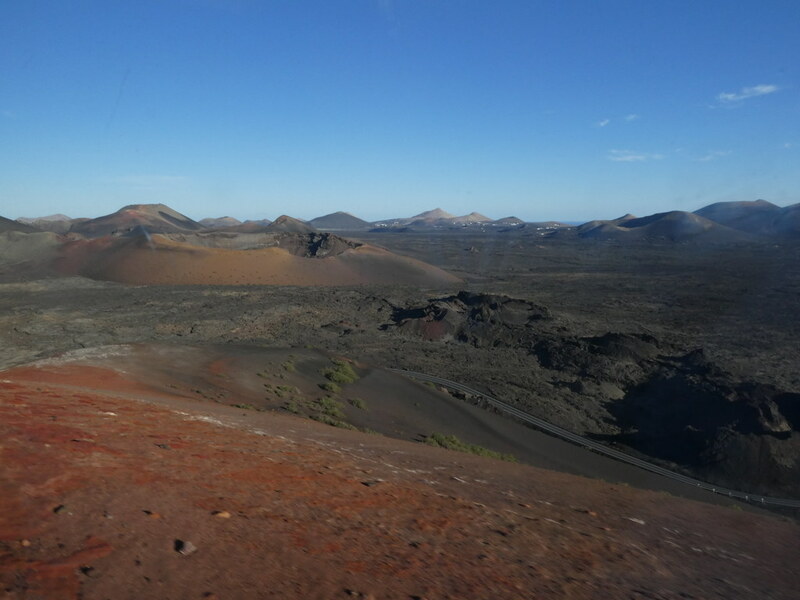 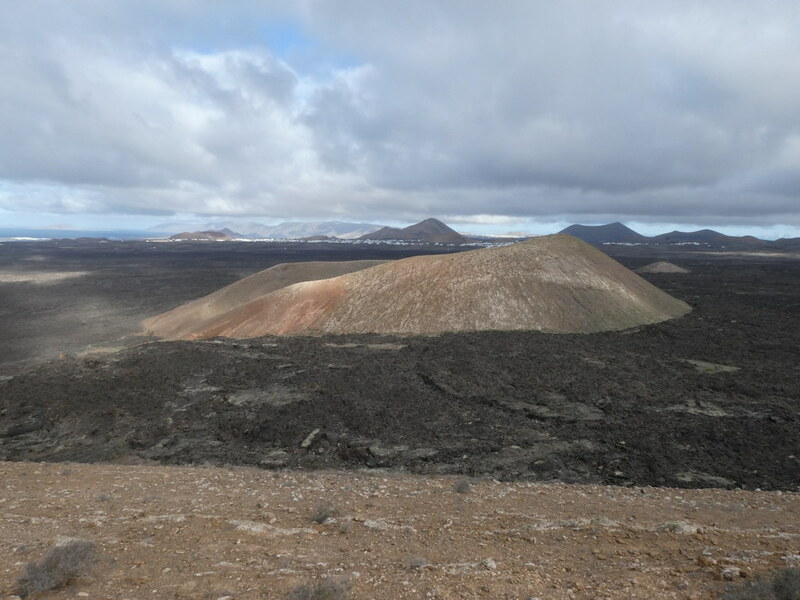 Timanfaya National Park is Lanzarote’s most famous attraction, the site of two major eruptions. 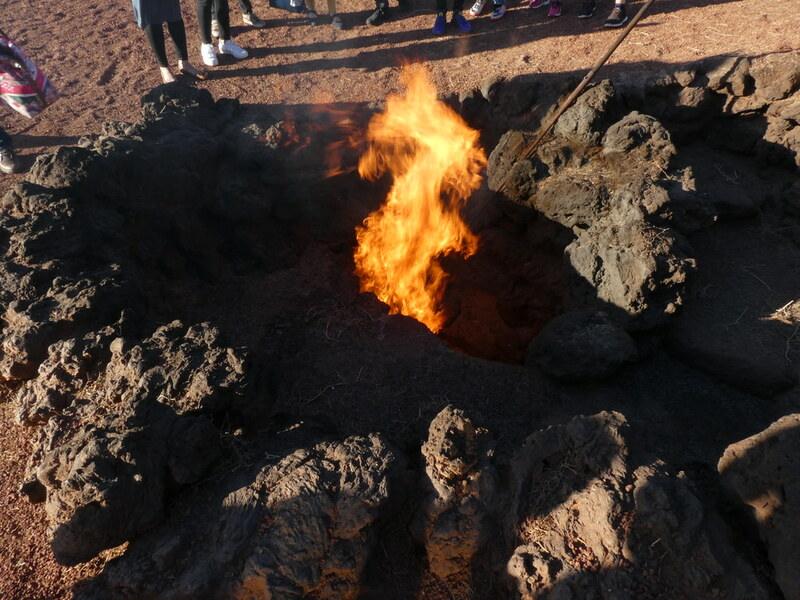 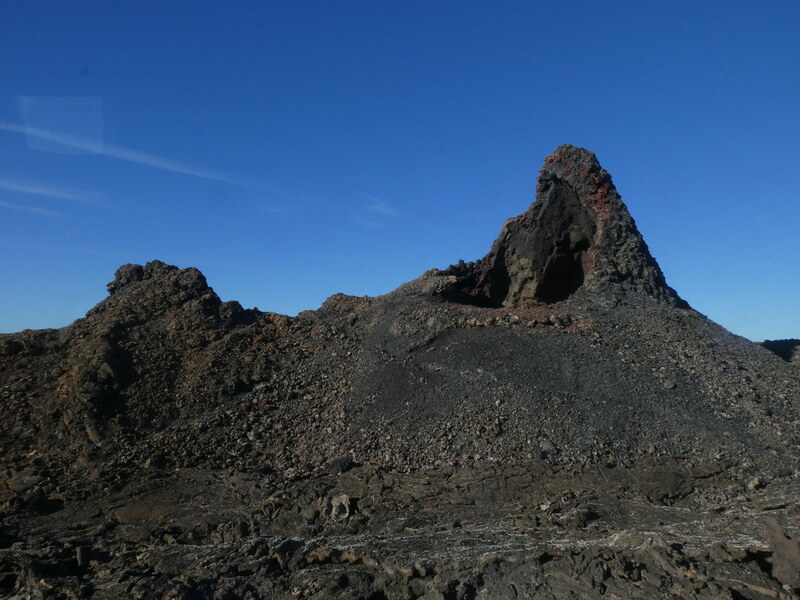 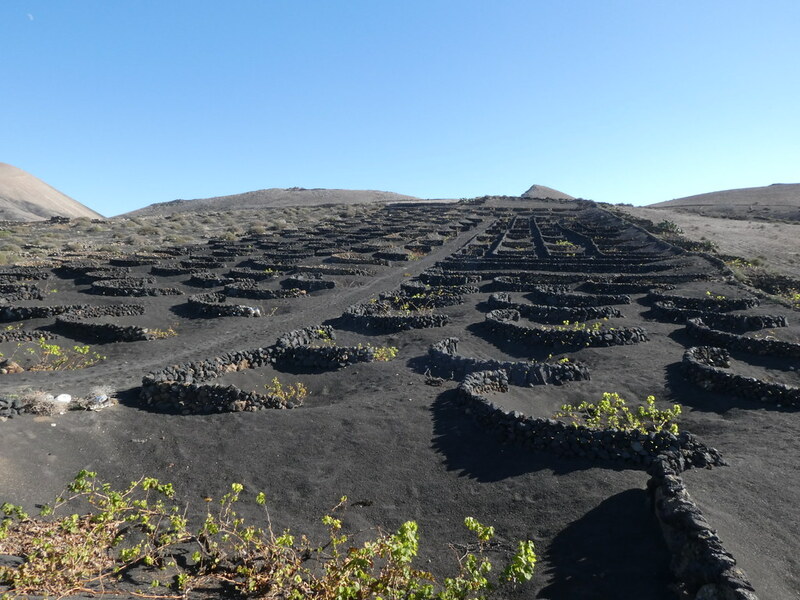 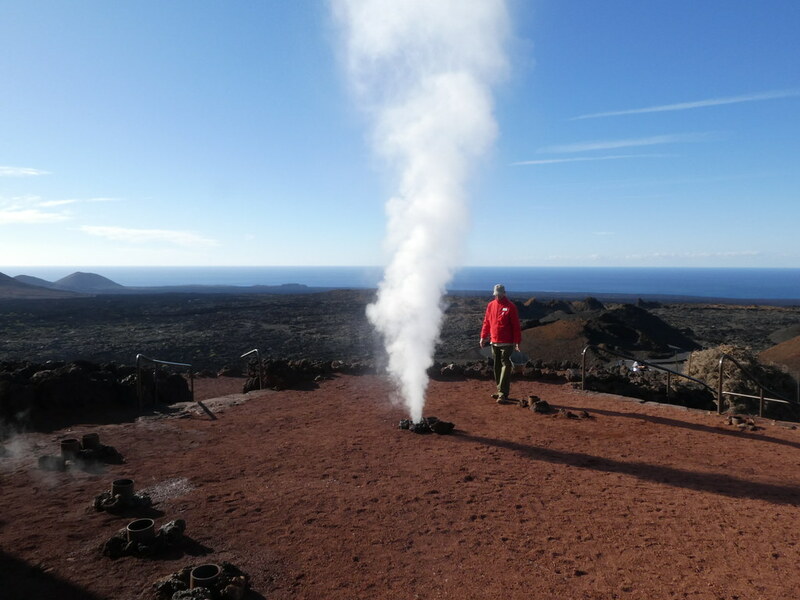 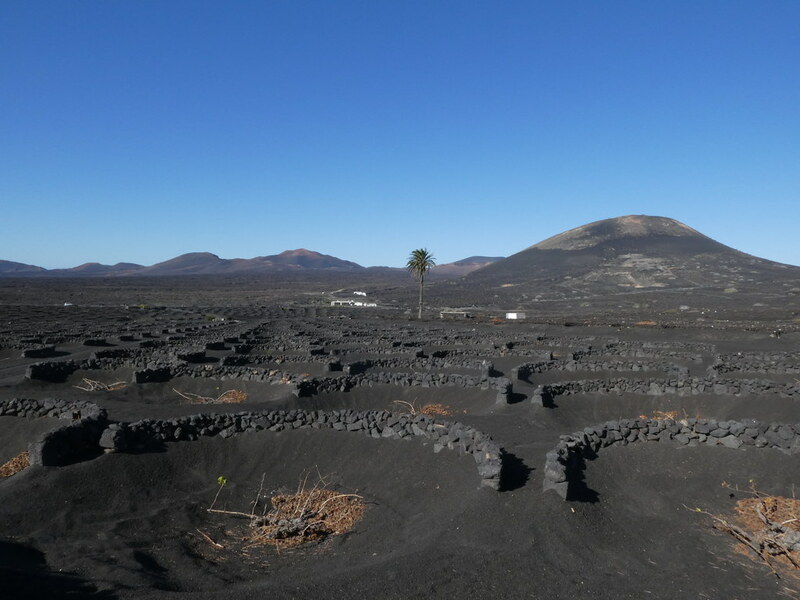 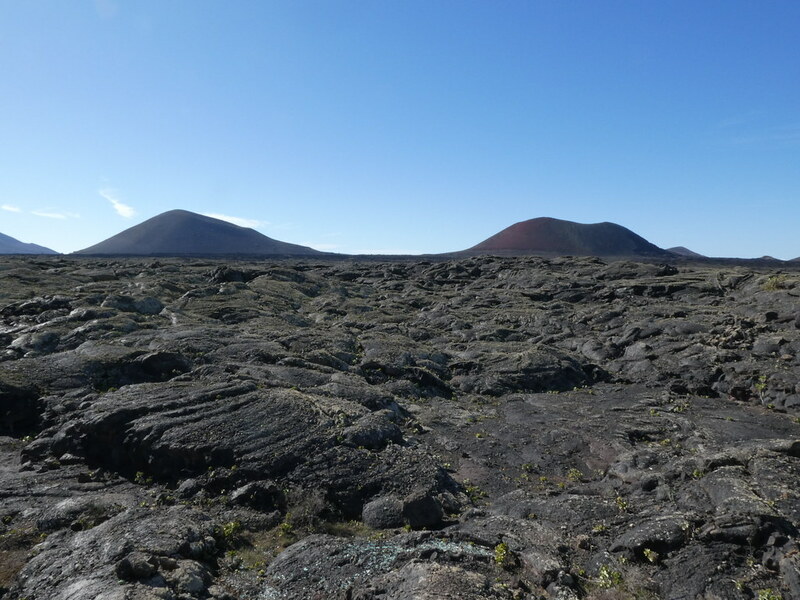 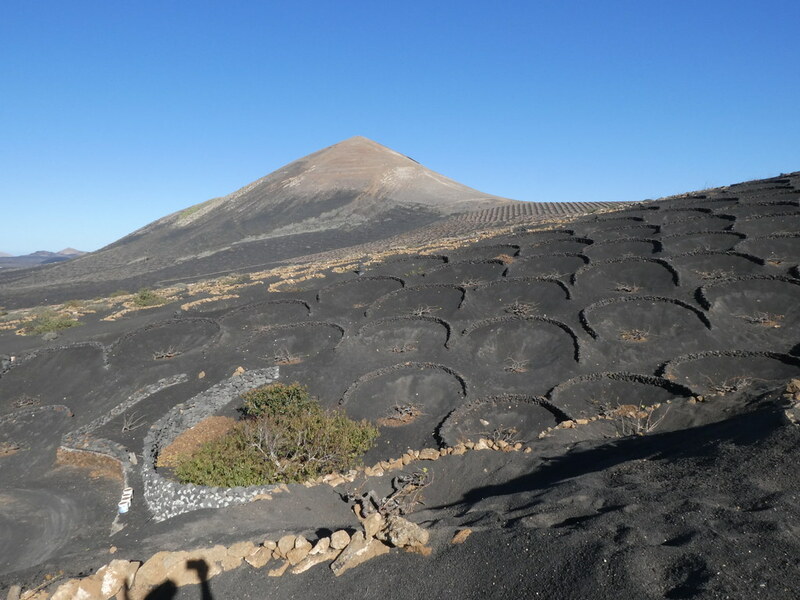 The one in the 16th Century was all blocky lava and ash, the second one in the 17th Century was more fluid lava and plumes of salty mineral waters. 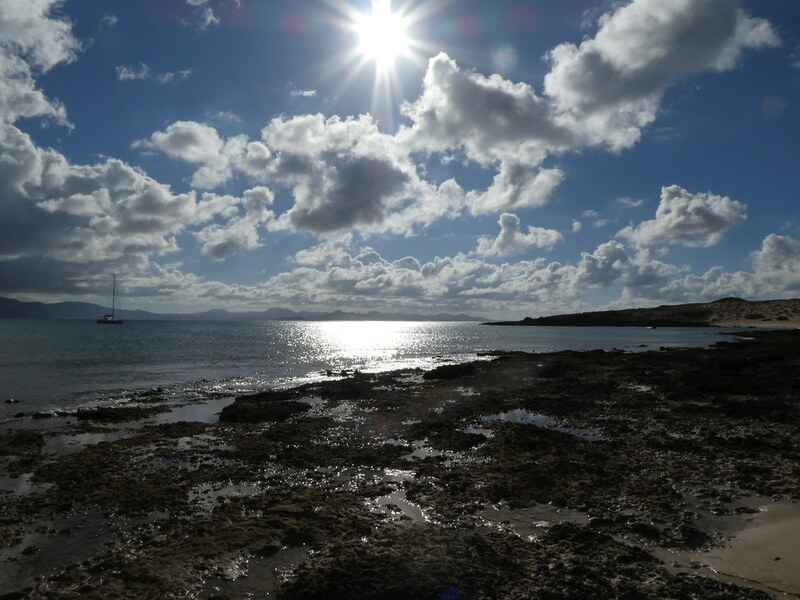 A phrase we used from our university days to describe messing about by the sea when the weather was too bad to walk in the mountains. 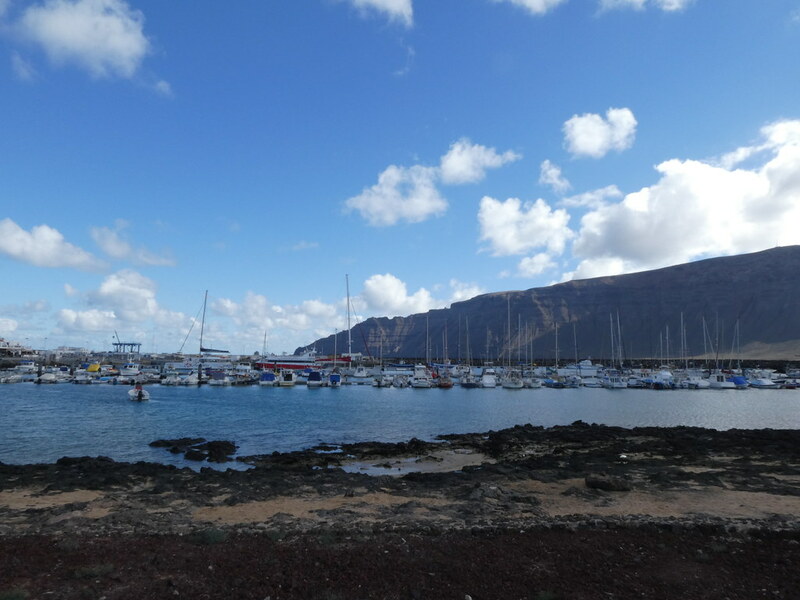 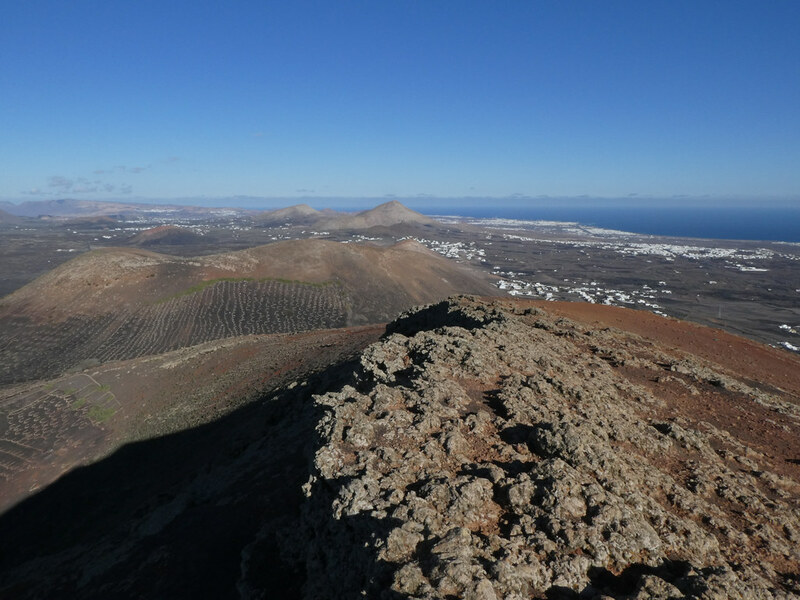 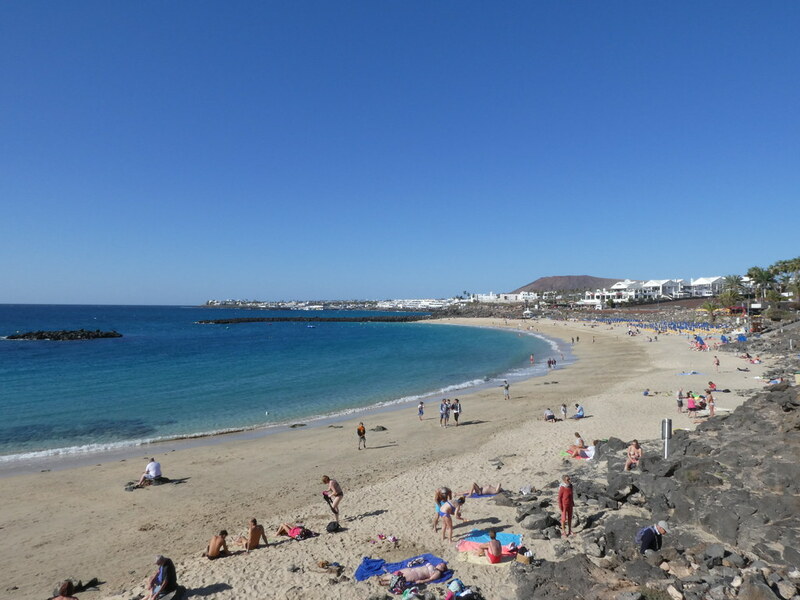 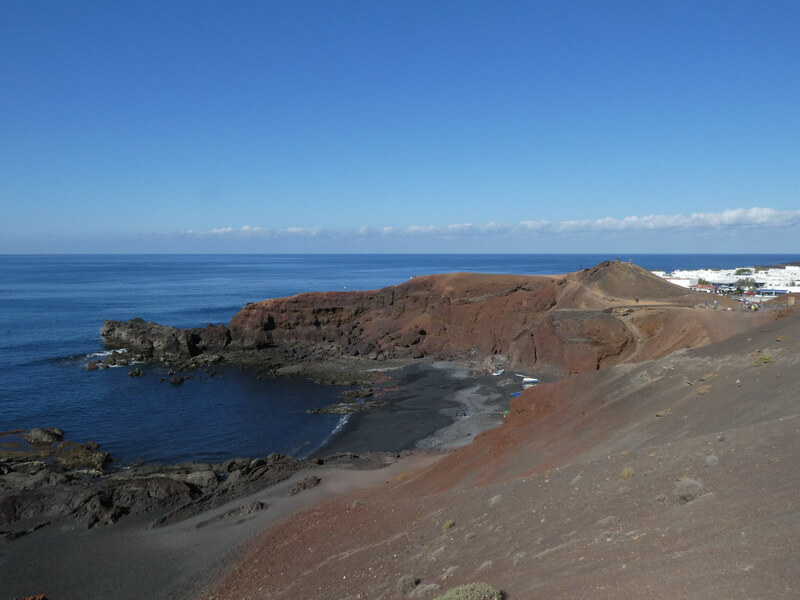 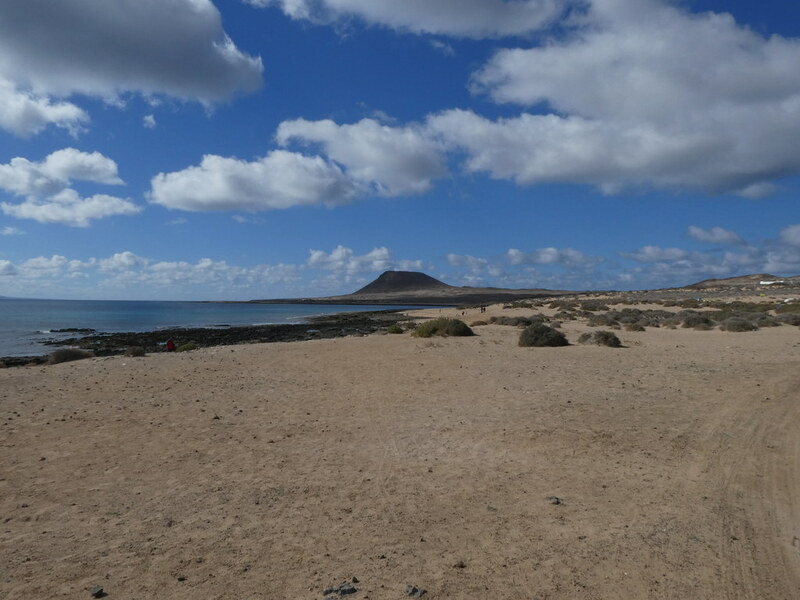 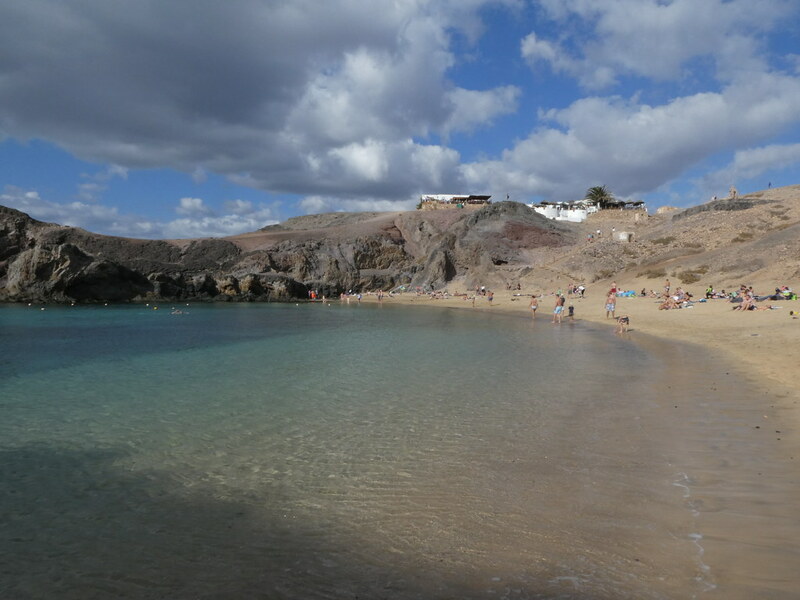 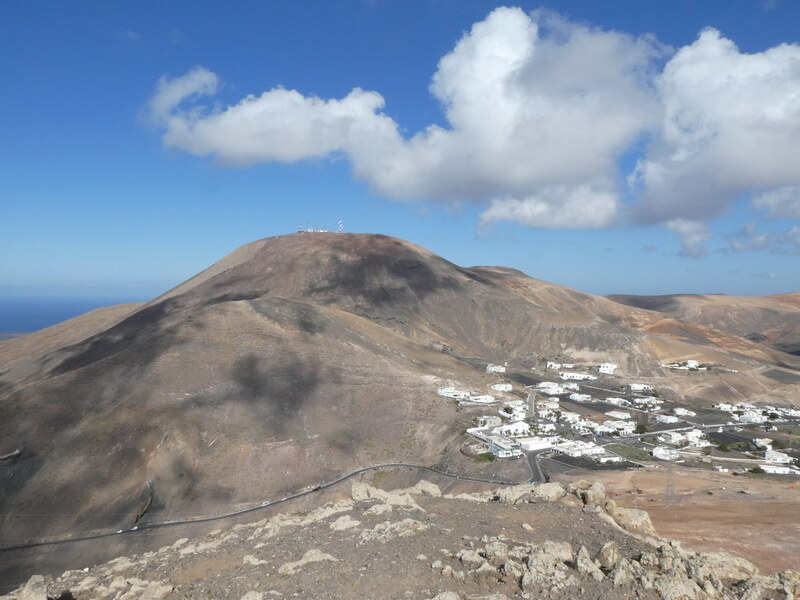 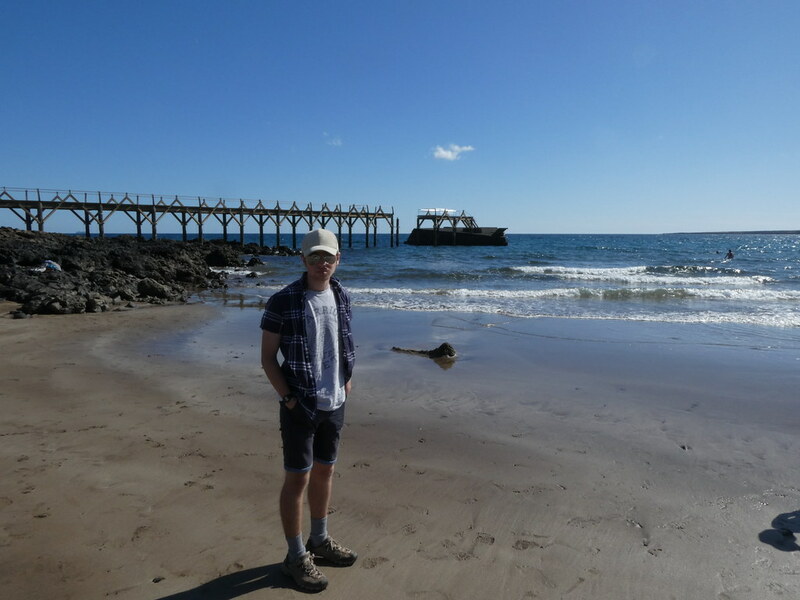 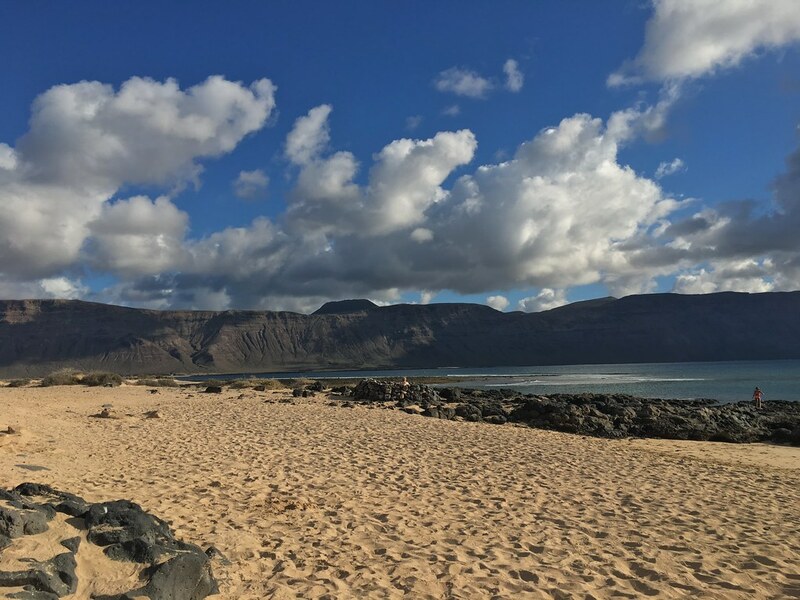 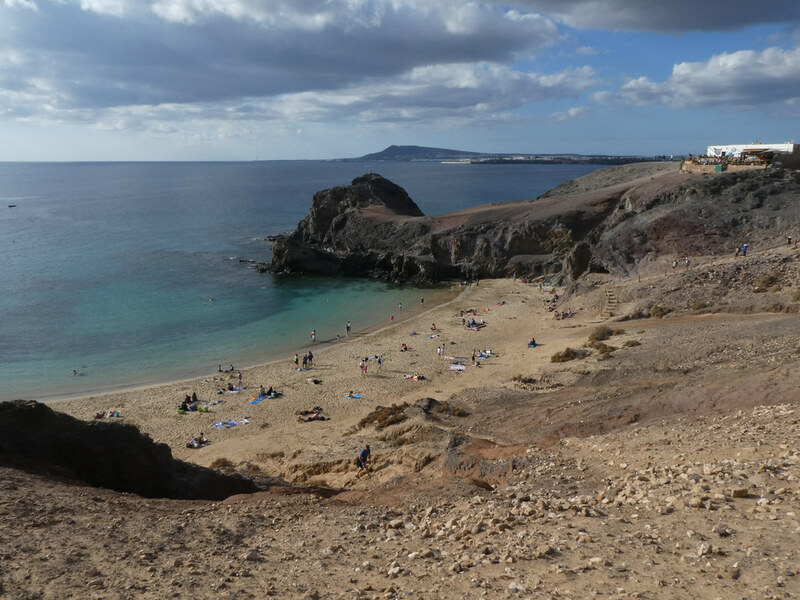 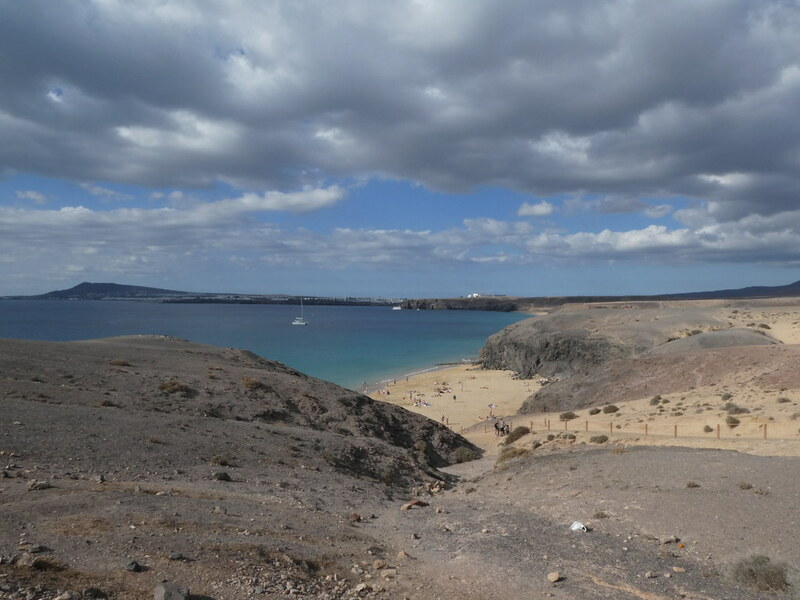 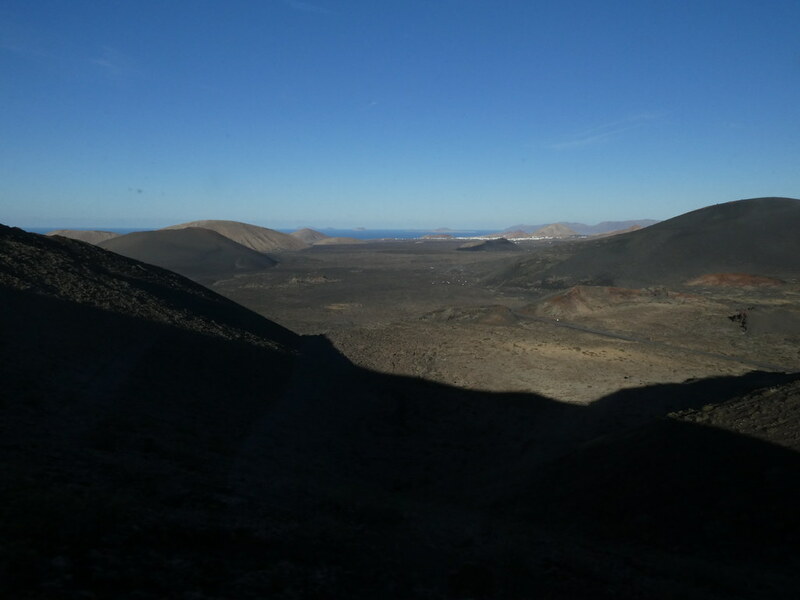 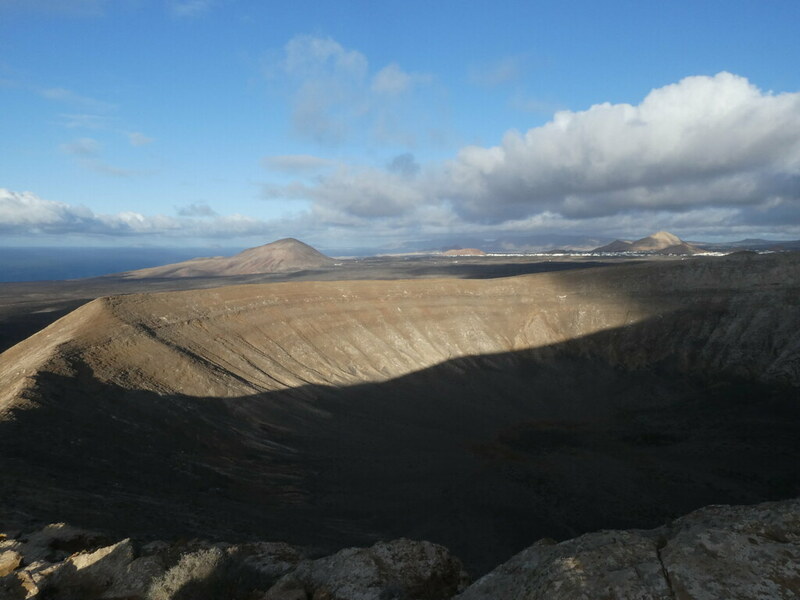 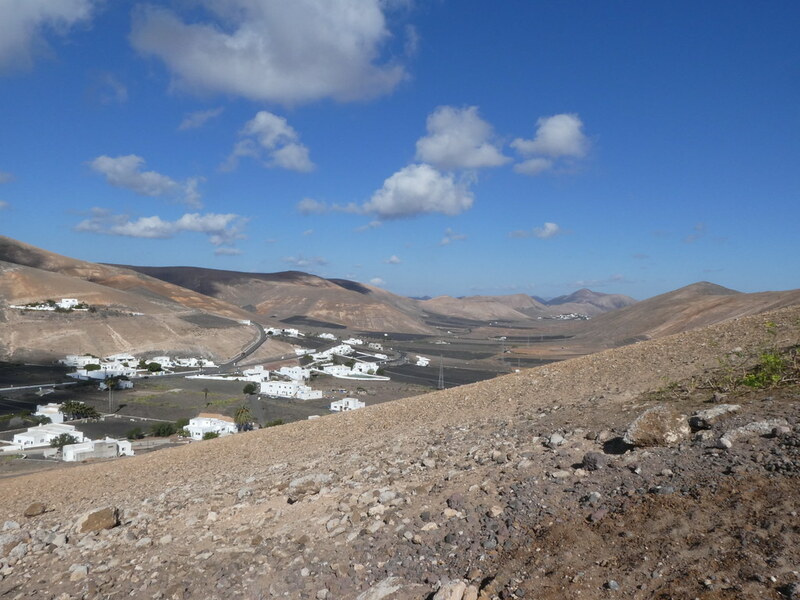 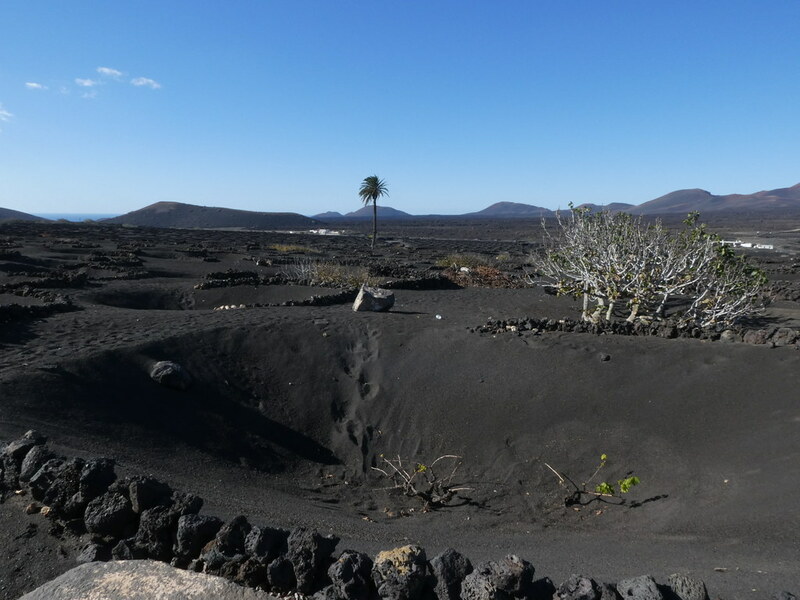 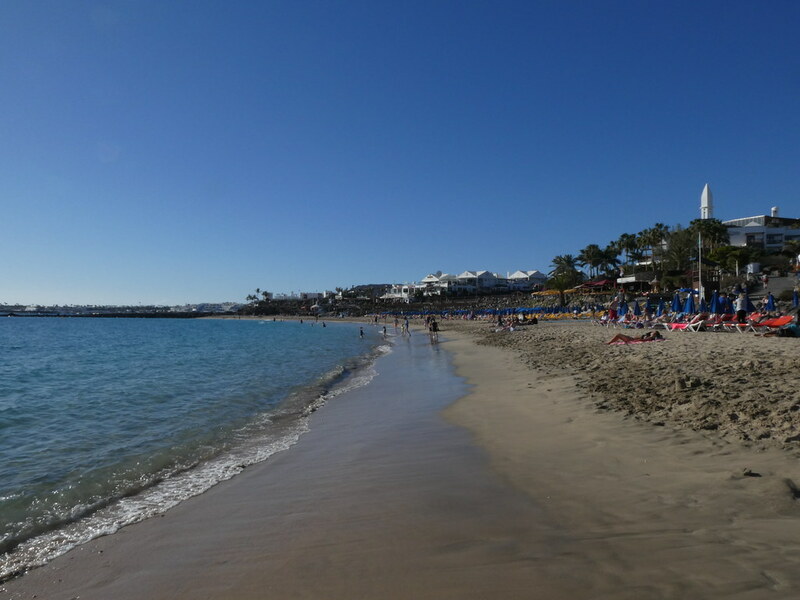 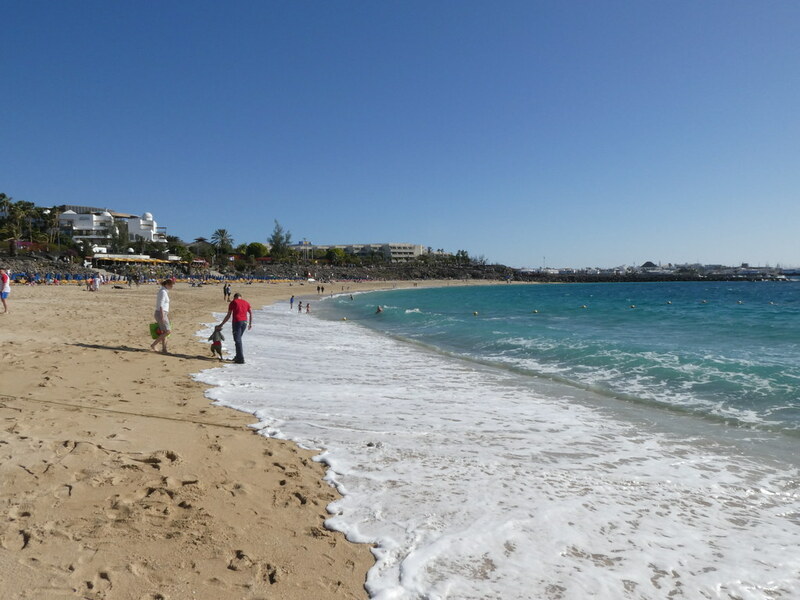 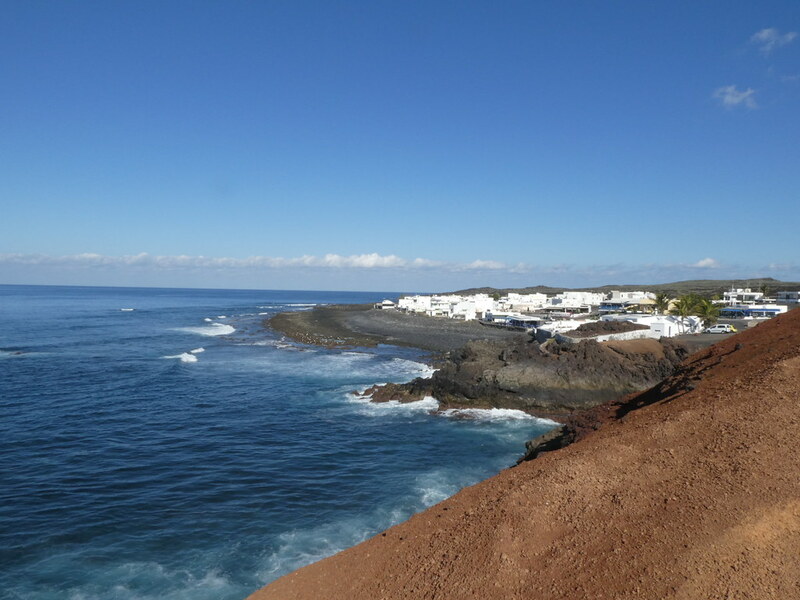 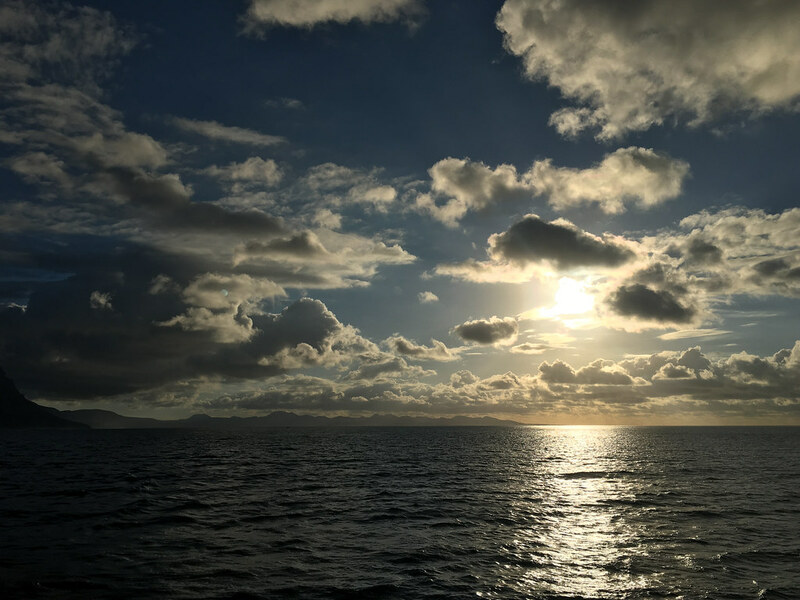 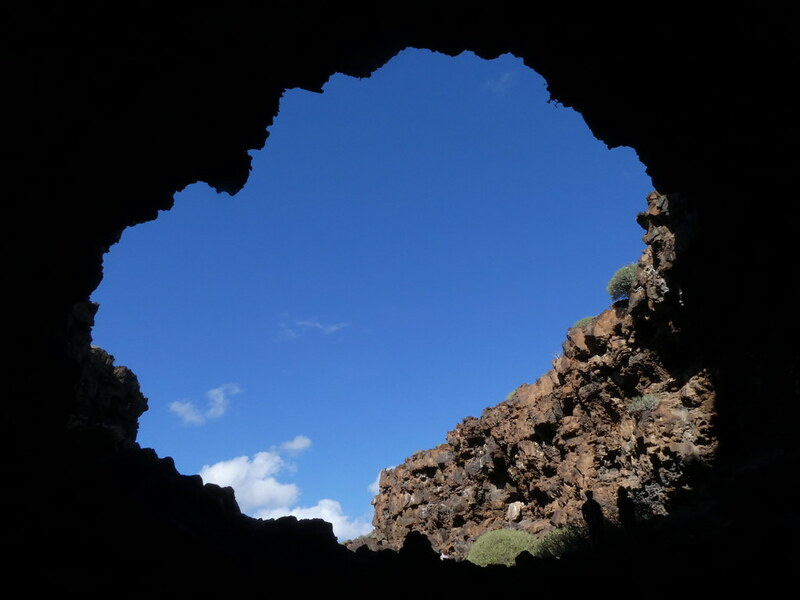 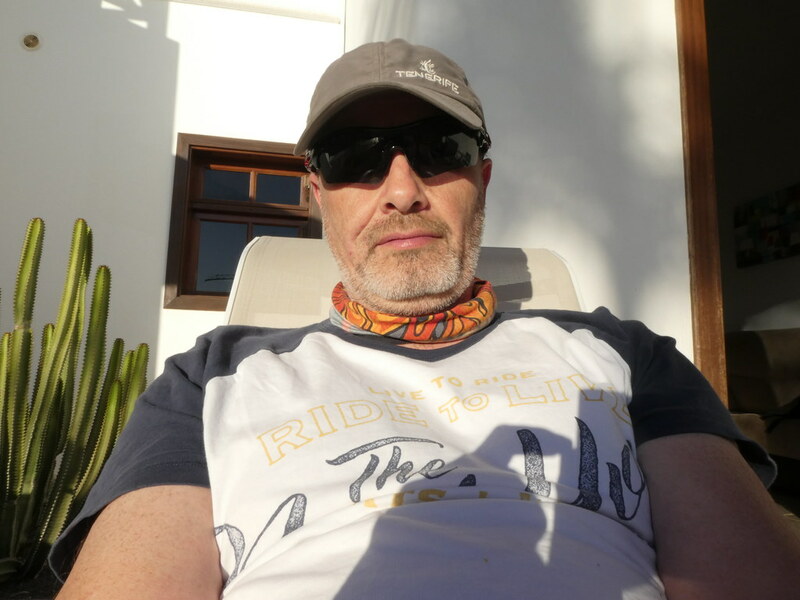 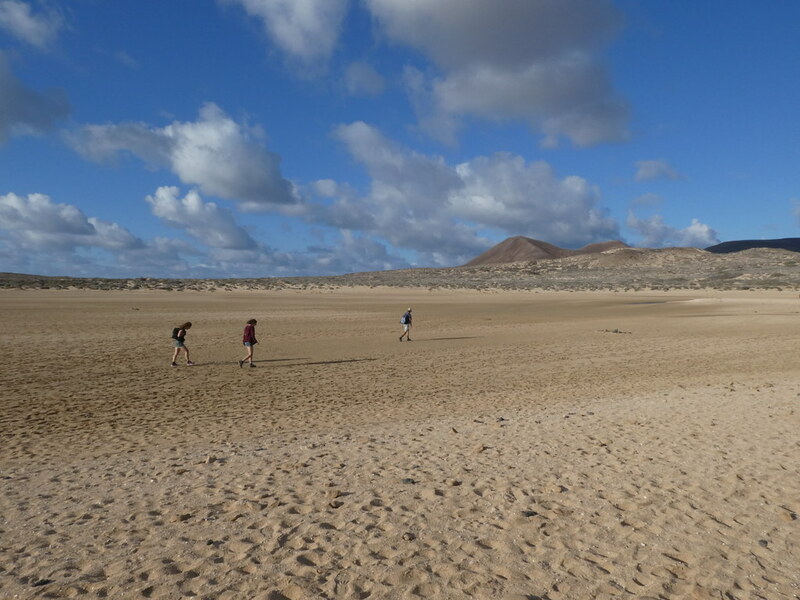 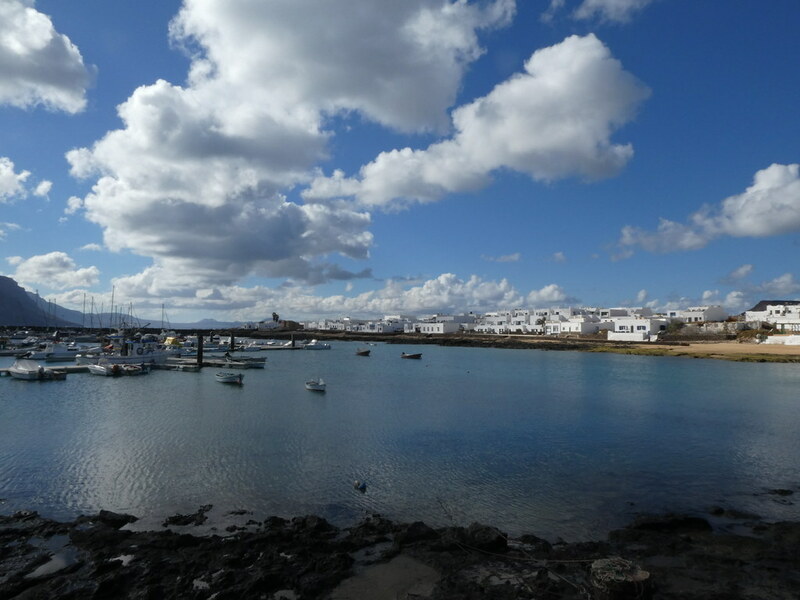 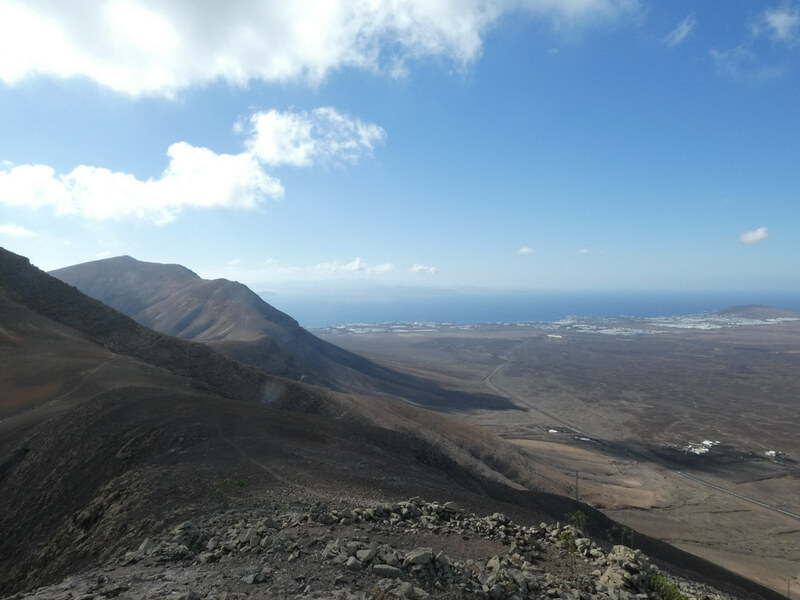 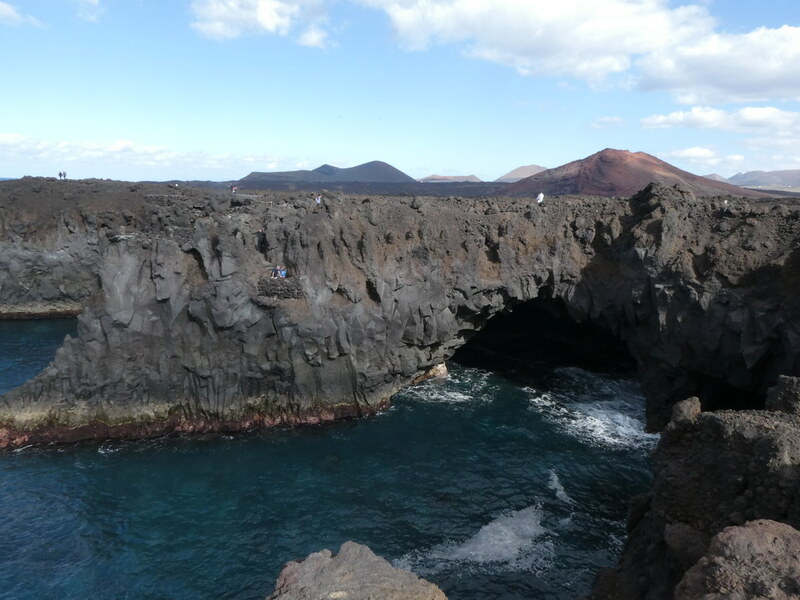 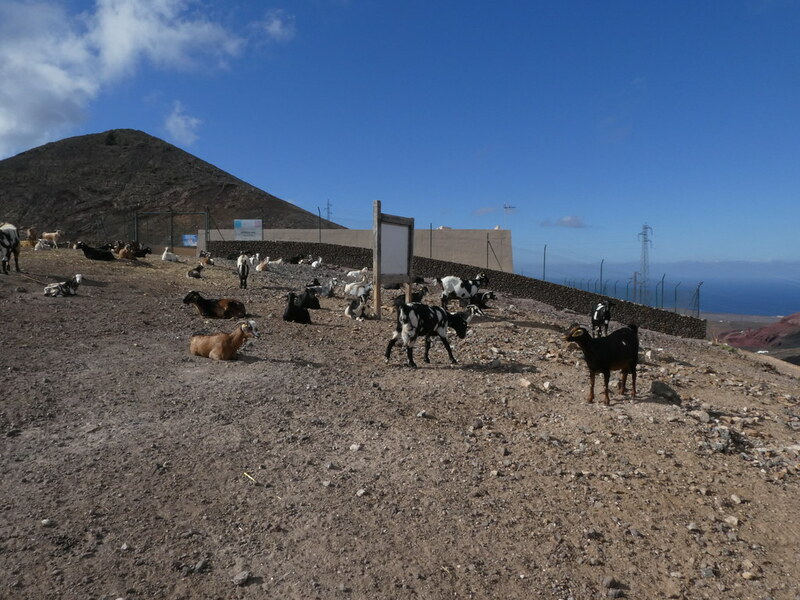 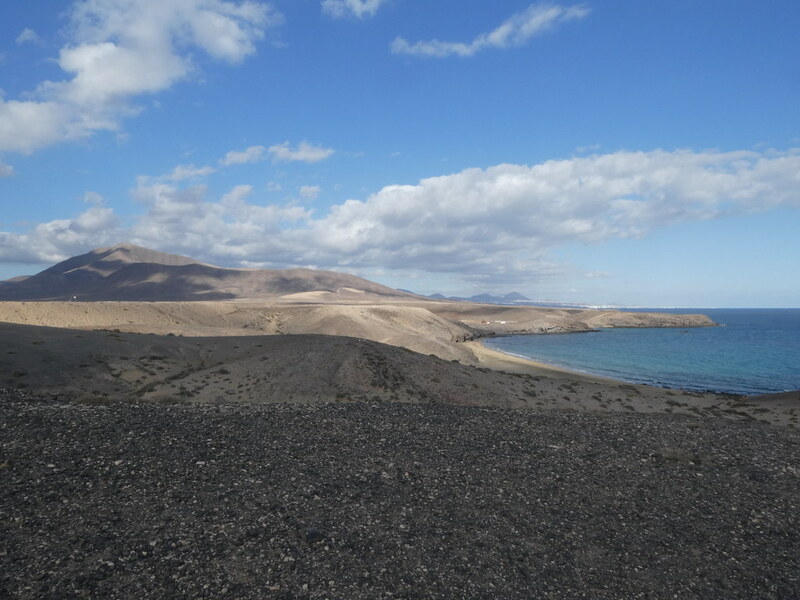 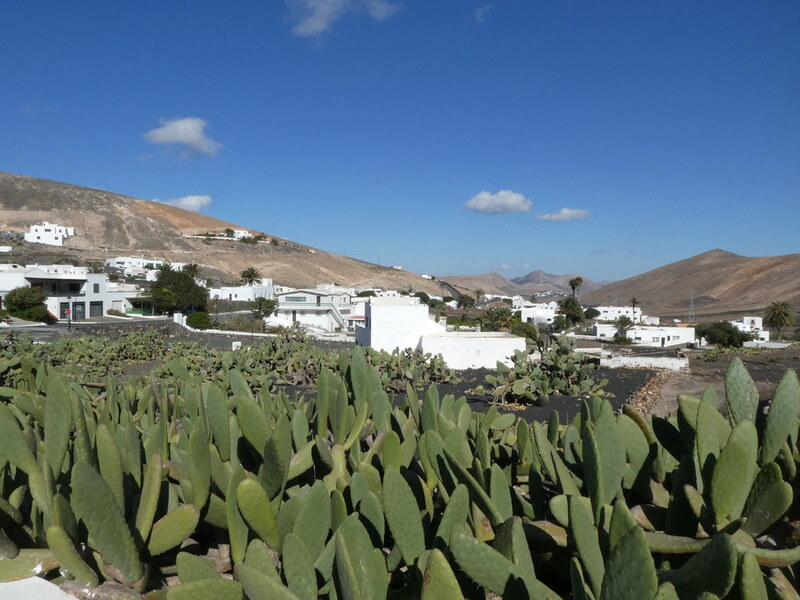 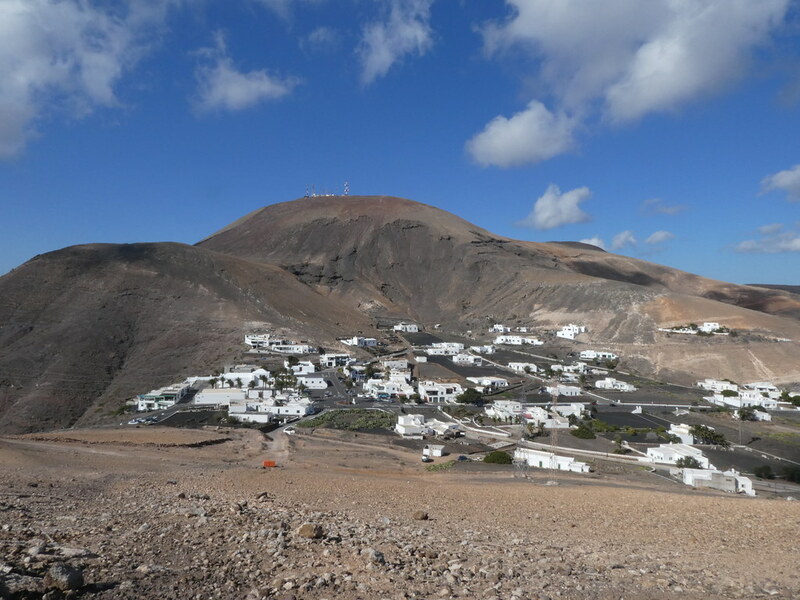 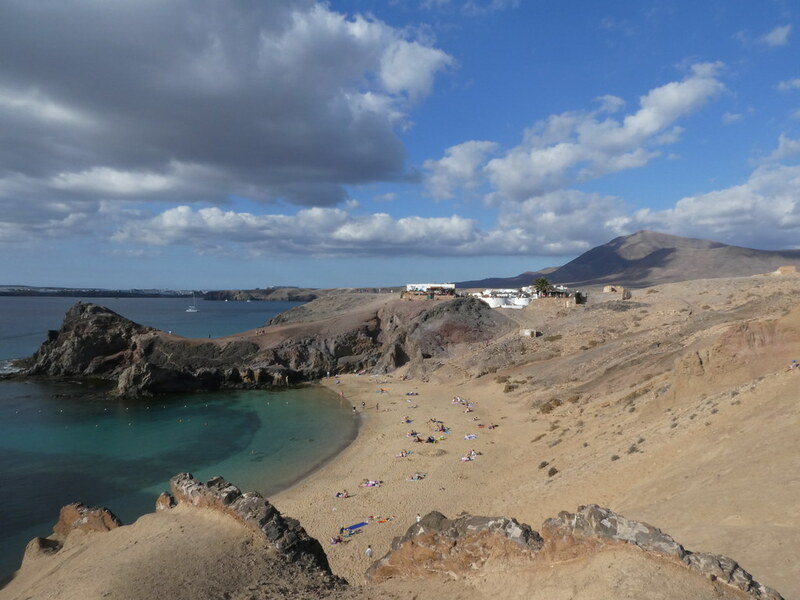 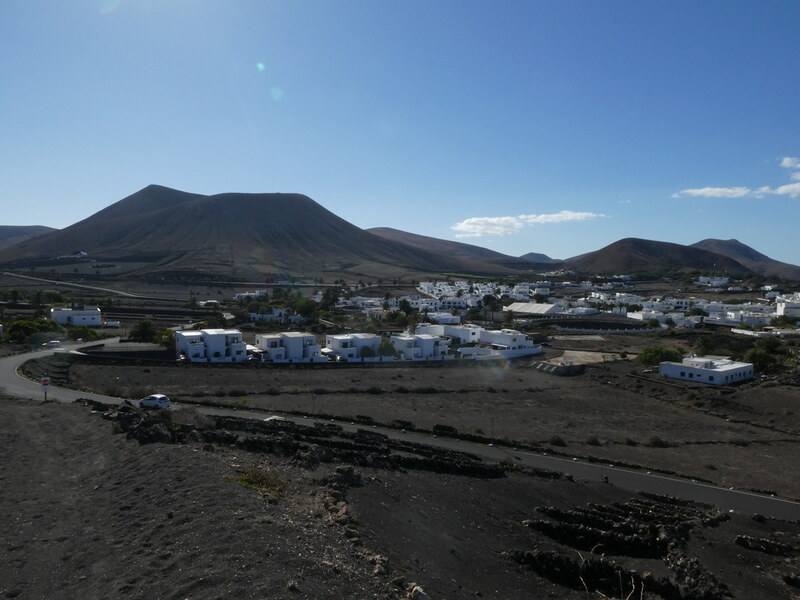 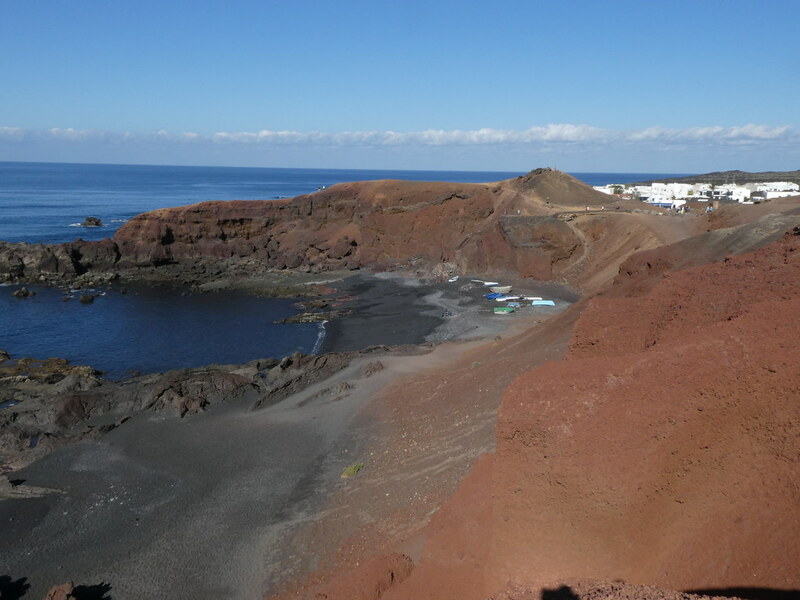 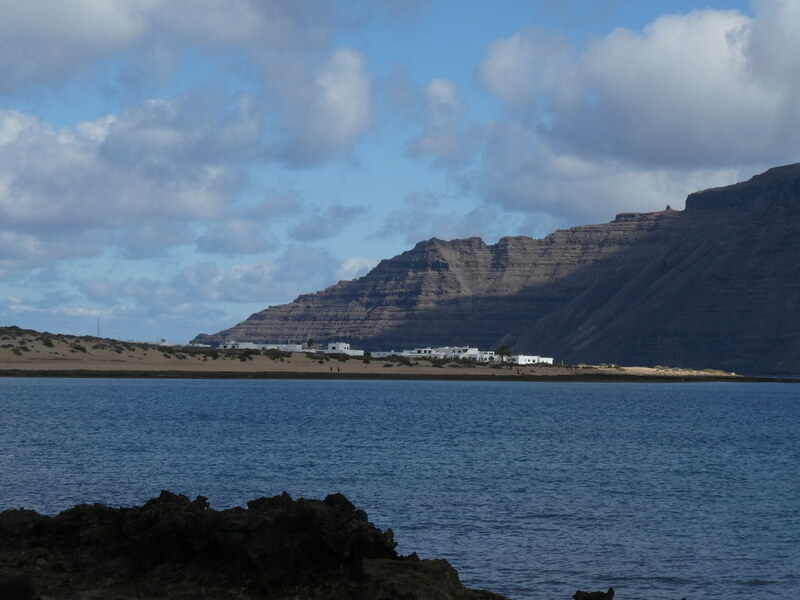 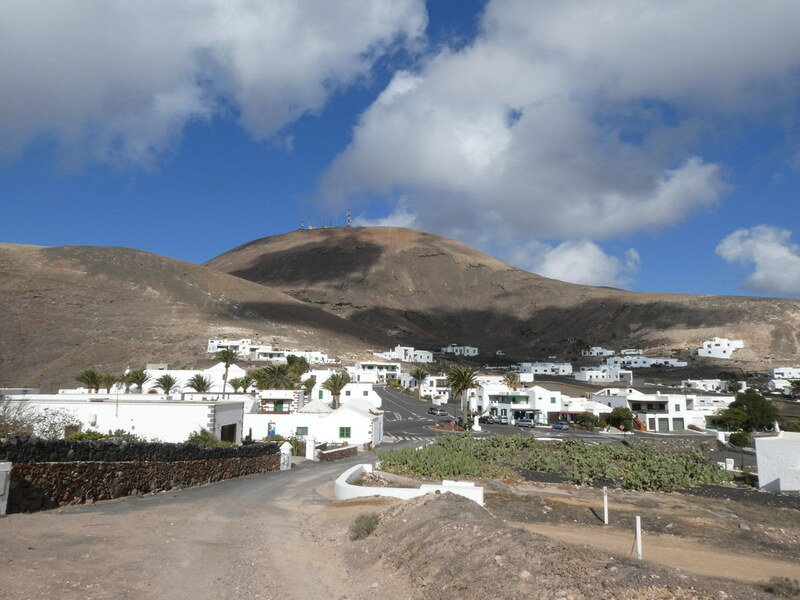 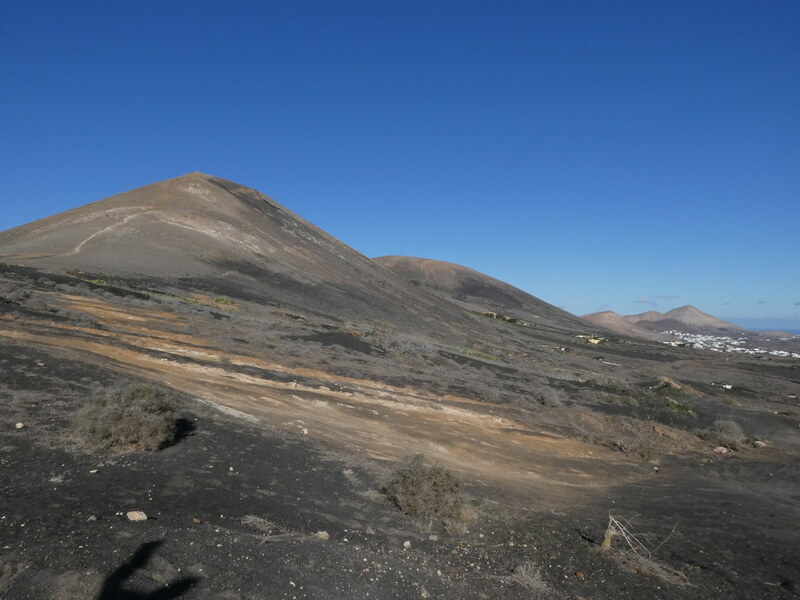 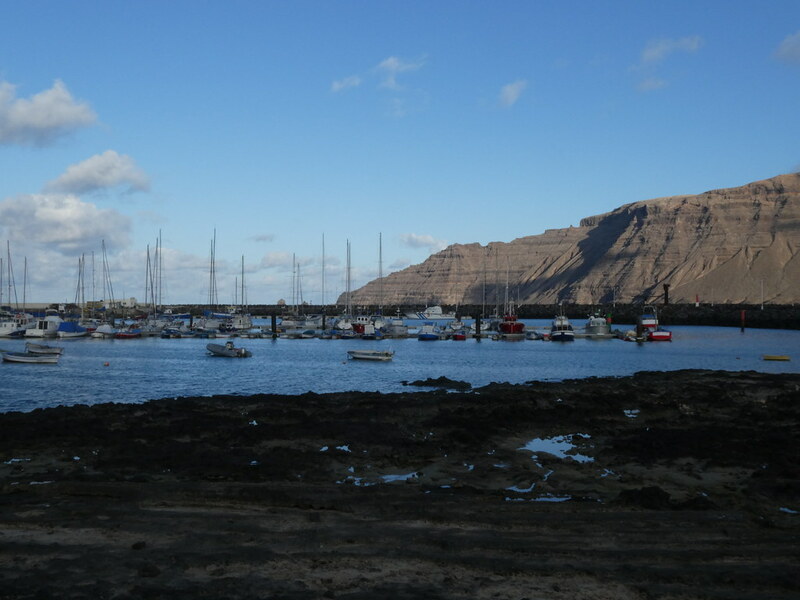 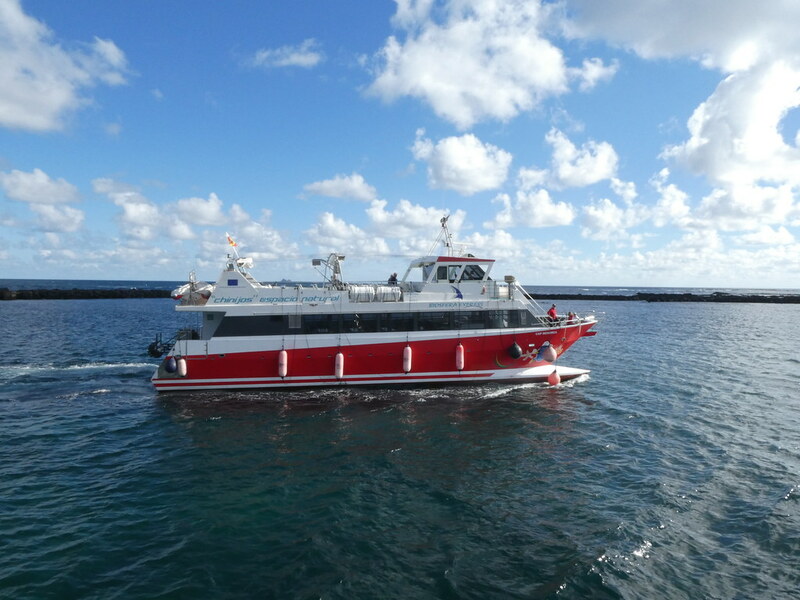 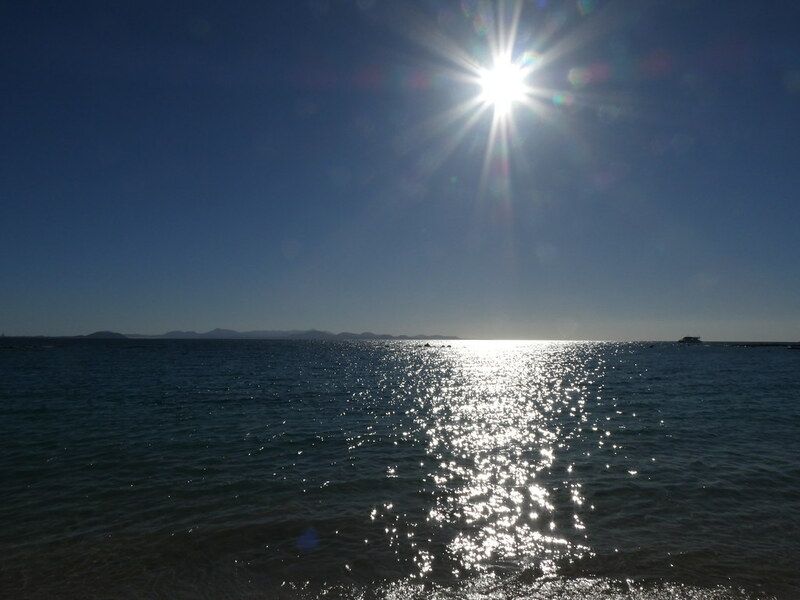 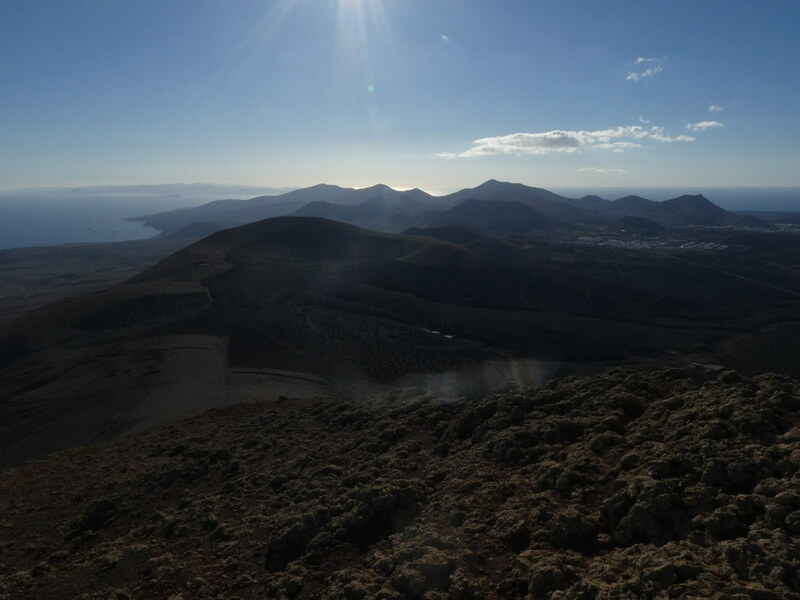 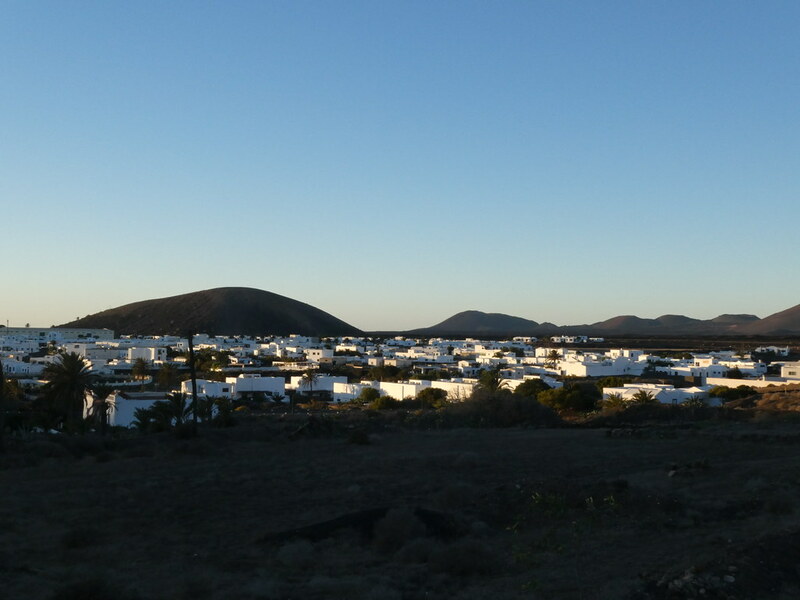 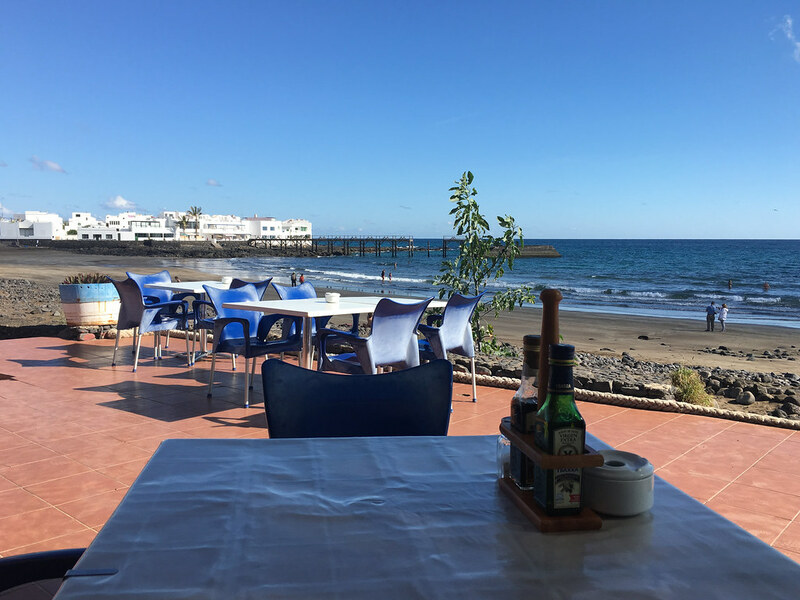 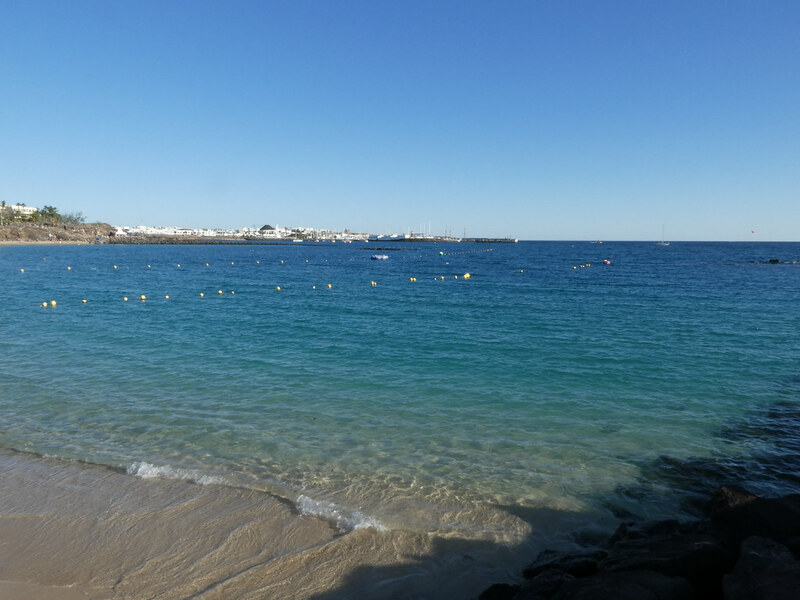 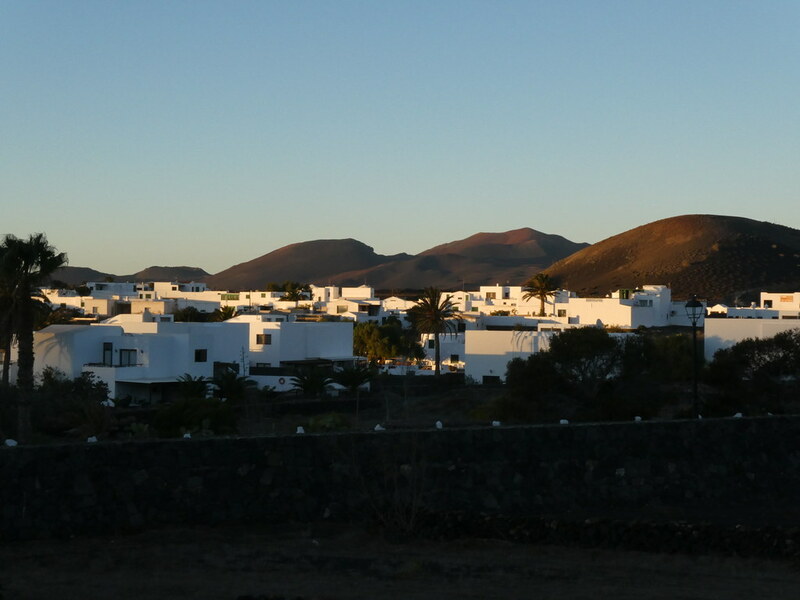 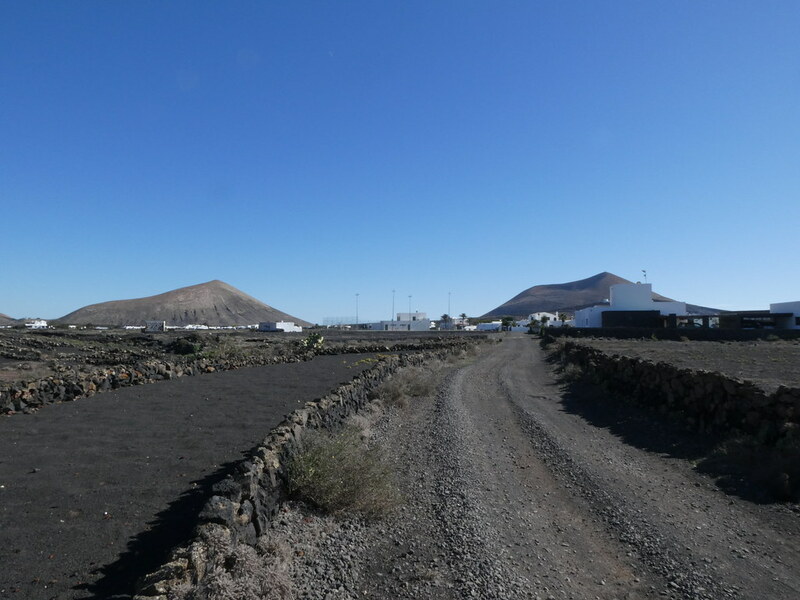 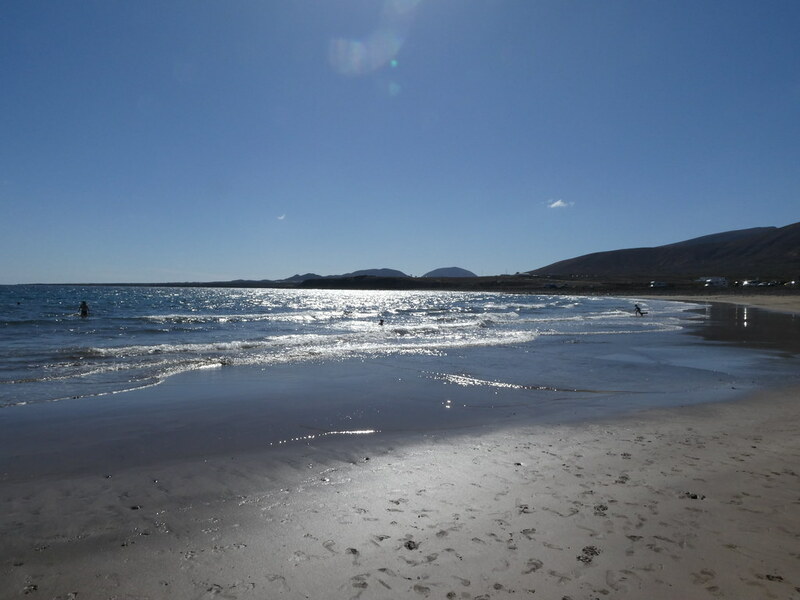 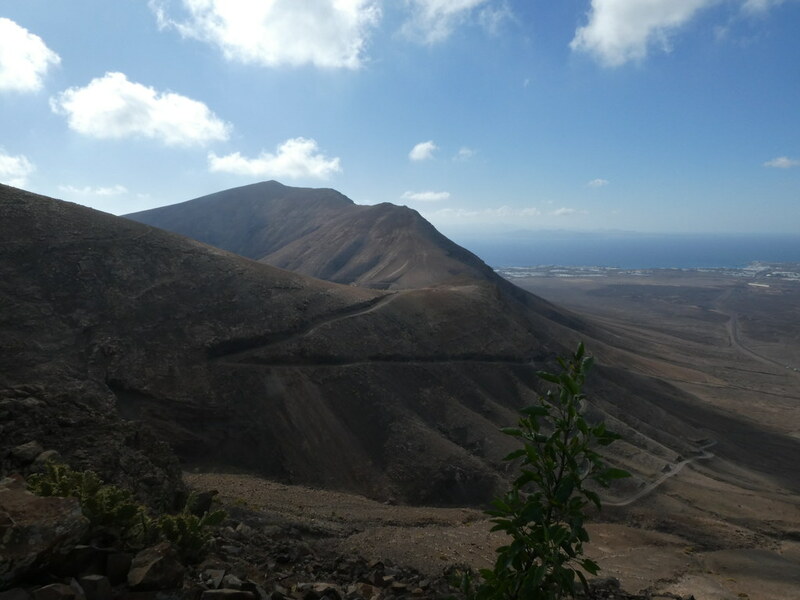 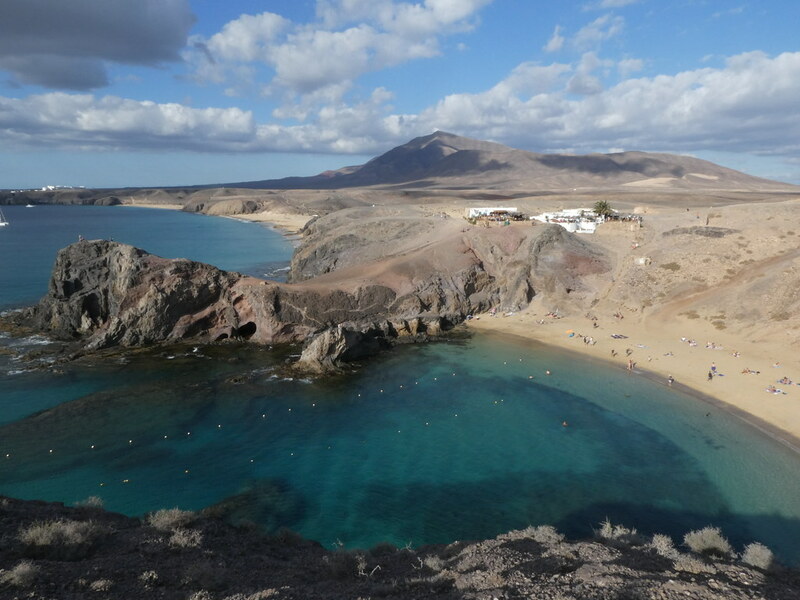 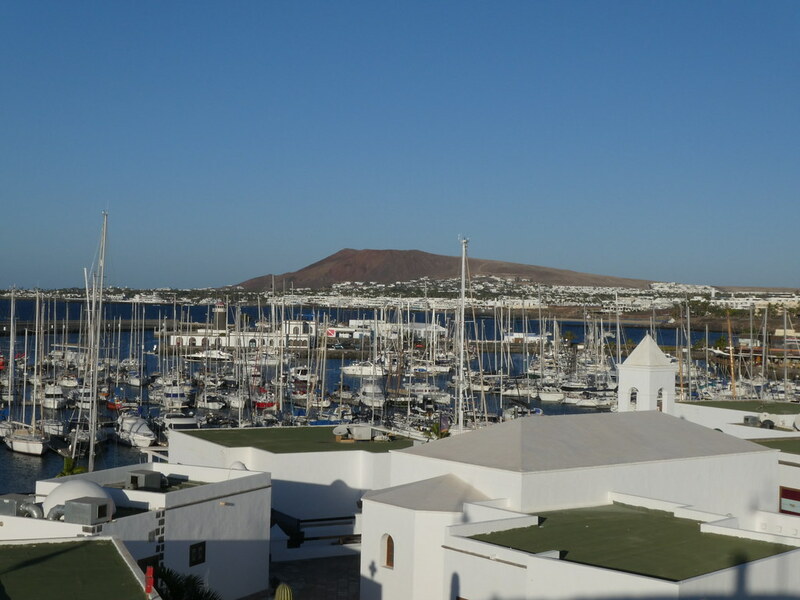 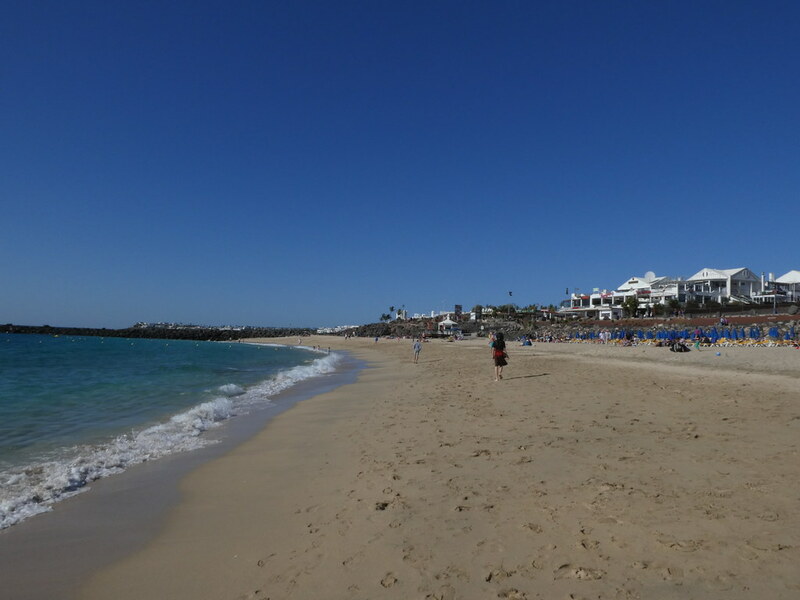 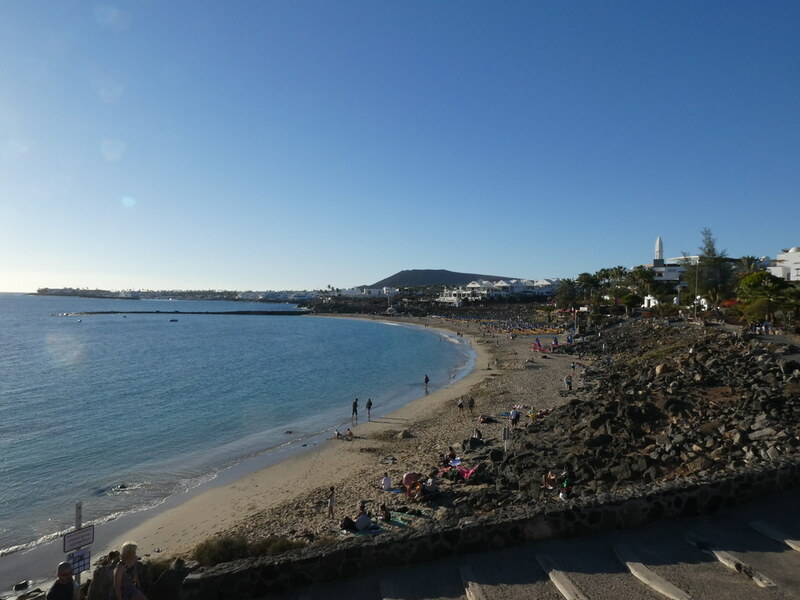 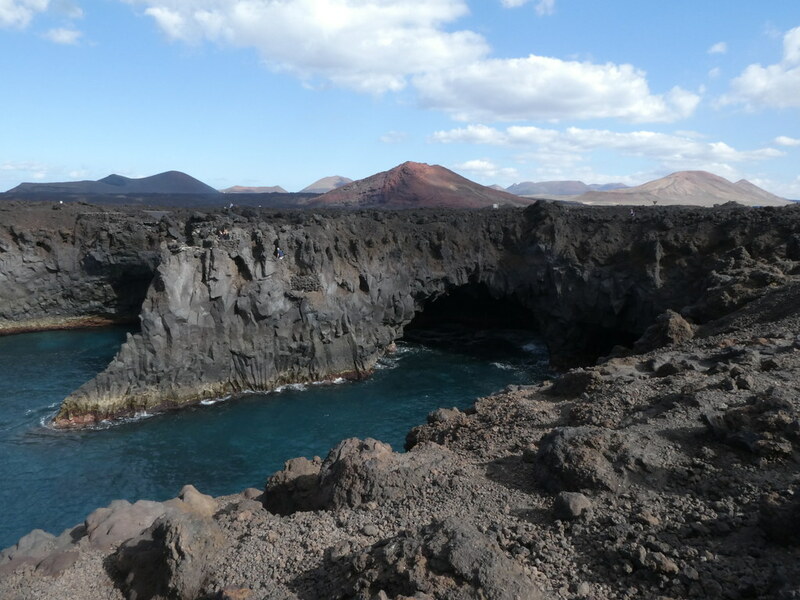 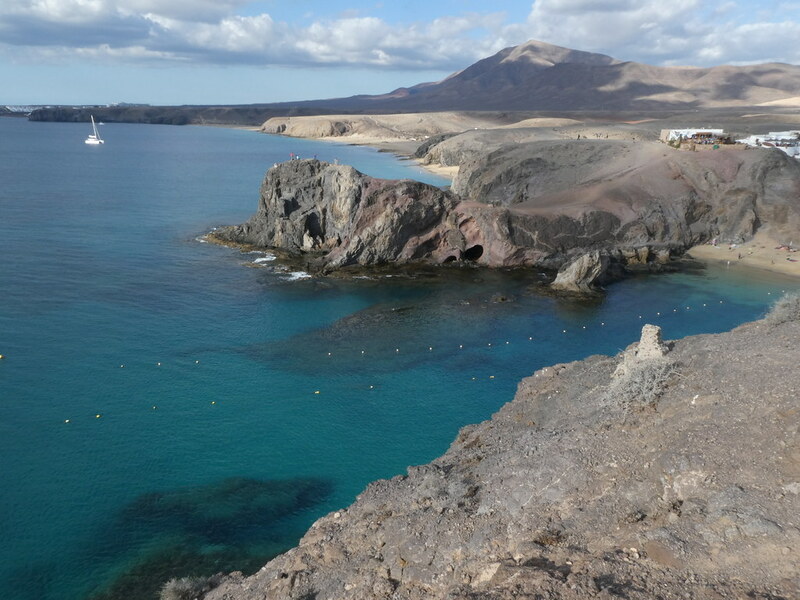 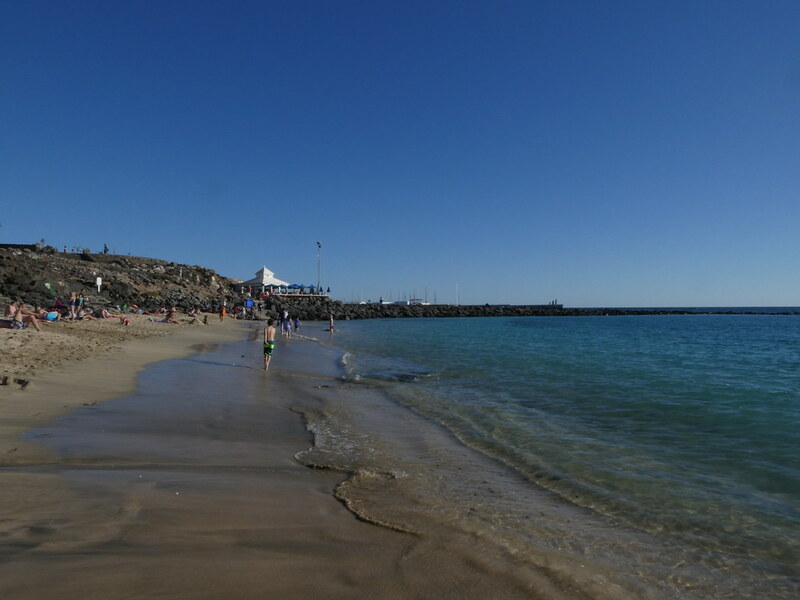 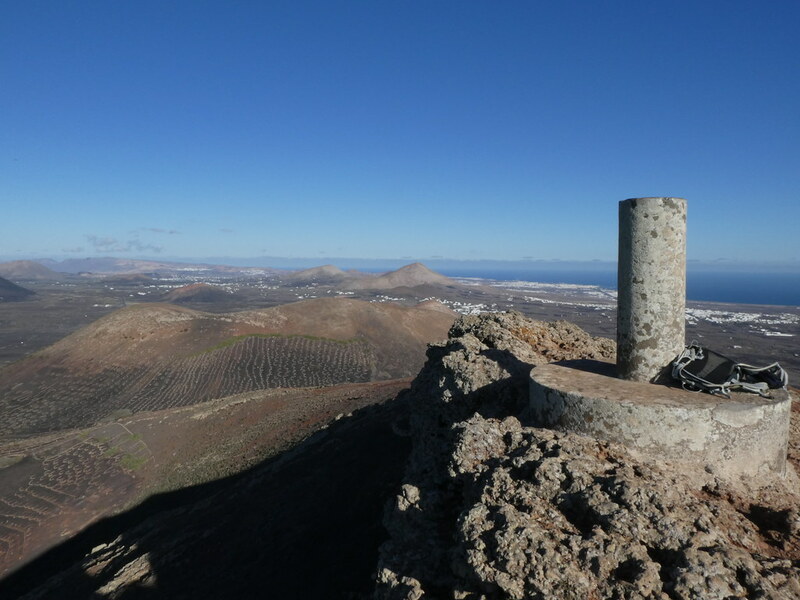 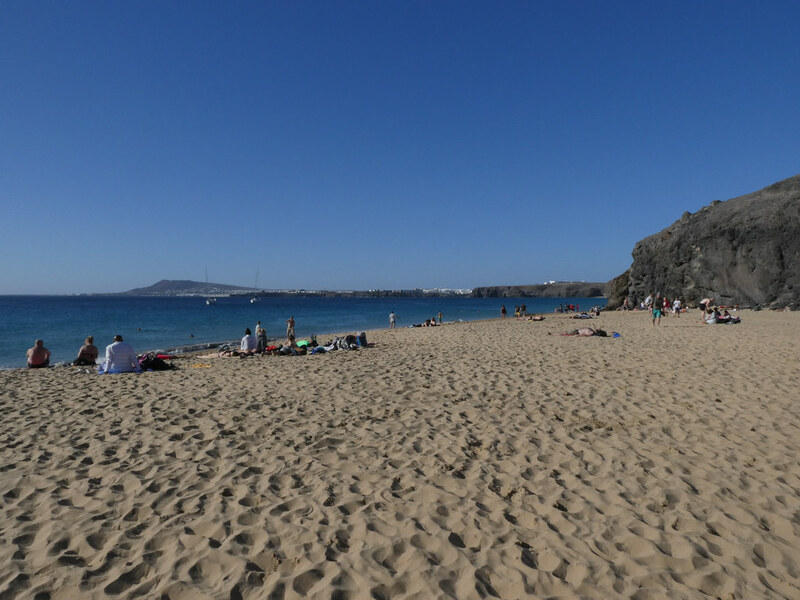 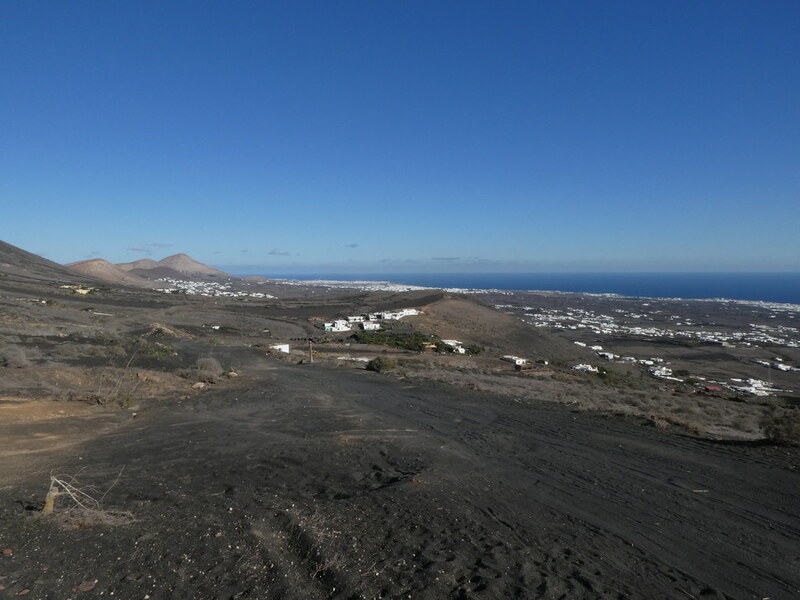 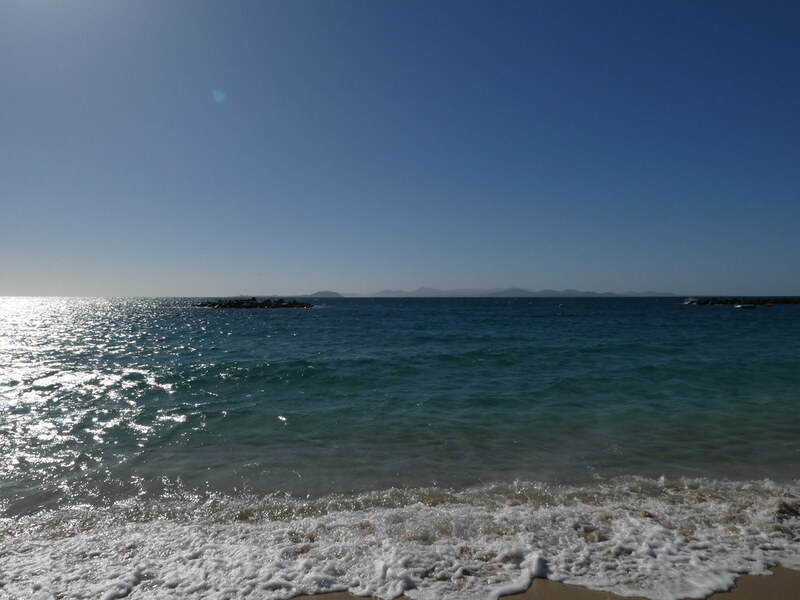 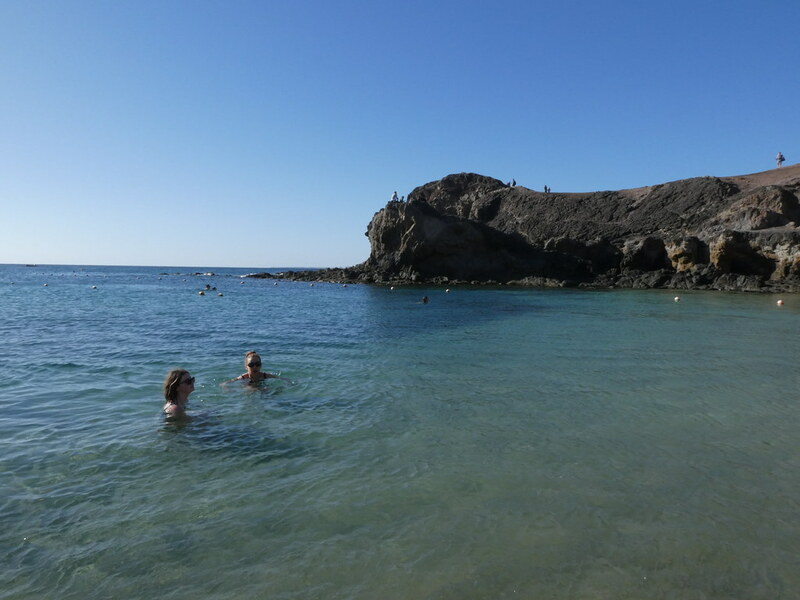 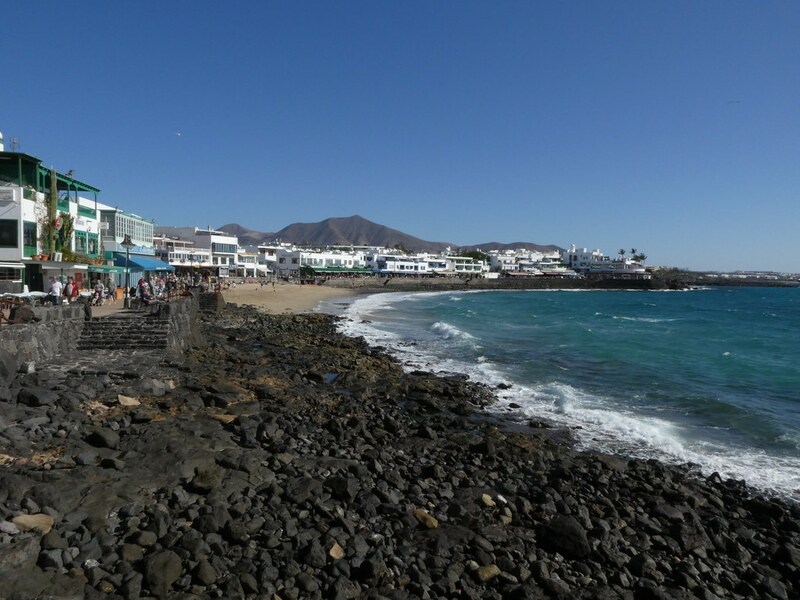 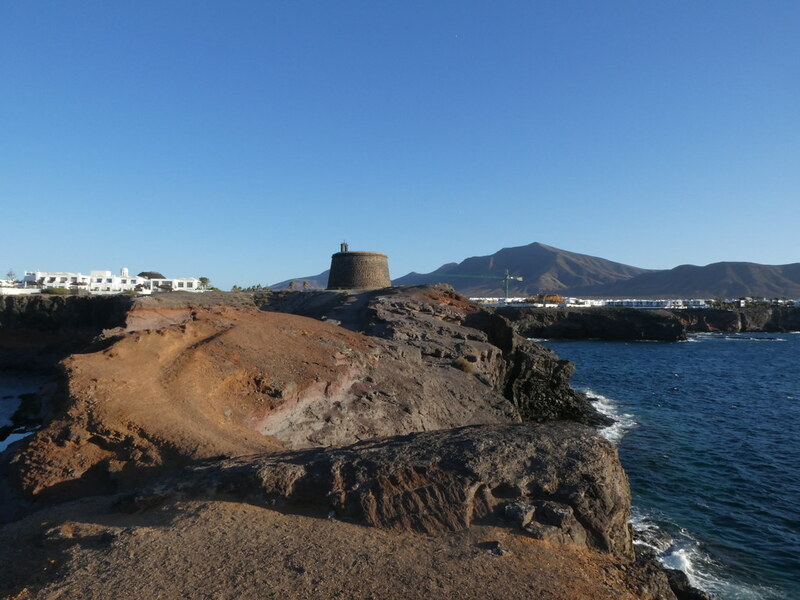 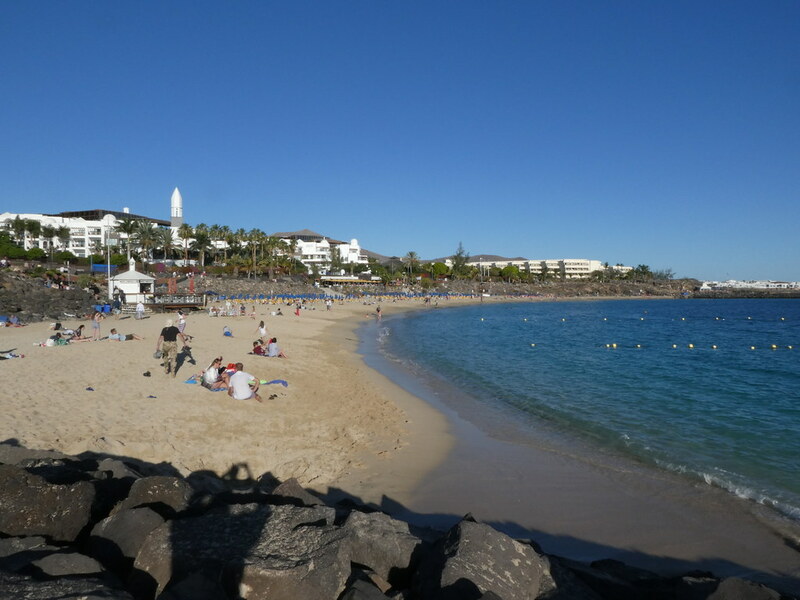 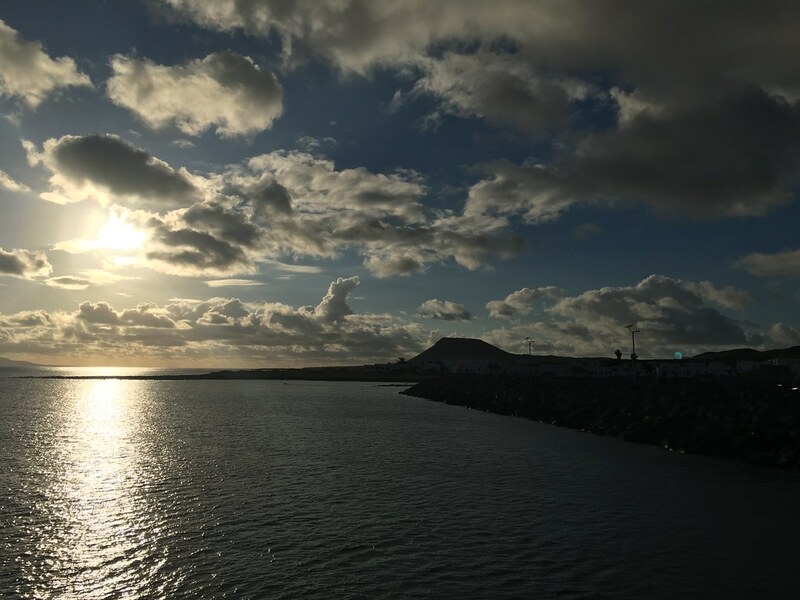 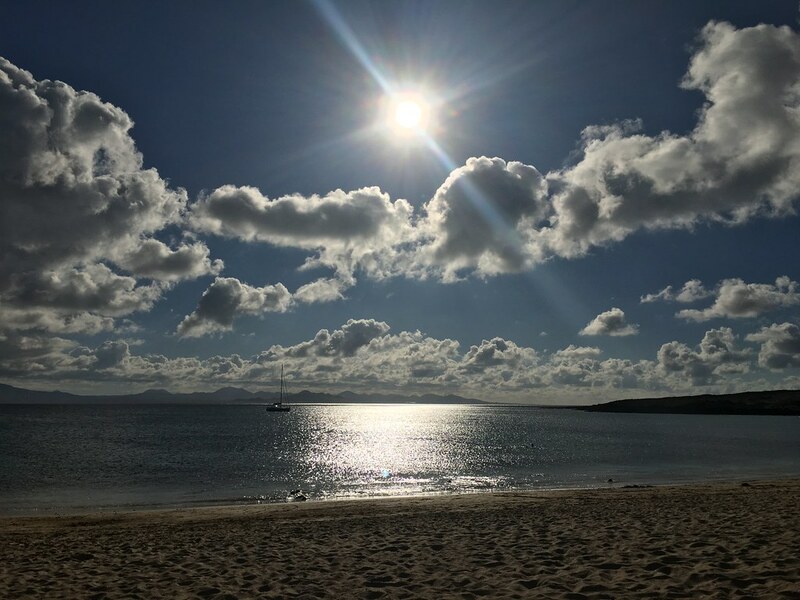 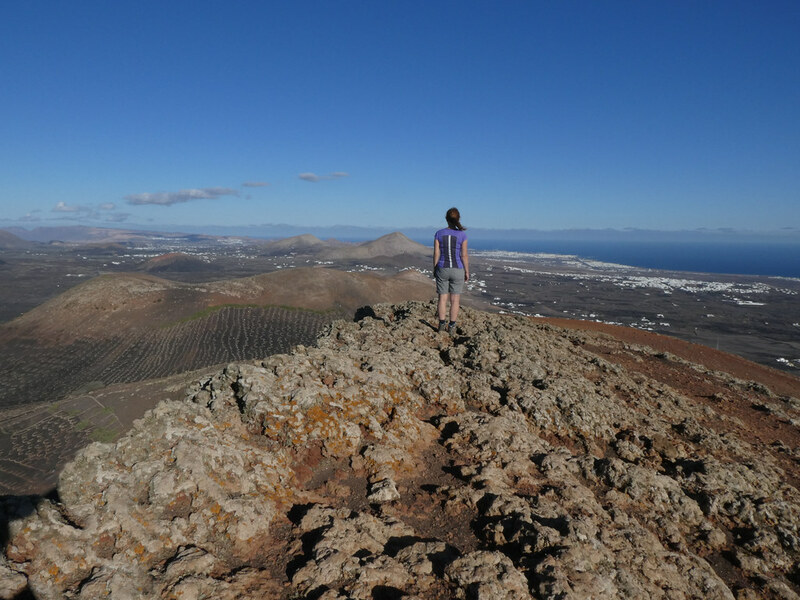 Lanzarote has some great coastal scenery and two visits either side of a lunch back at the apartment shows the variety on offer. 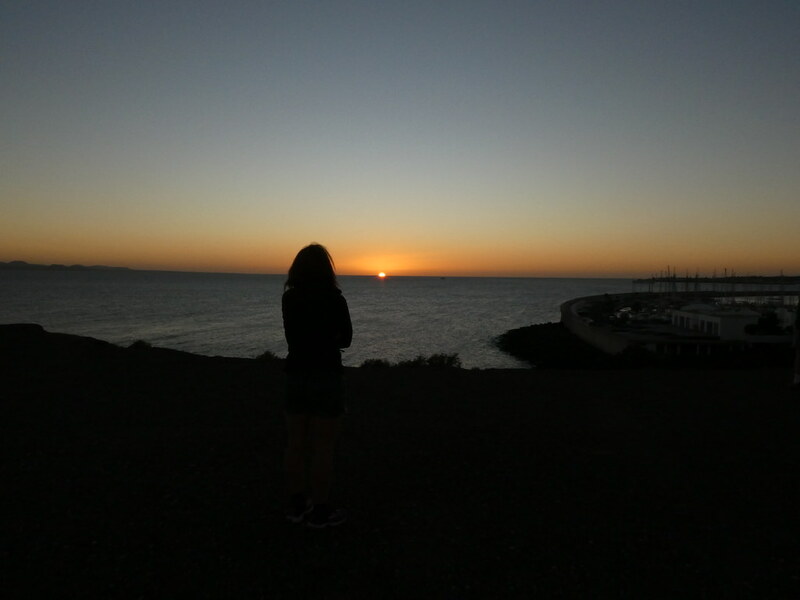 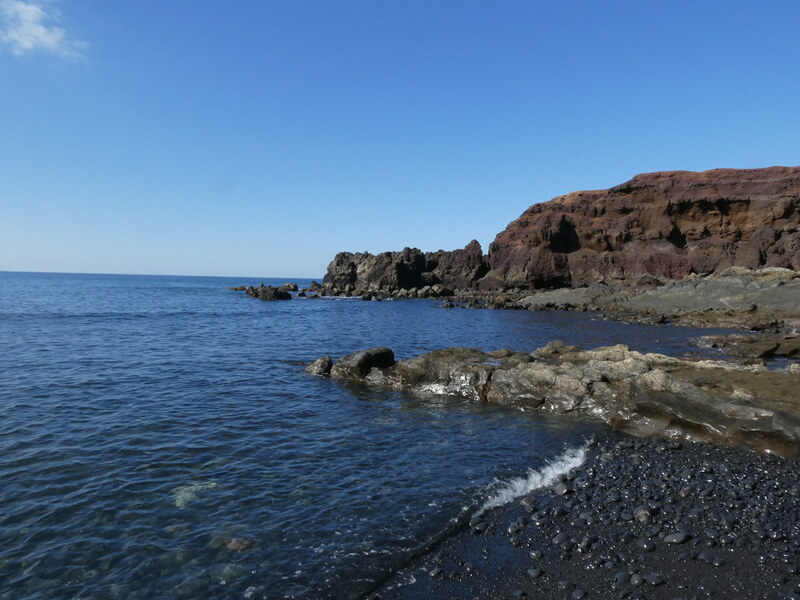 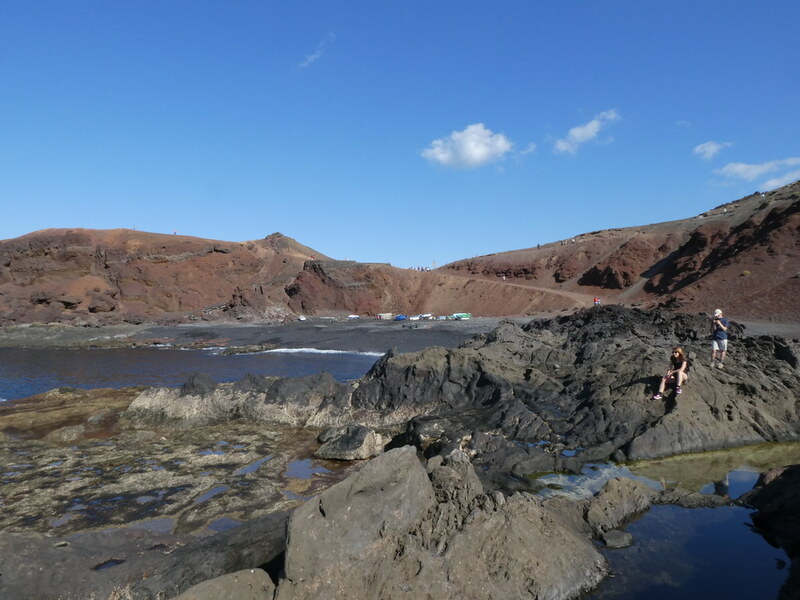 In the morning (minus TJF who elected to laze in bed) we headed a few miles up the coast to El Golfo. 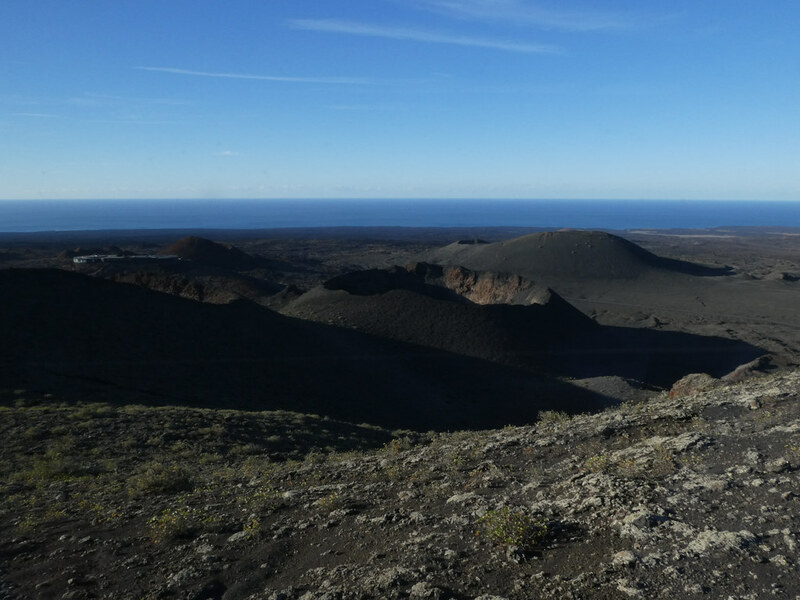 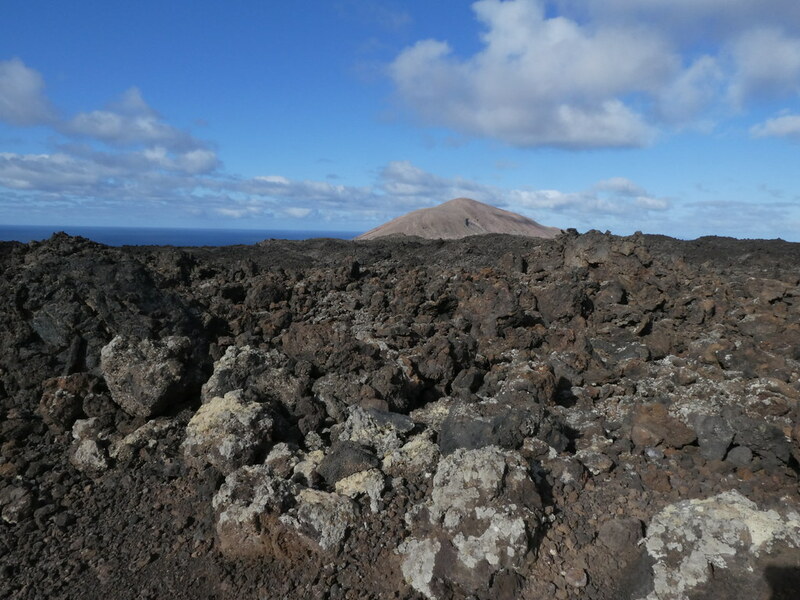 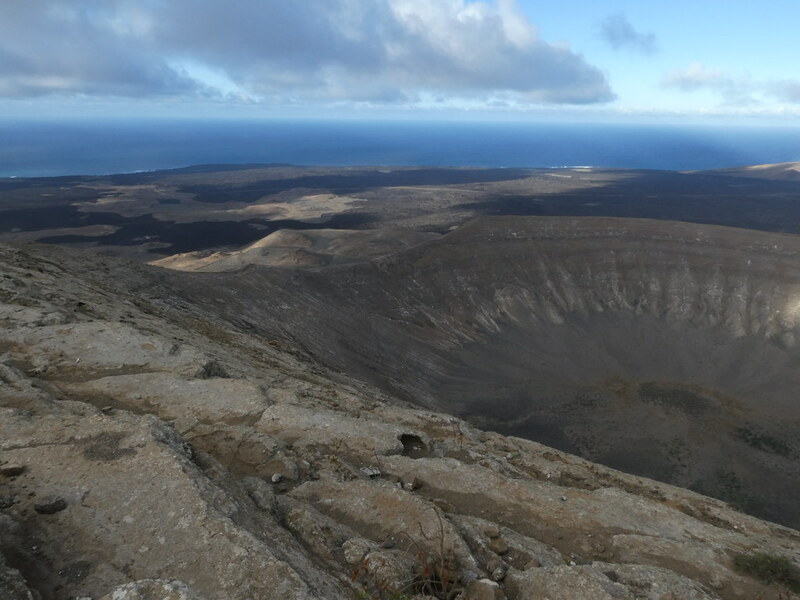 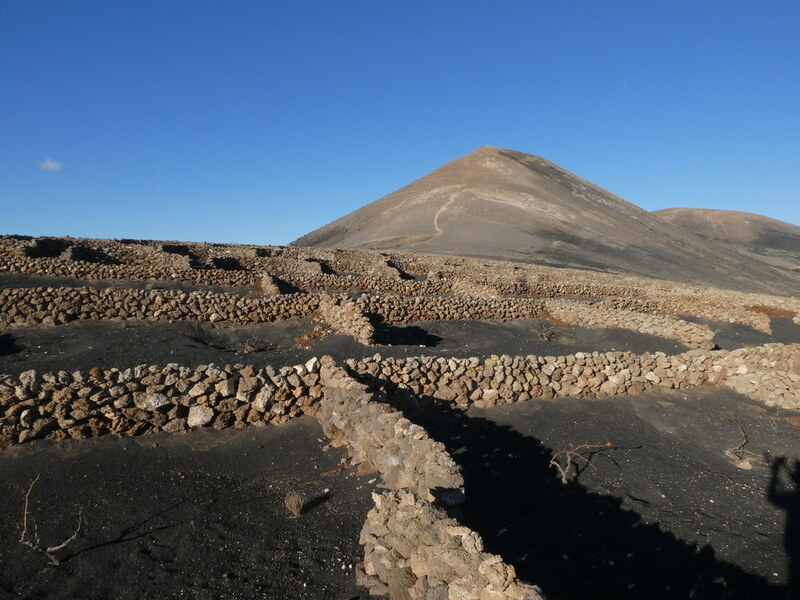 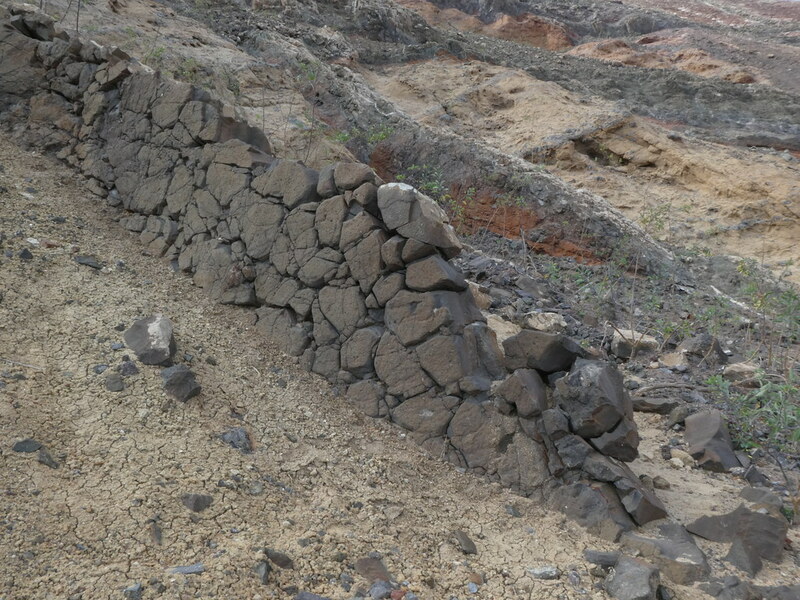 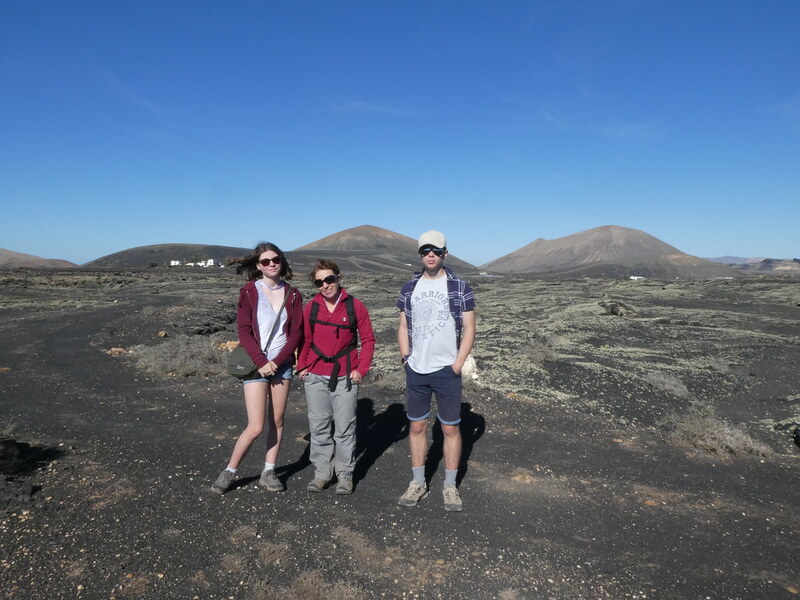 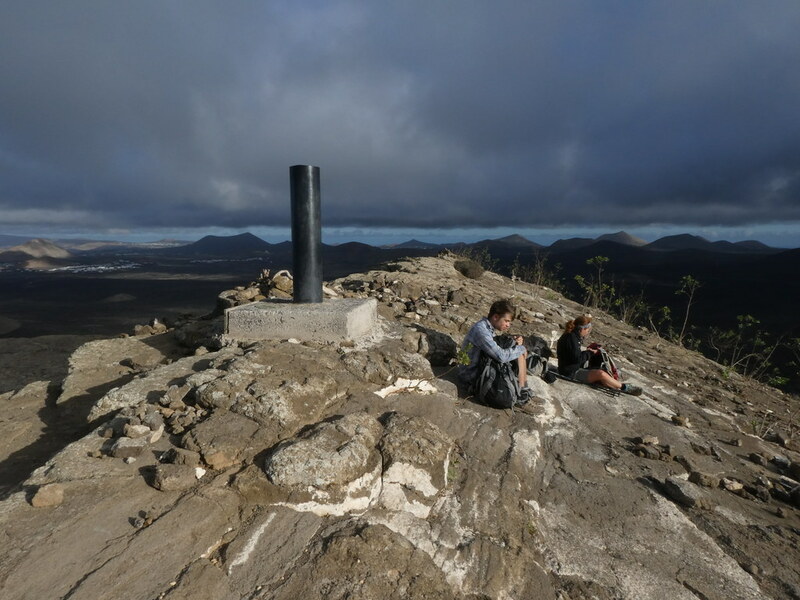 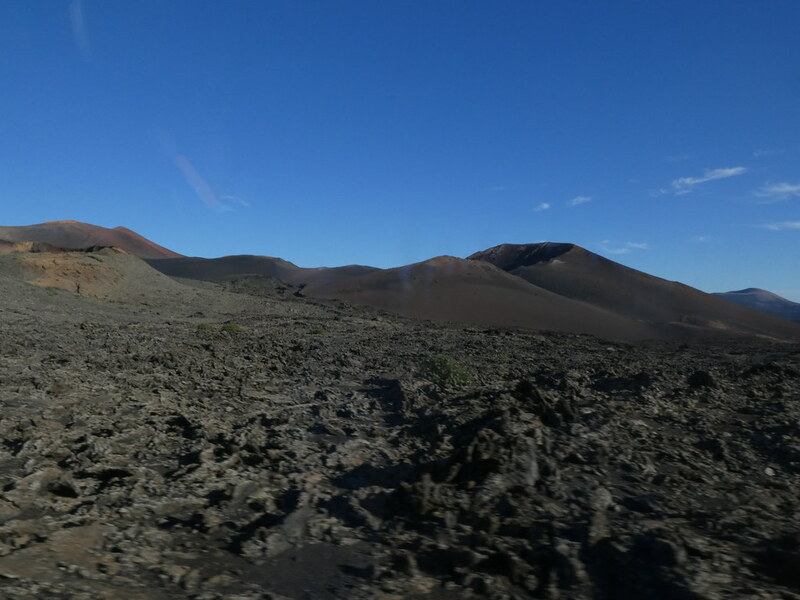 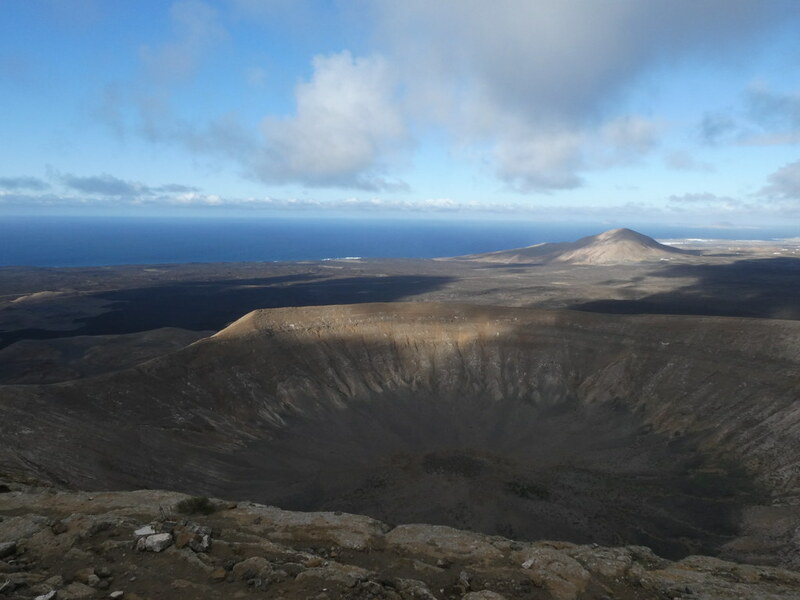 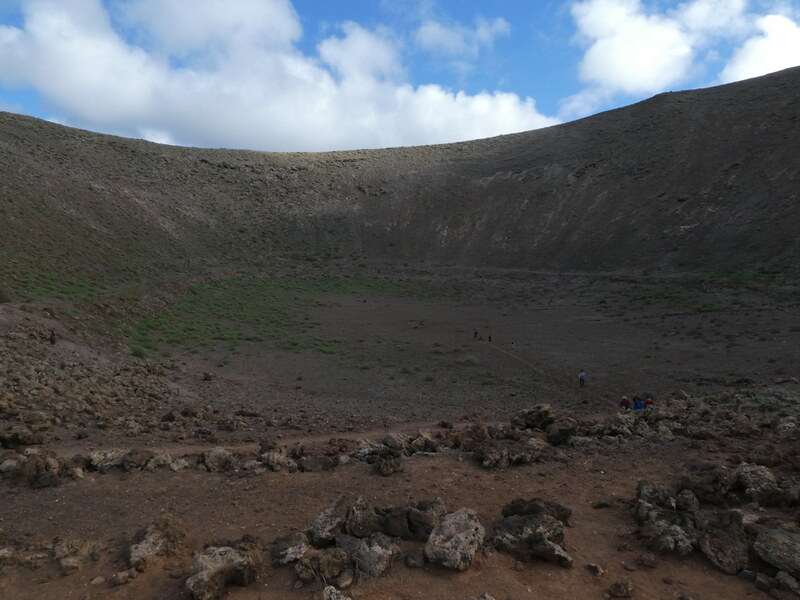 It’s on the fringes of the Timanfaya National Park where the major eruptions of the 16th and 17th centuries took place and devastated this corner of the island. 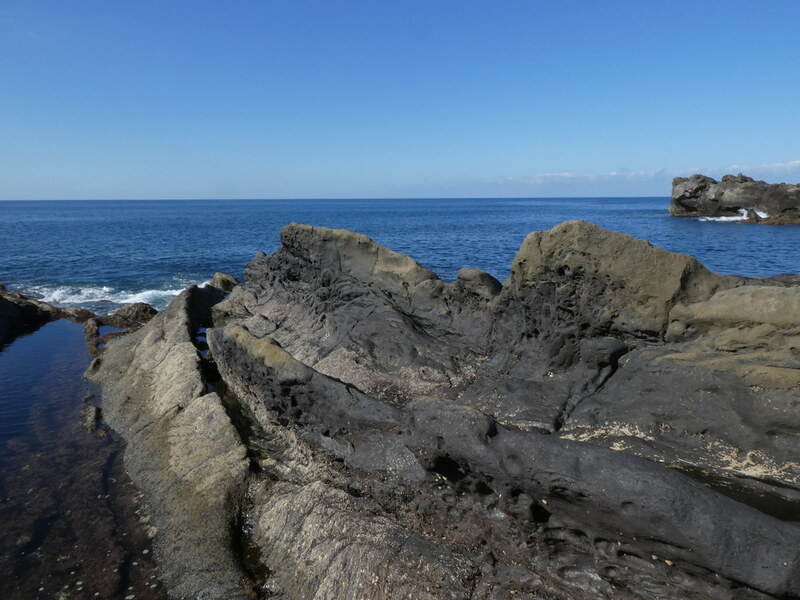 The coast is spectacular with jagged rocks in all directions. 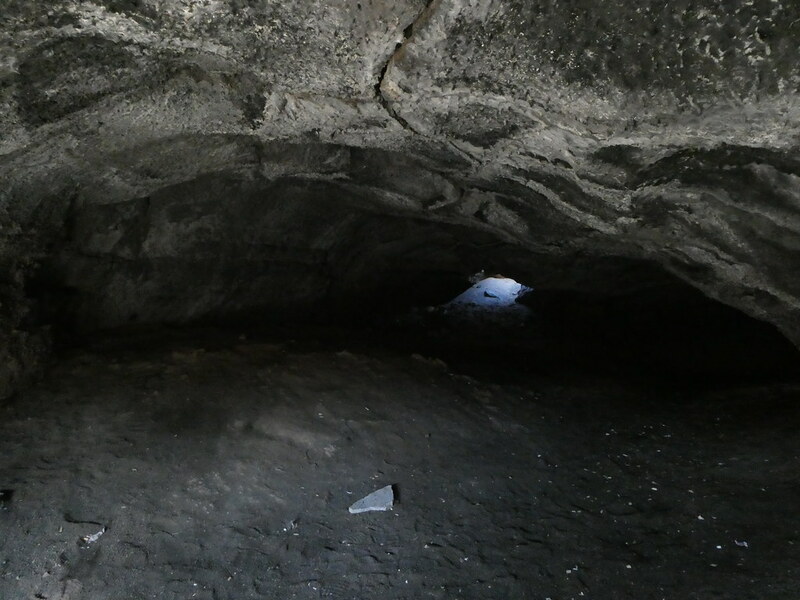 The real sights are however the caves of Los Hervideros. 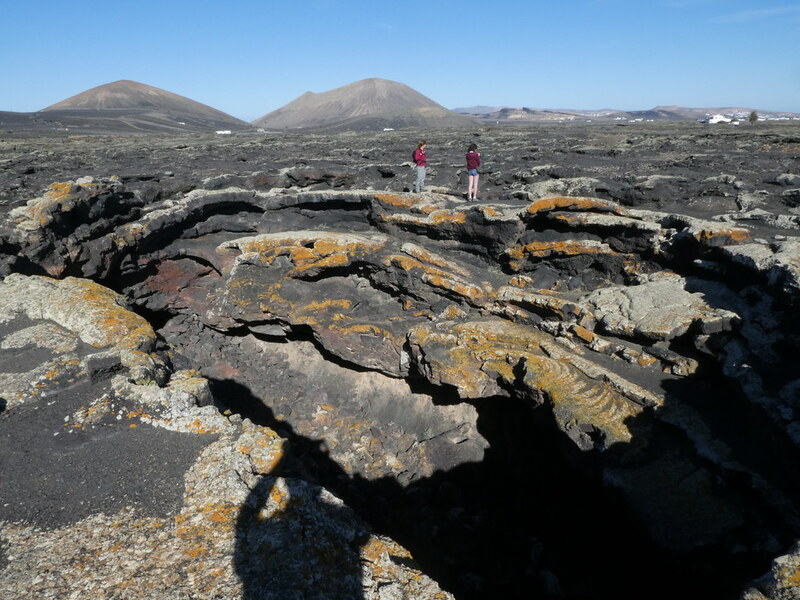 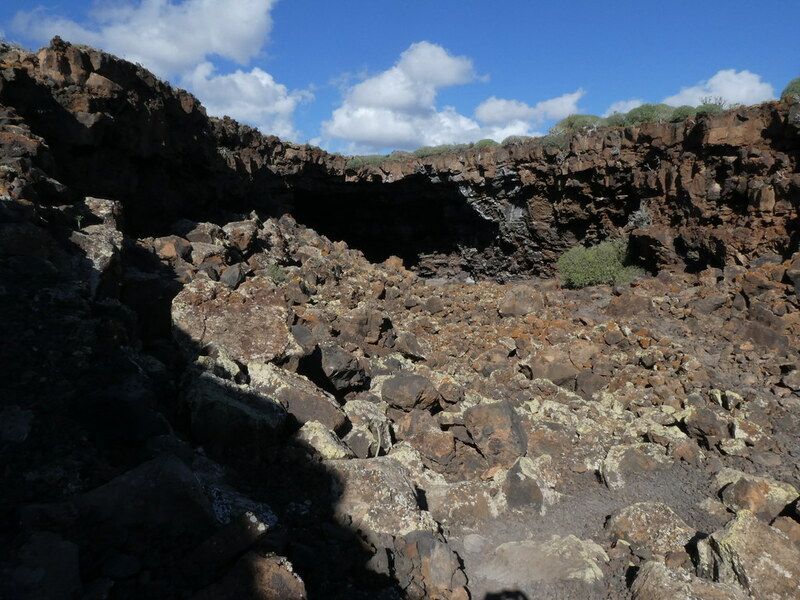 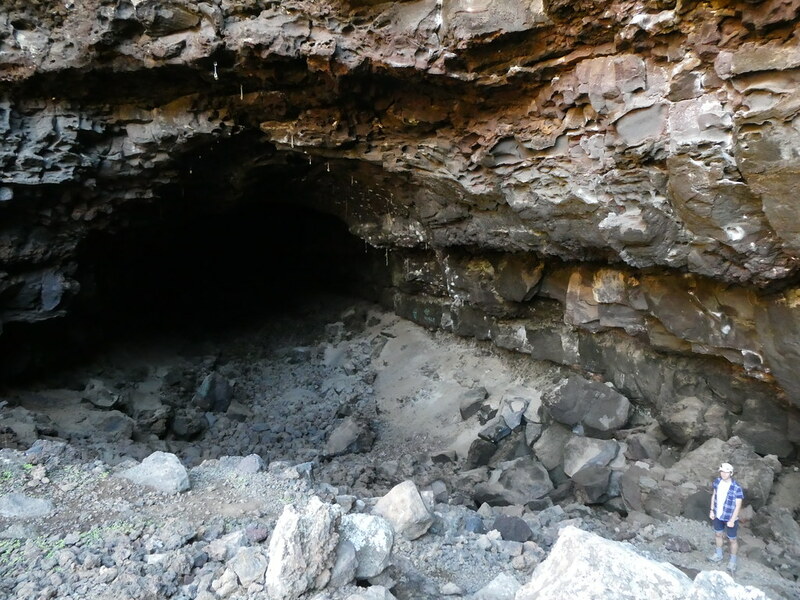 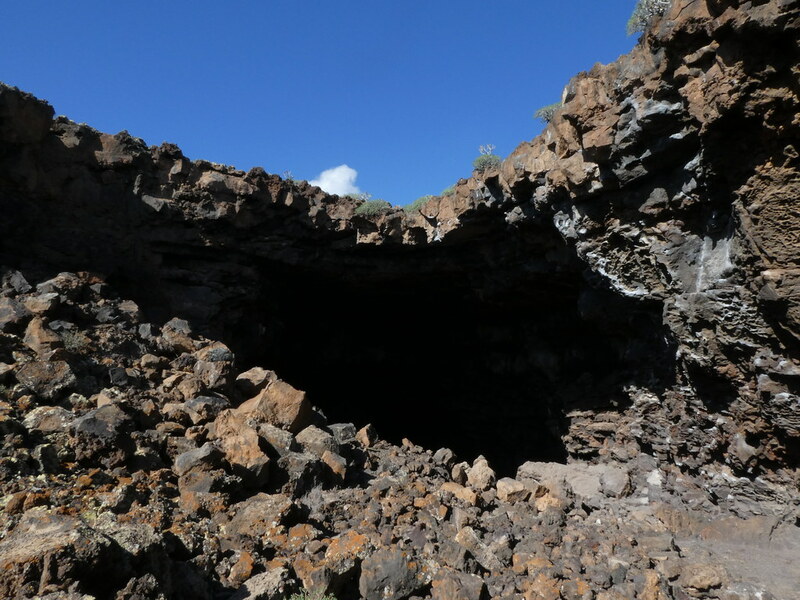 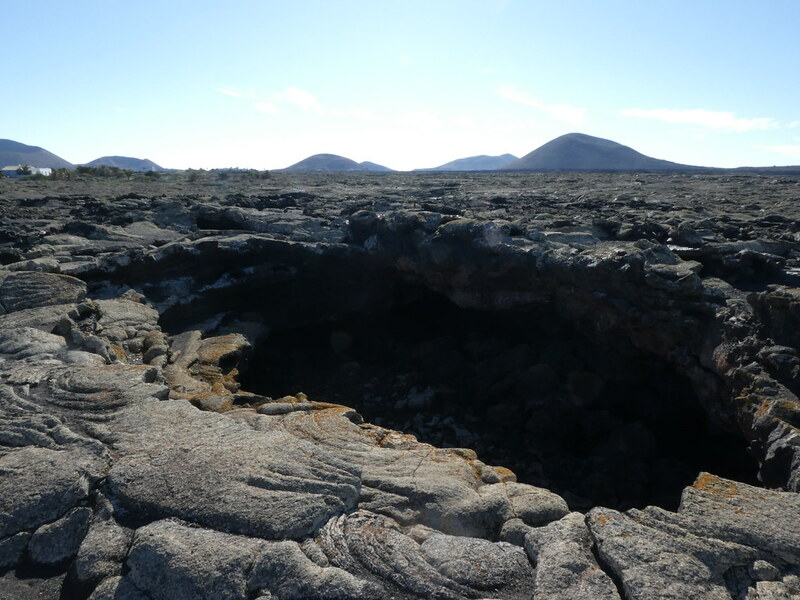 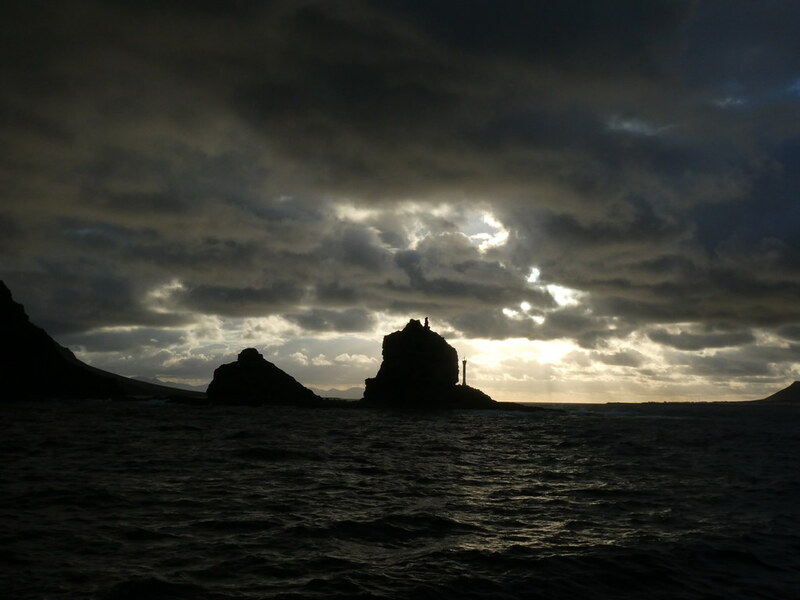 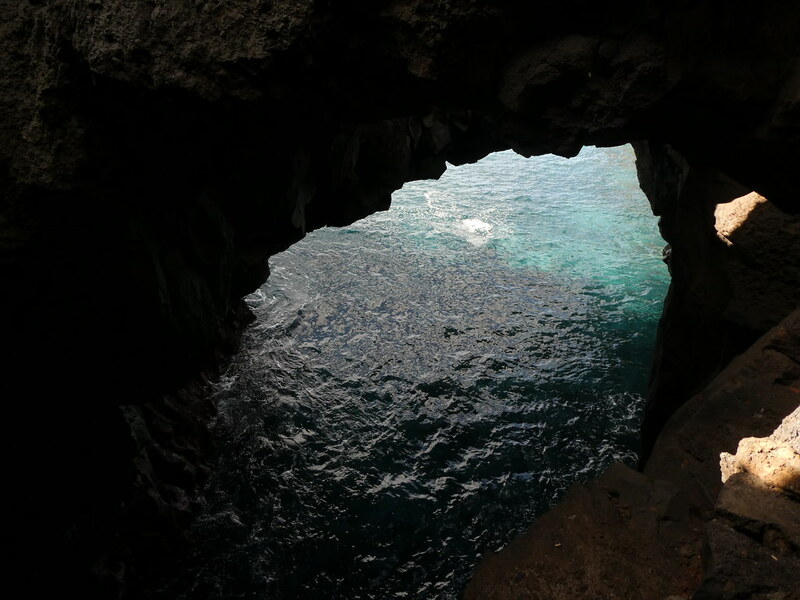 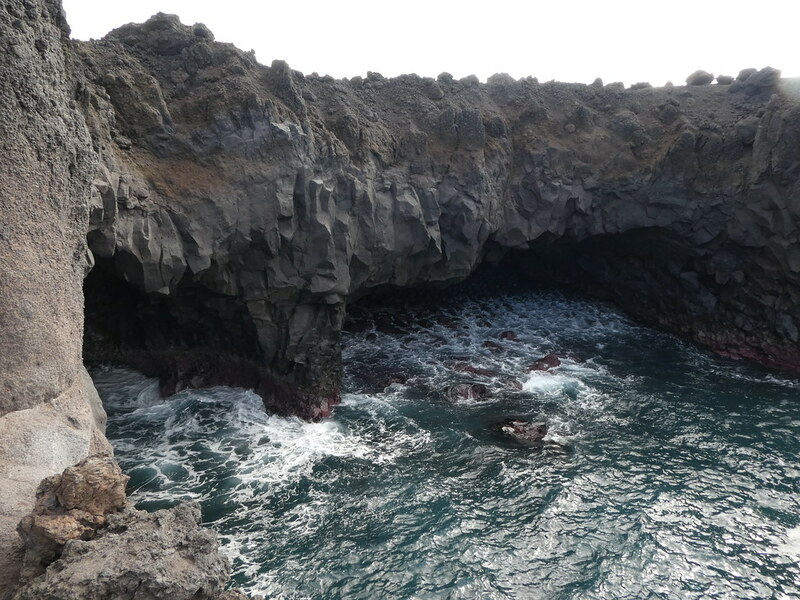 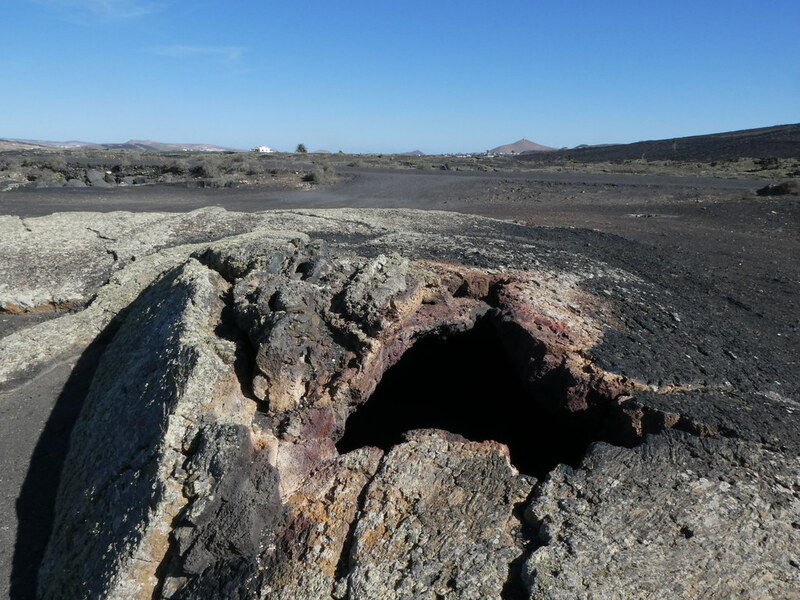 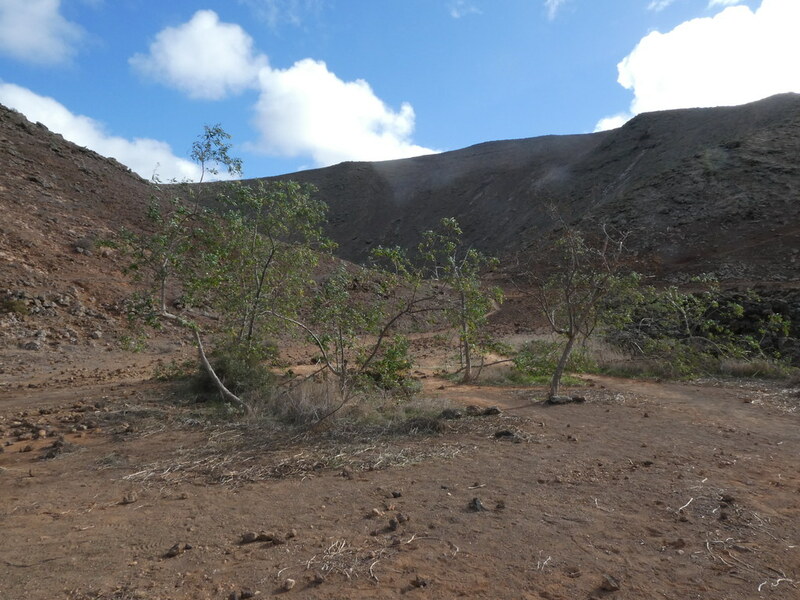 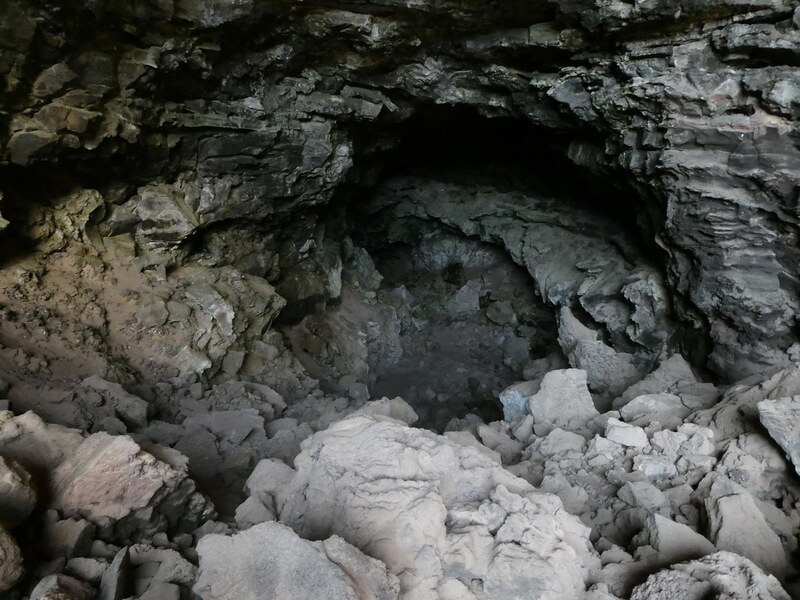 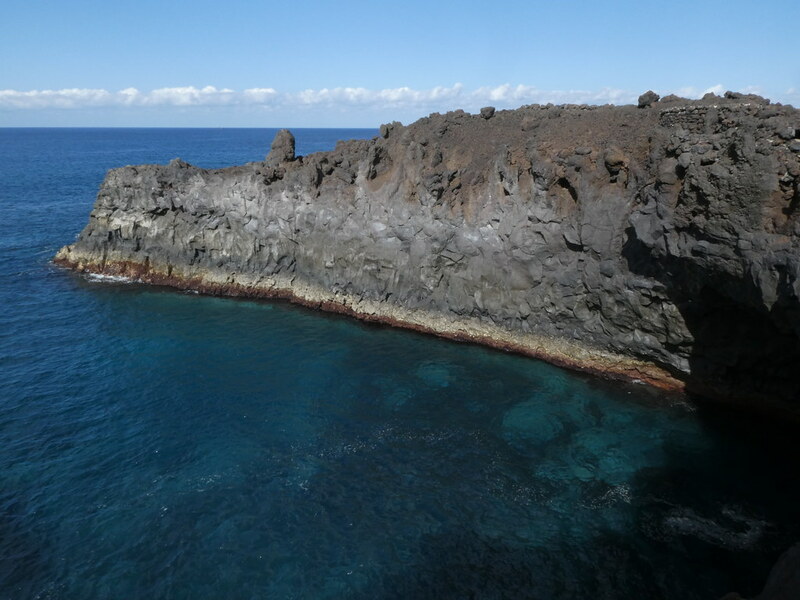 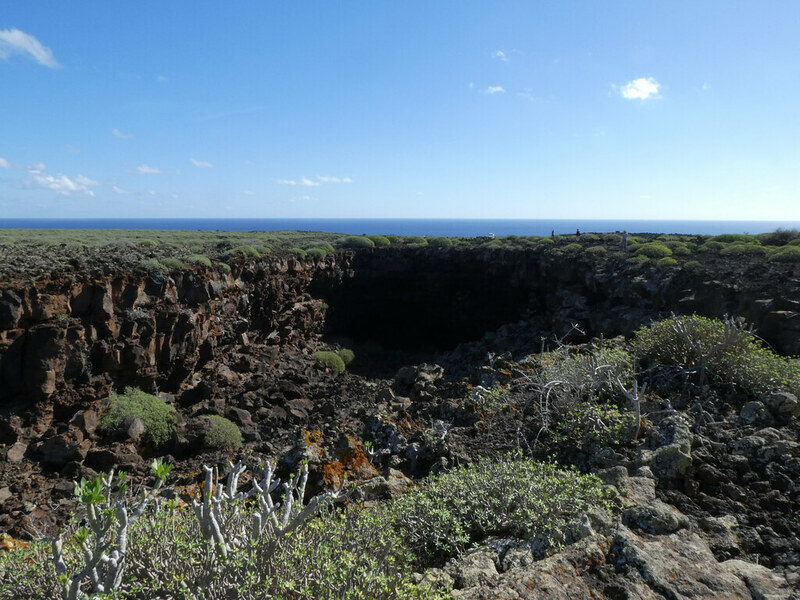 As the lava slowly tumbled in to the sea it created a network of caves and blow-holes. 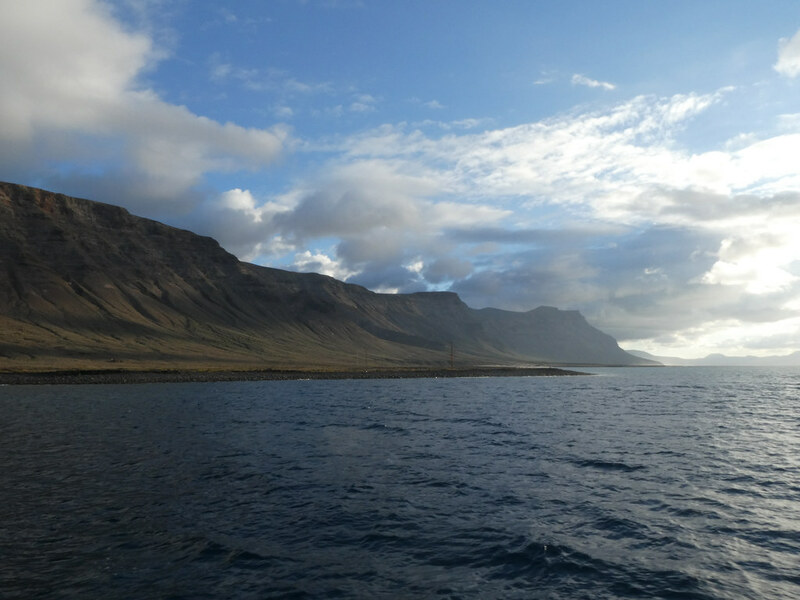 A short route and short drive gives time to pack in some more activity. 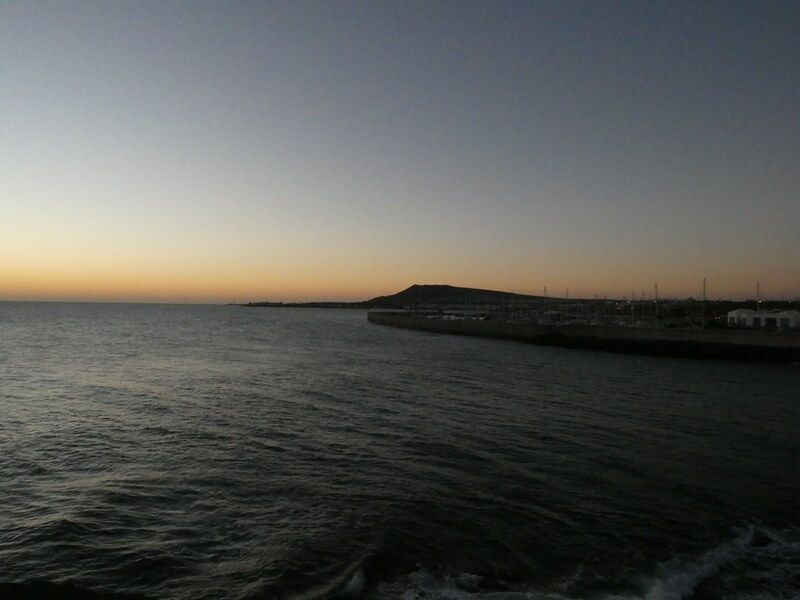 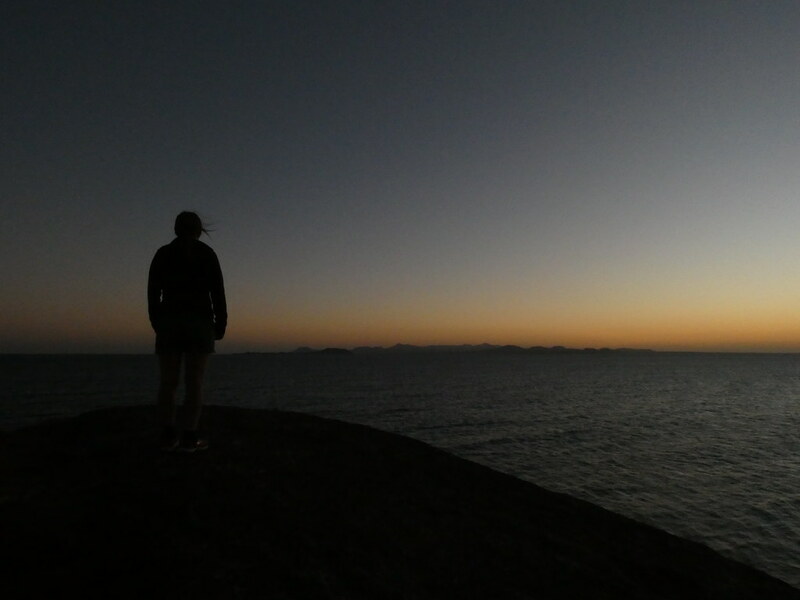 Nothing better than finishing off a day in the mountains with a stroll along the coast.